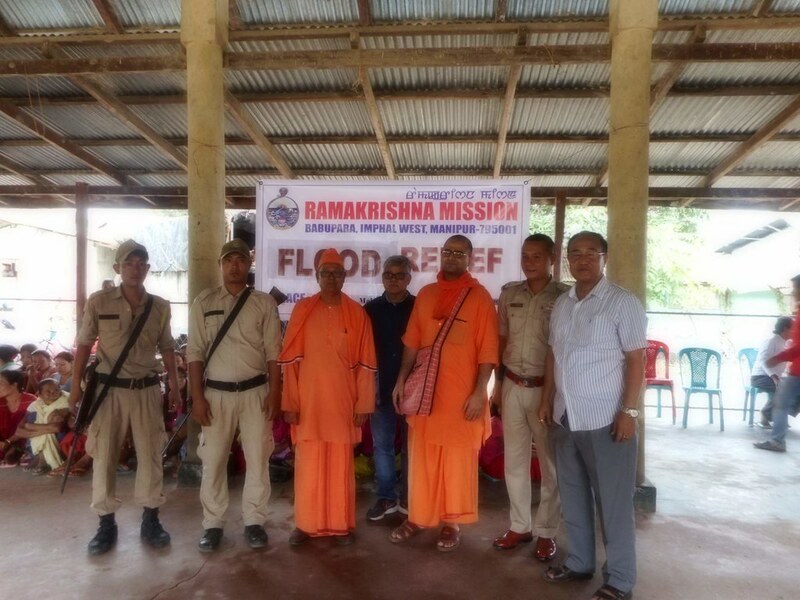 Due to recent torrential rains and unfortunate breaching of river banks at several places, many areas of Imphal valley got flooded. 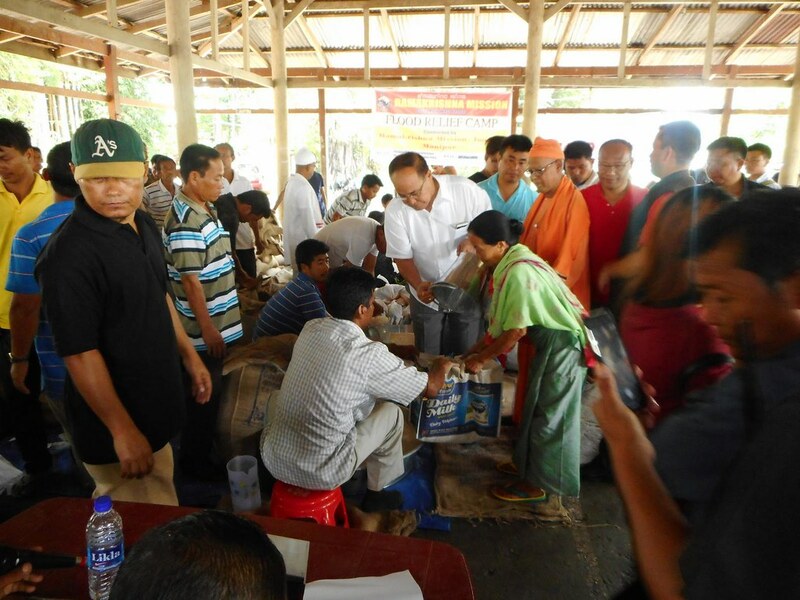 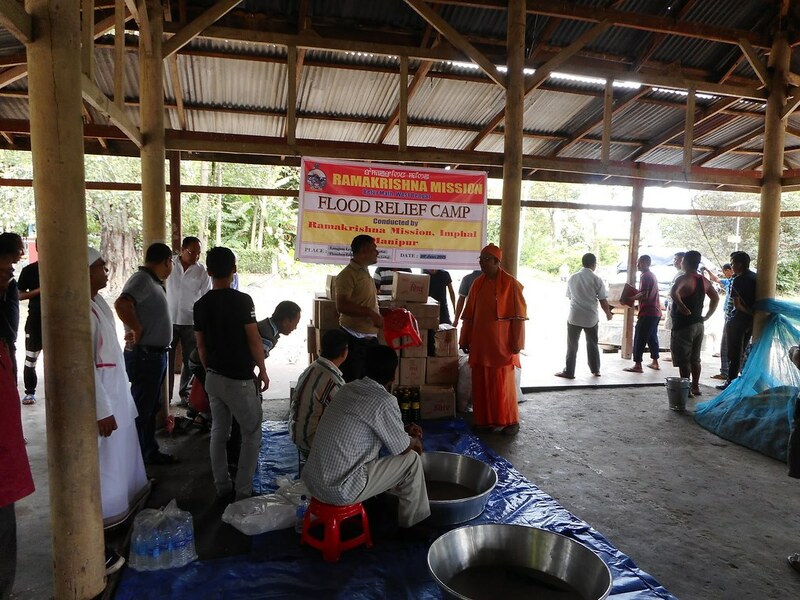 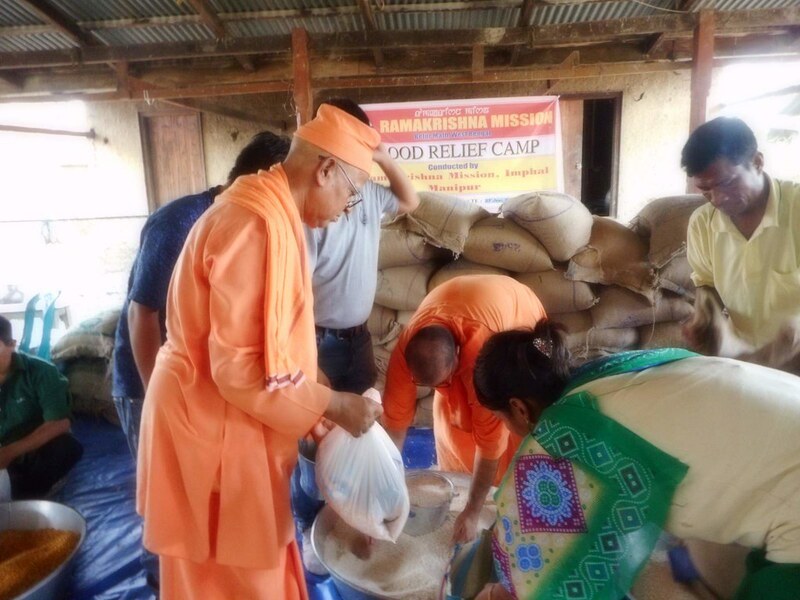 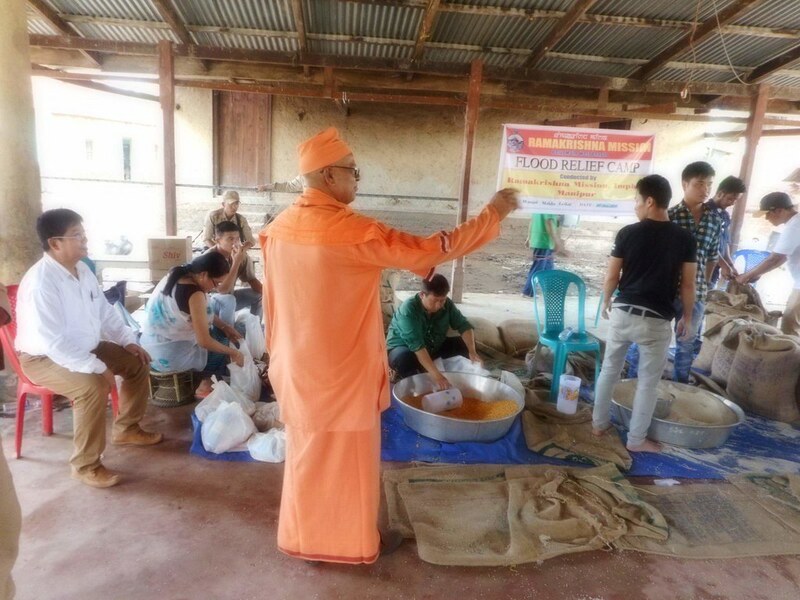 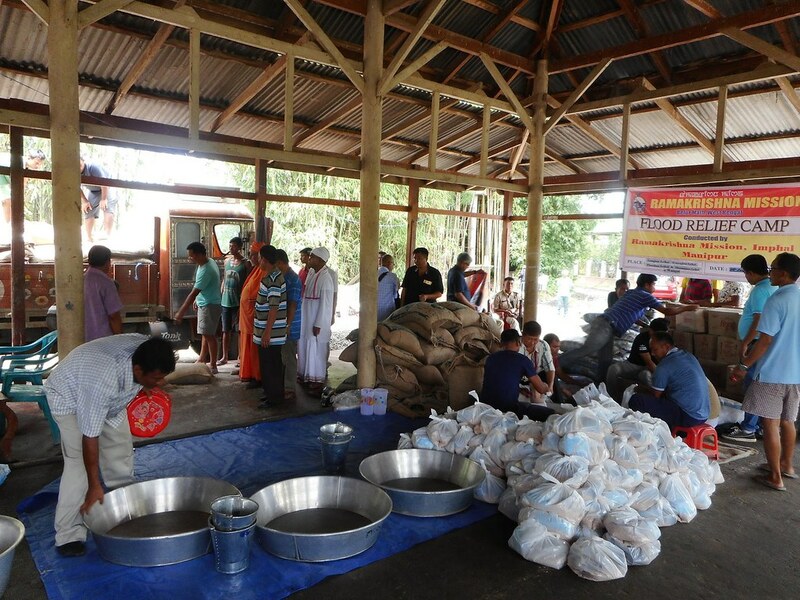 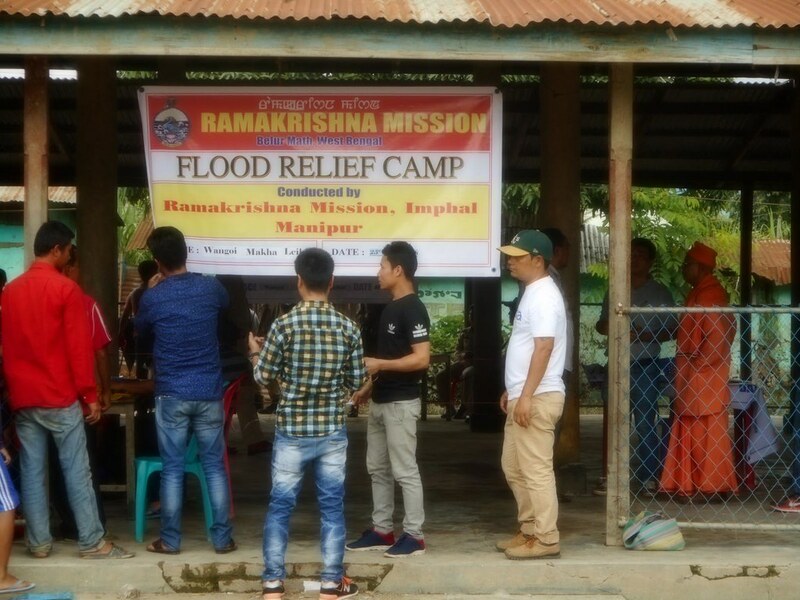 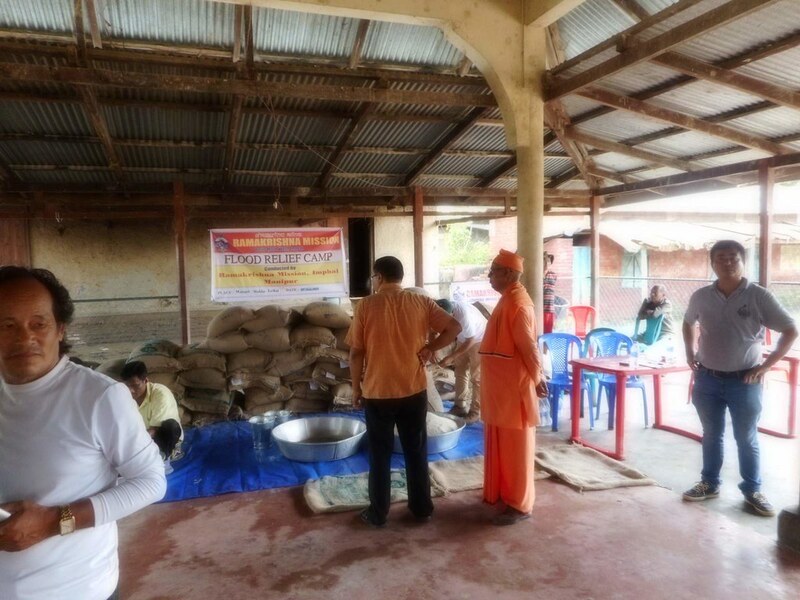 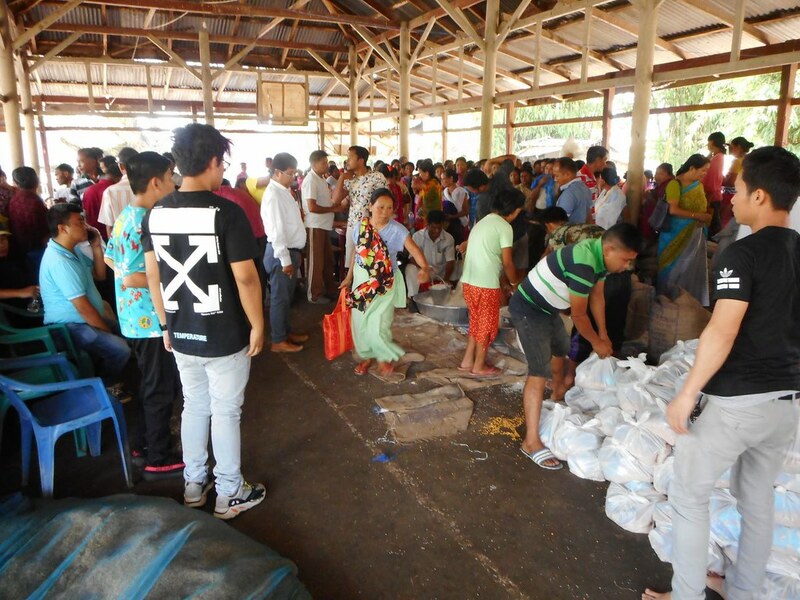 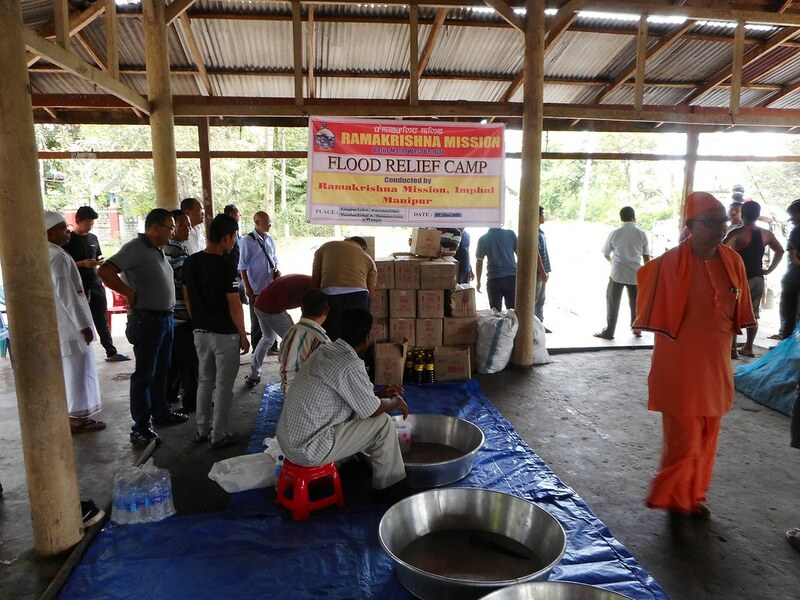 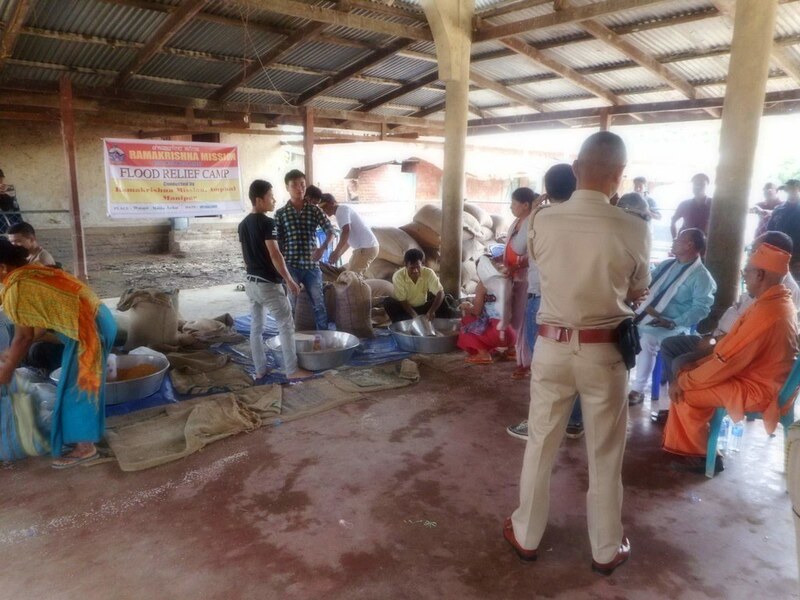 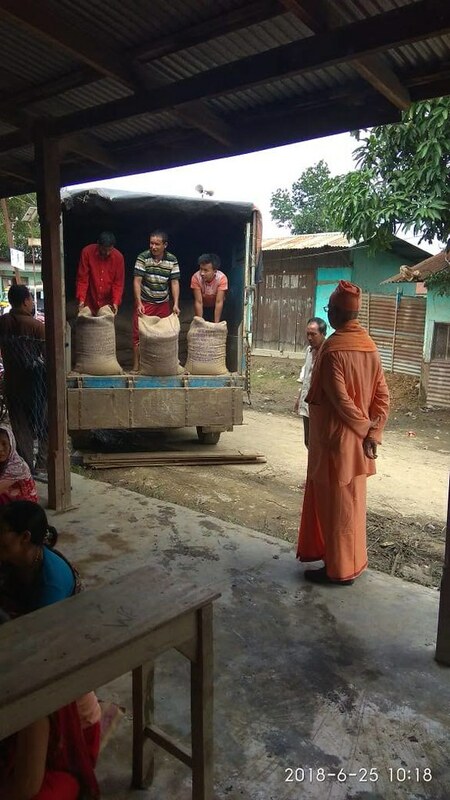 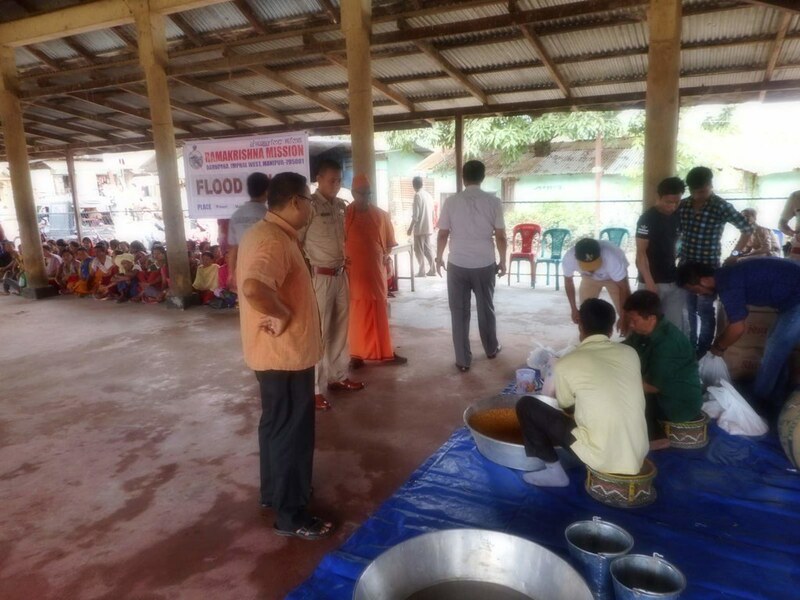 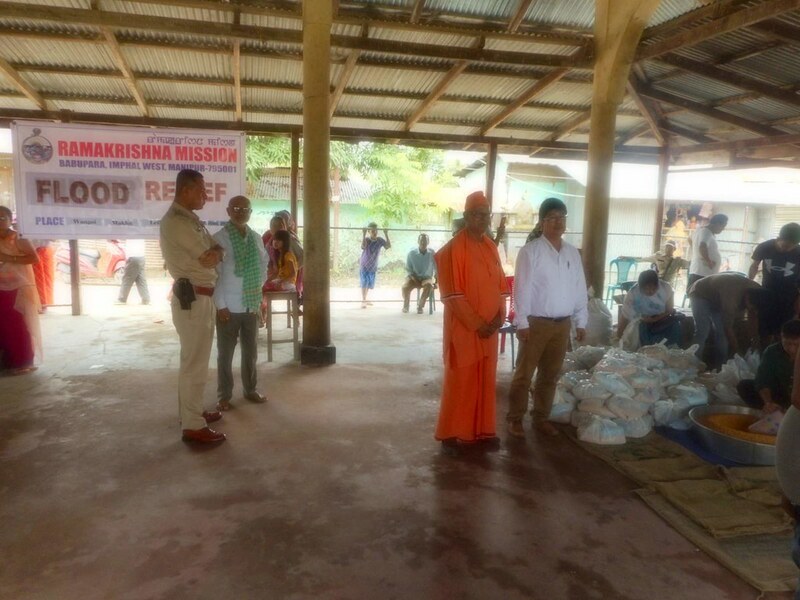 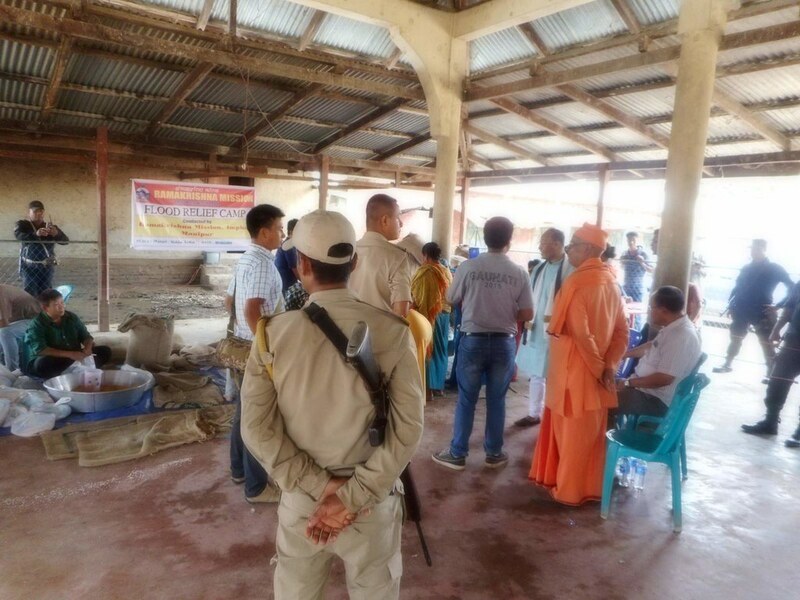 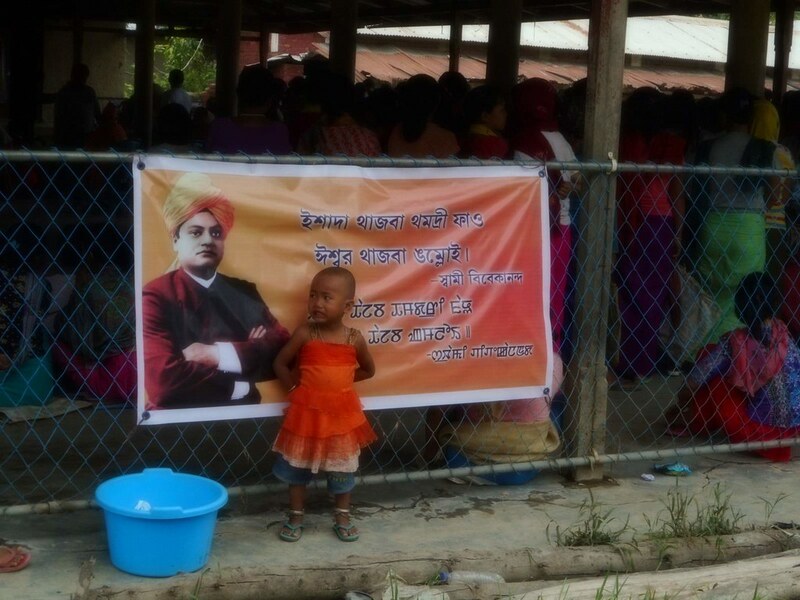 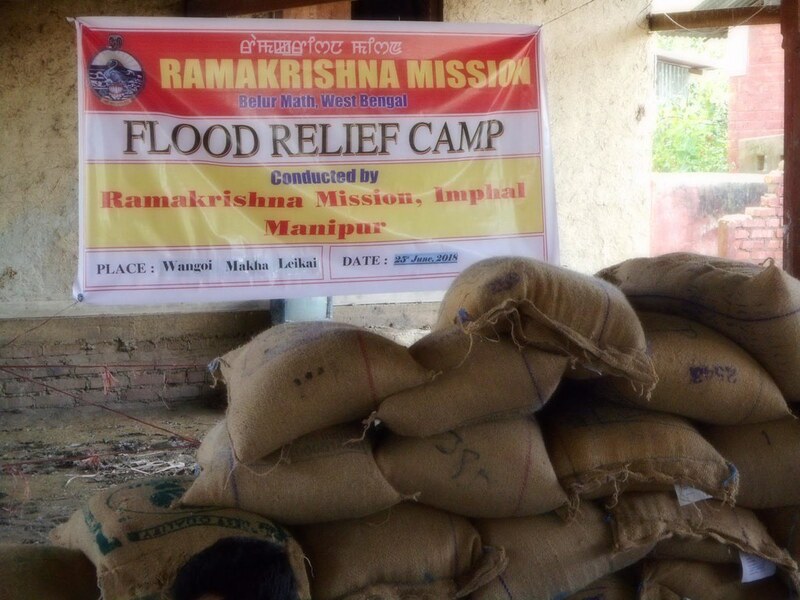 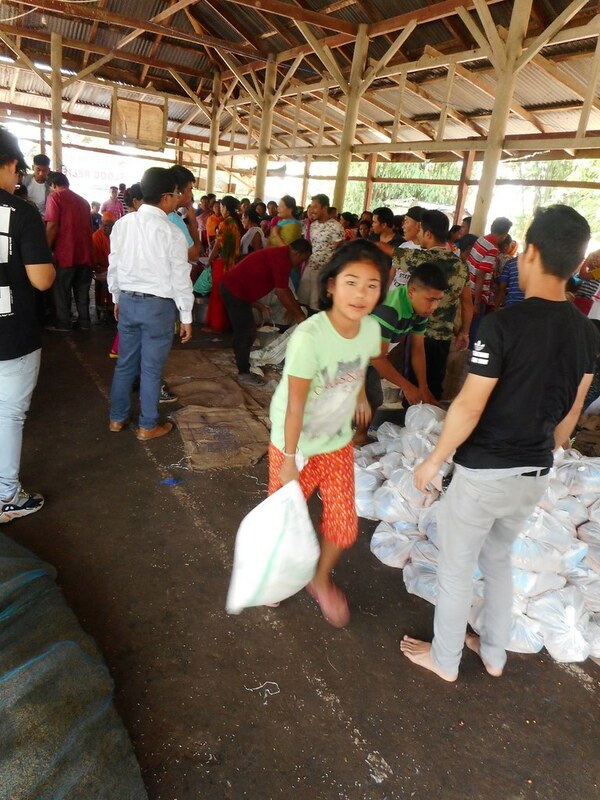 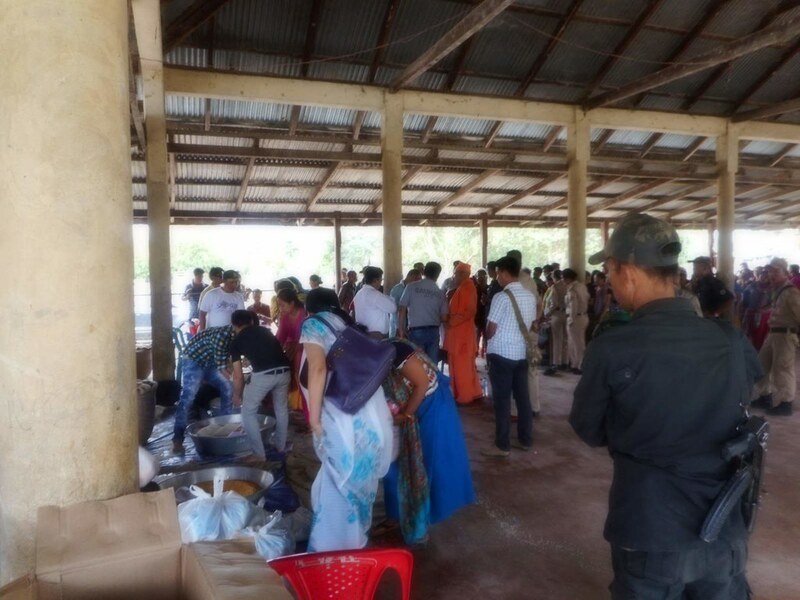 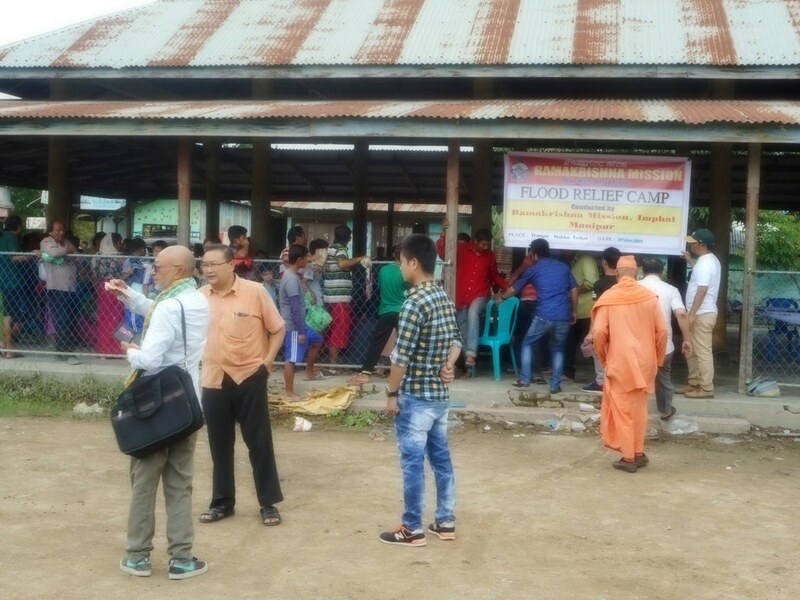 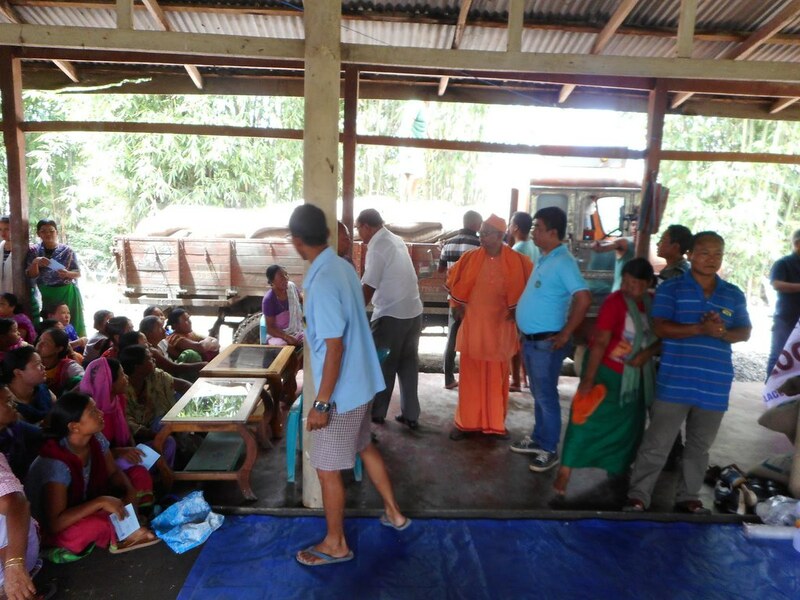 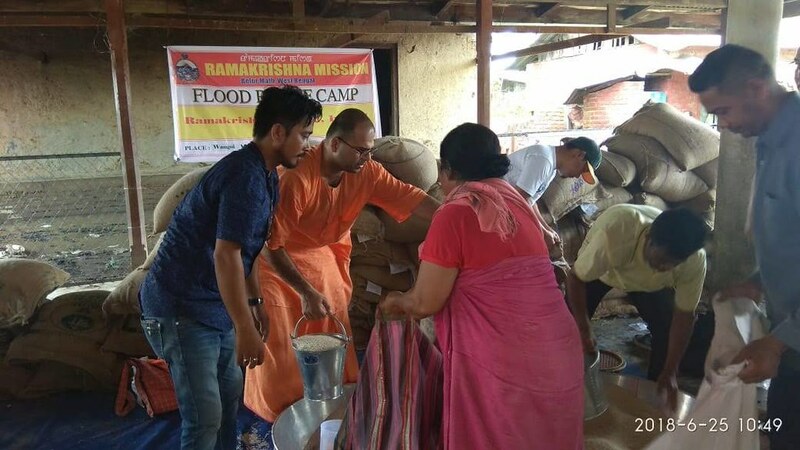 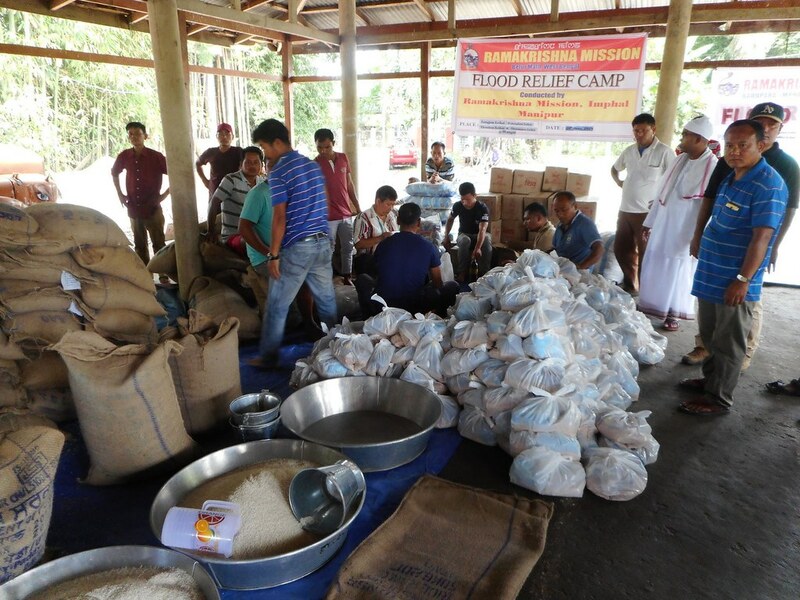 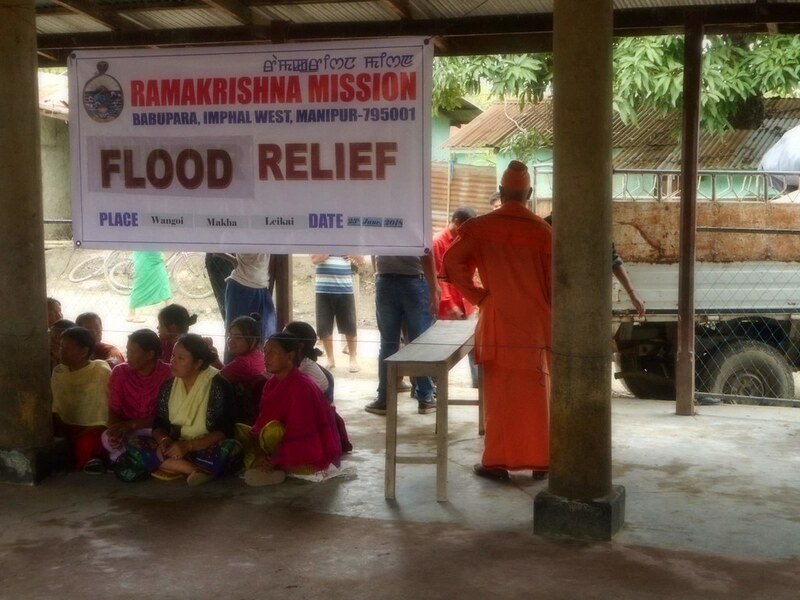 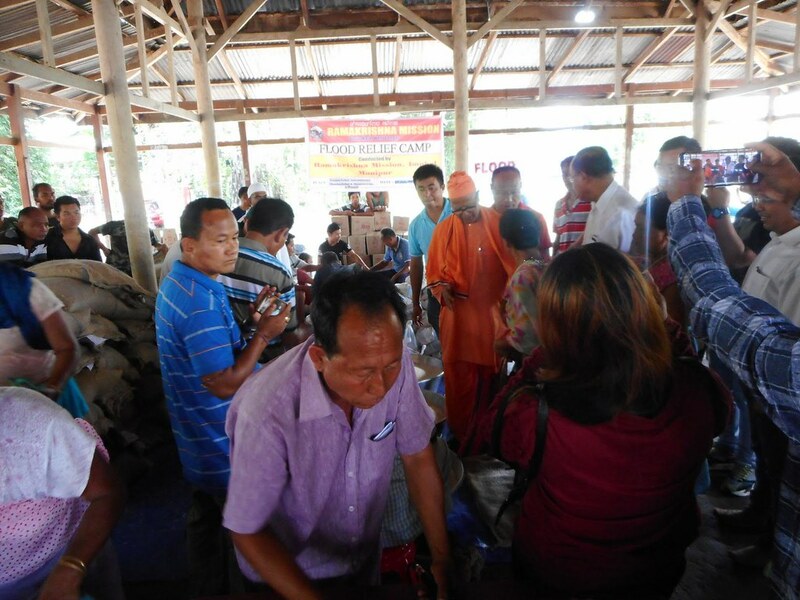 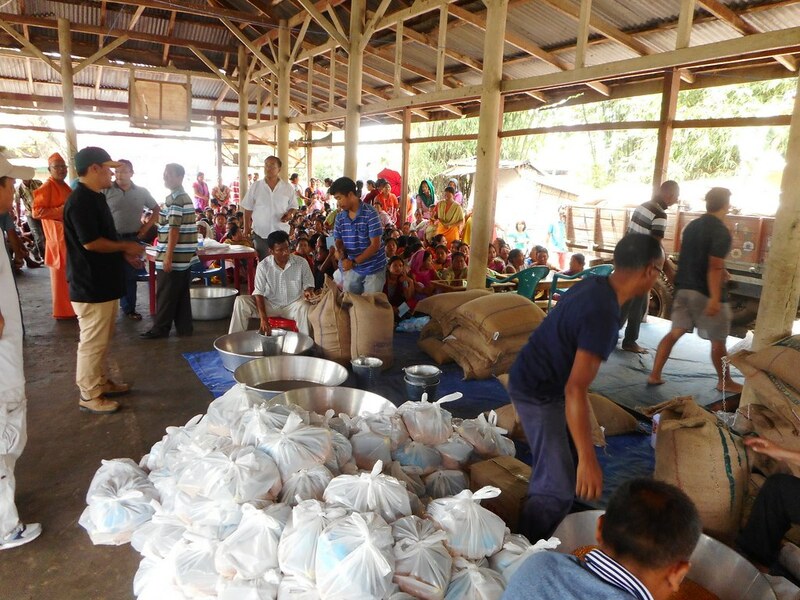 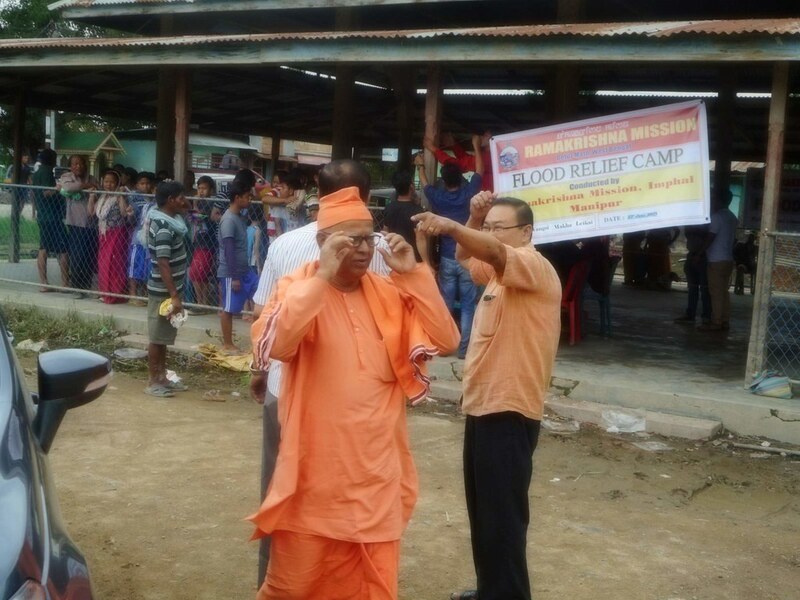 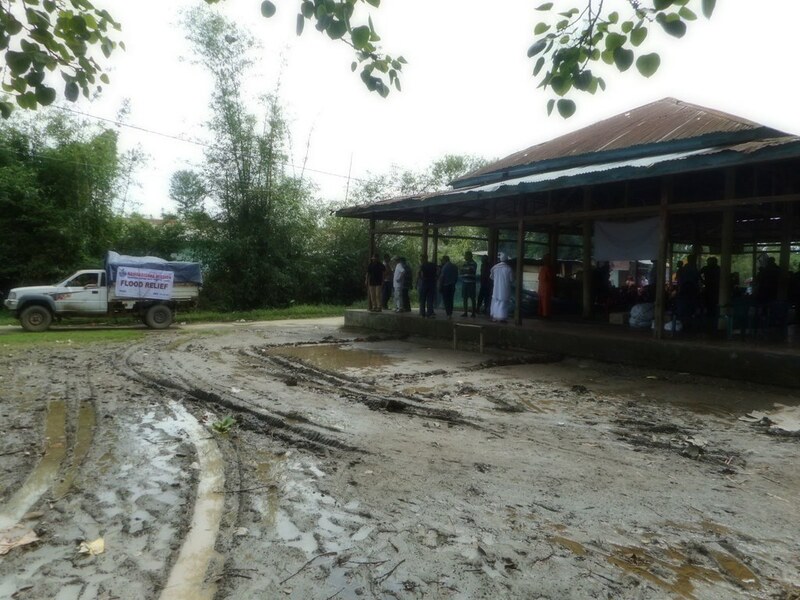 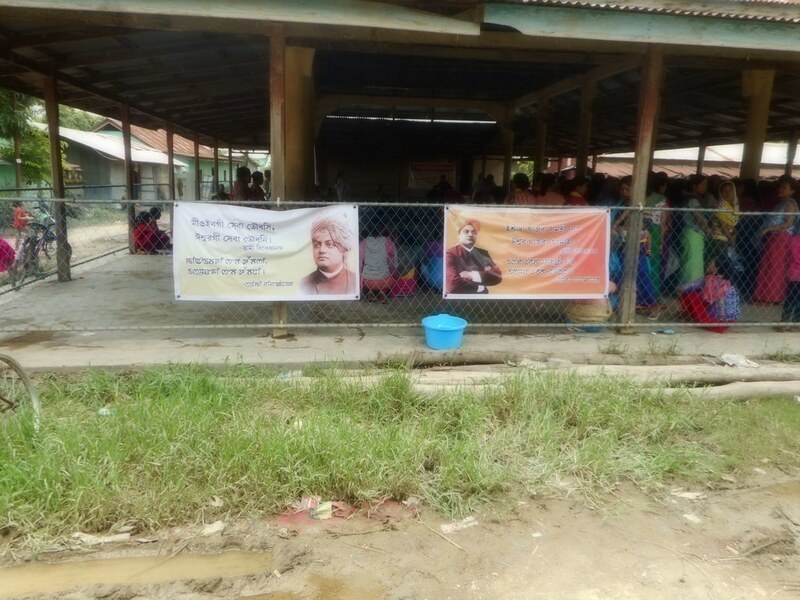 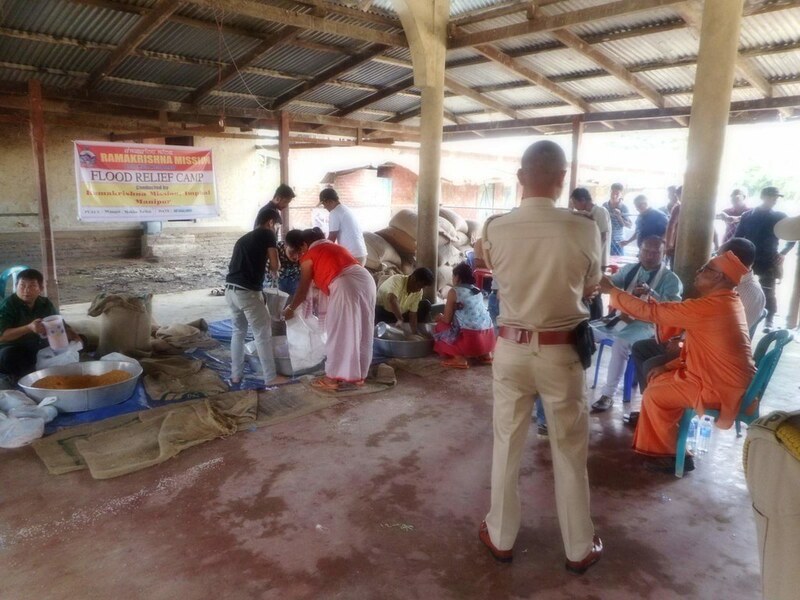 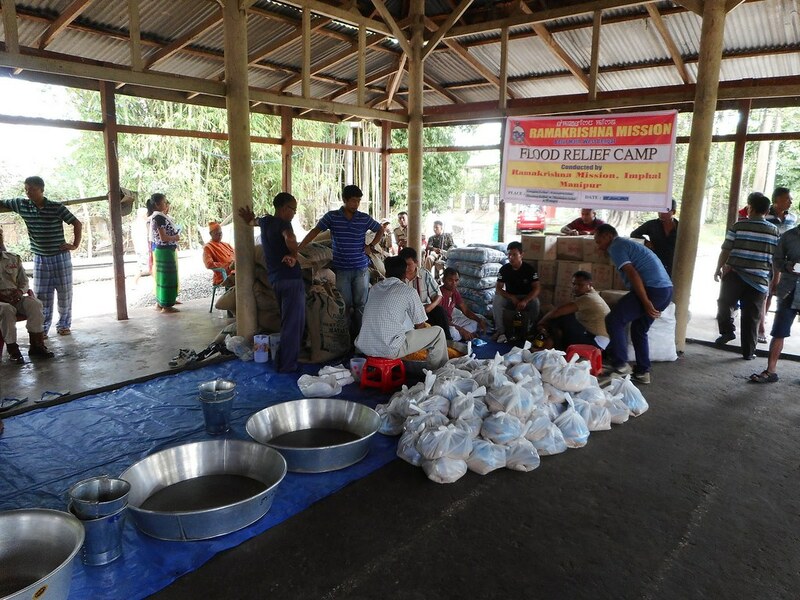 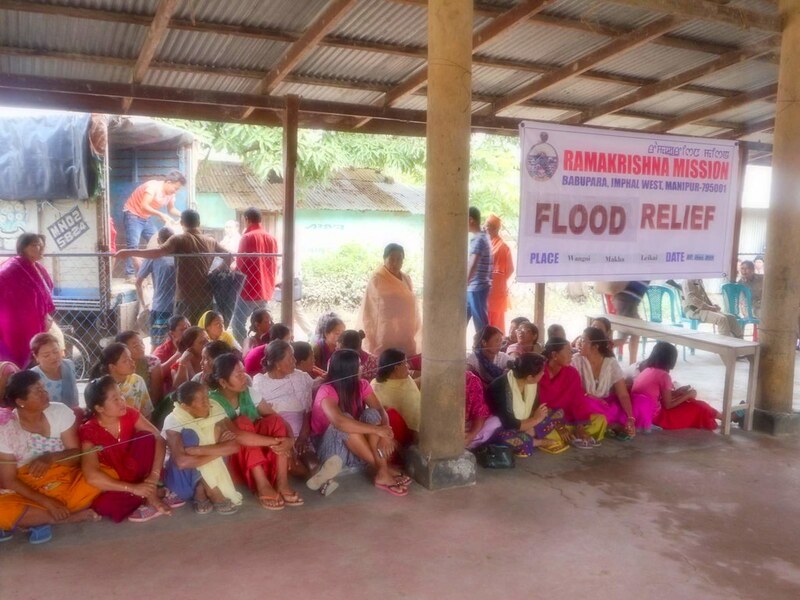 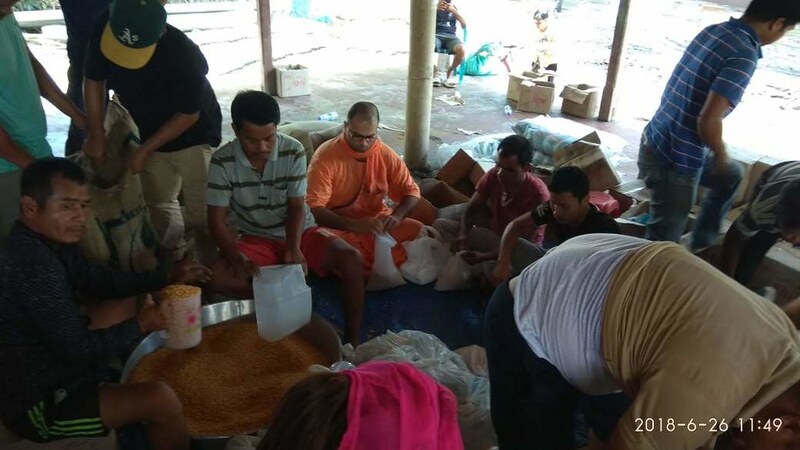 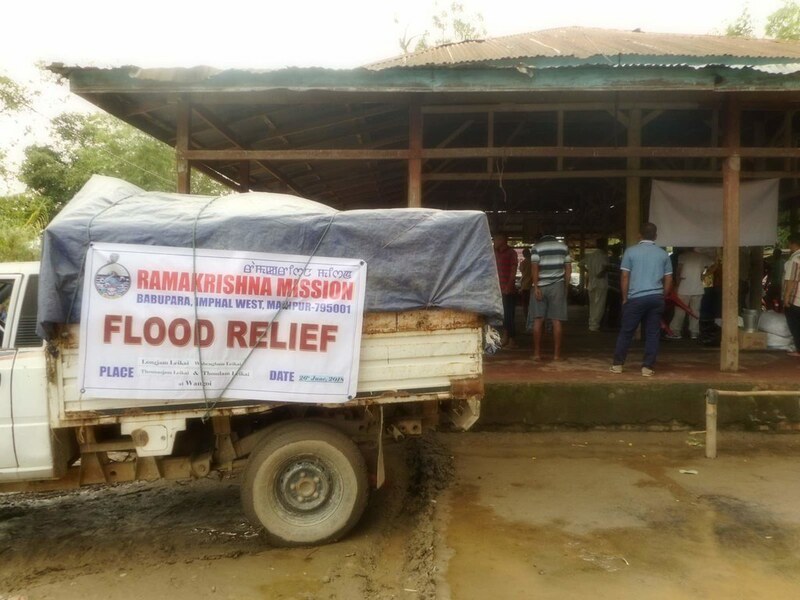 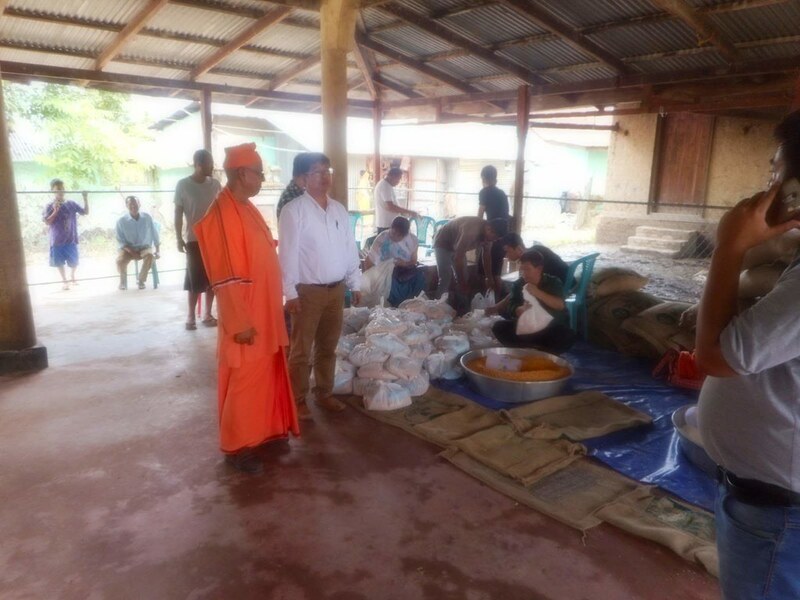 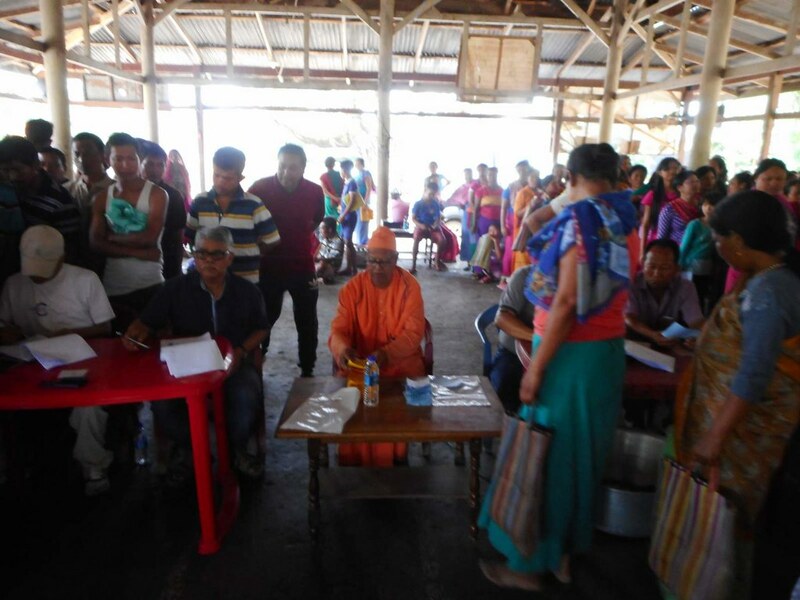 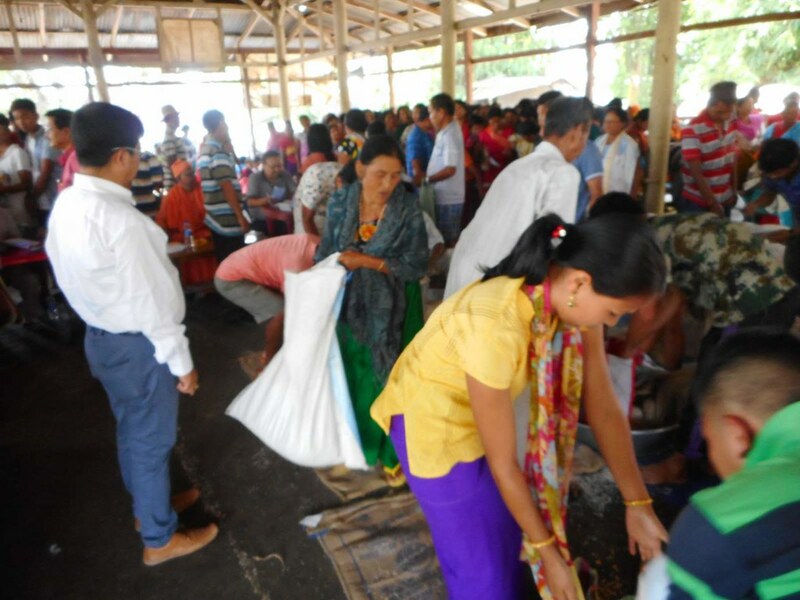 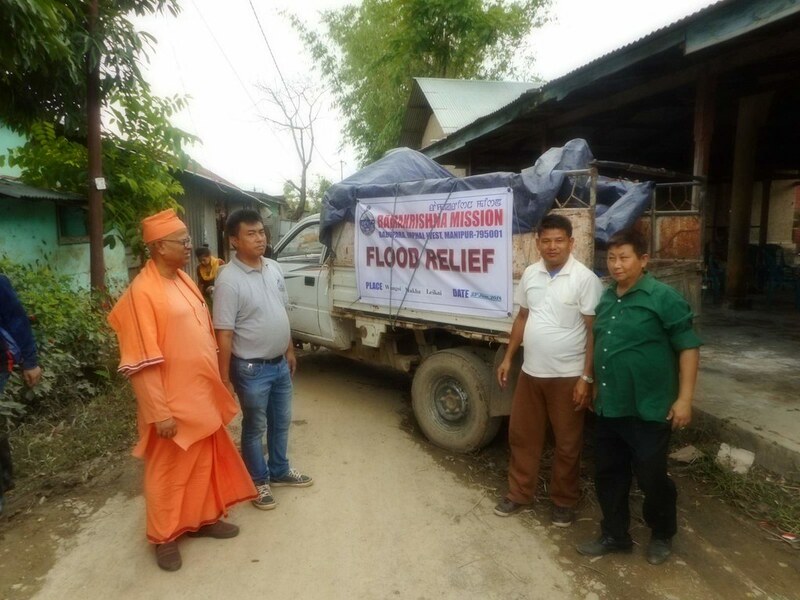 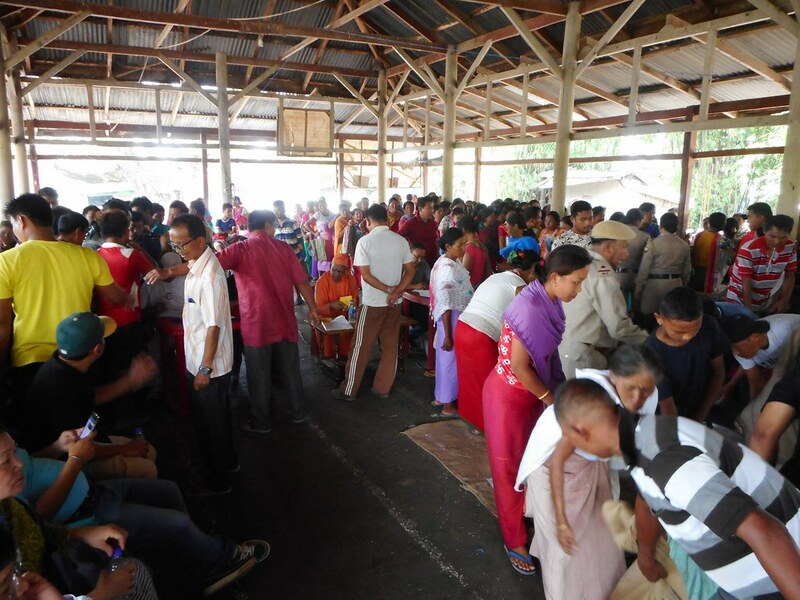 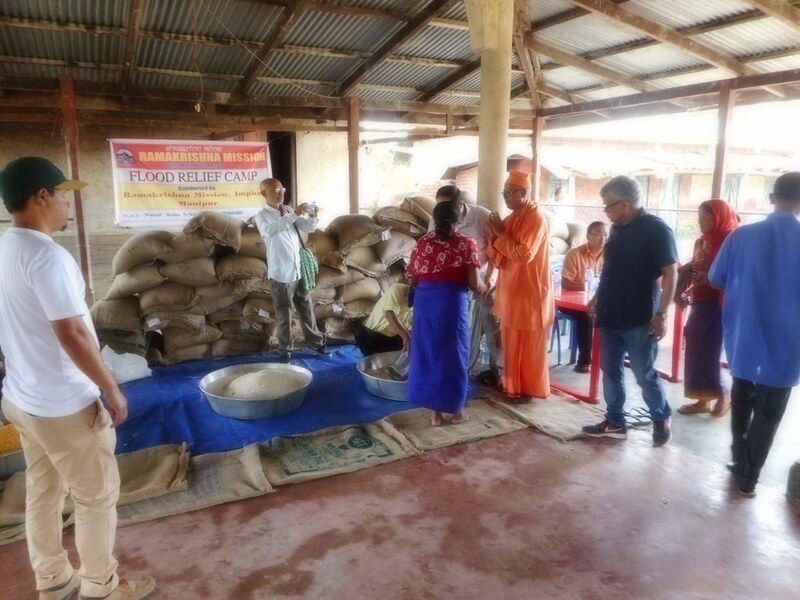 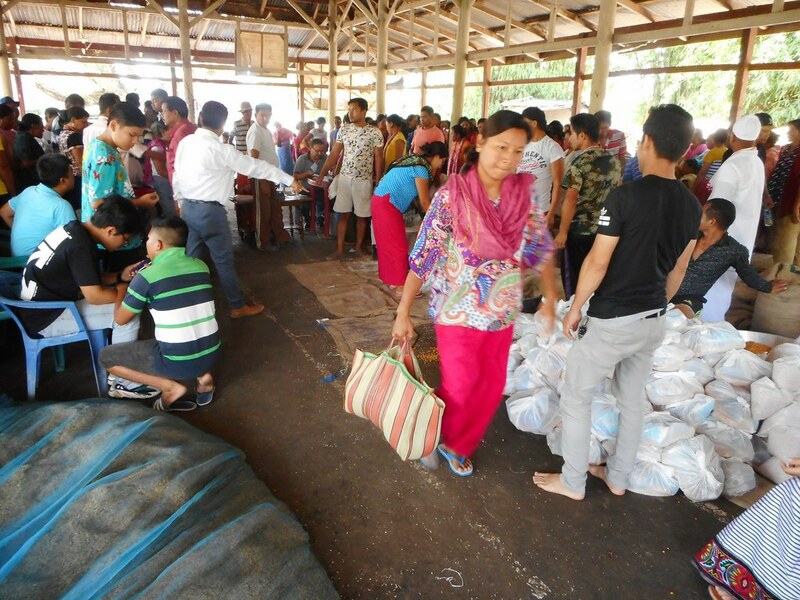 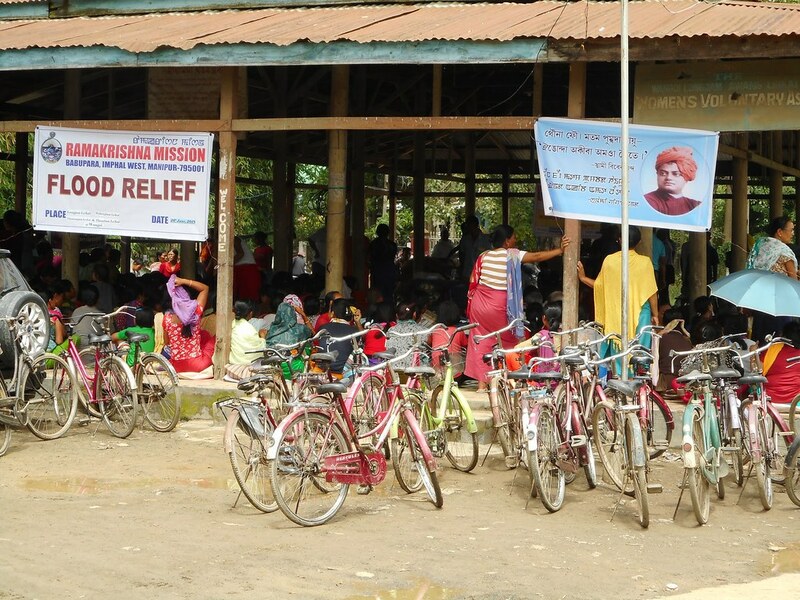 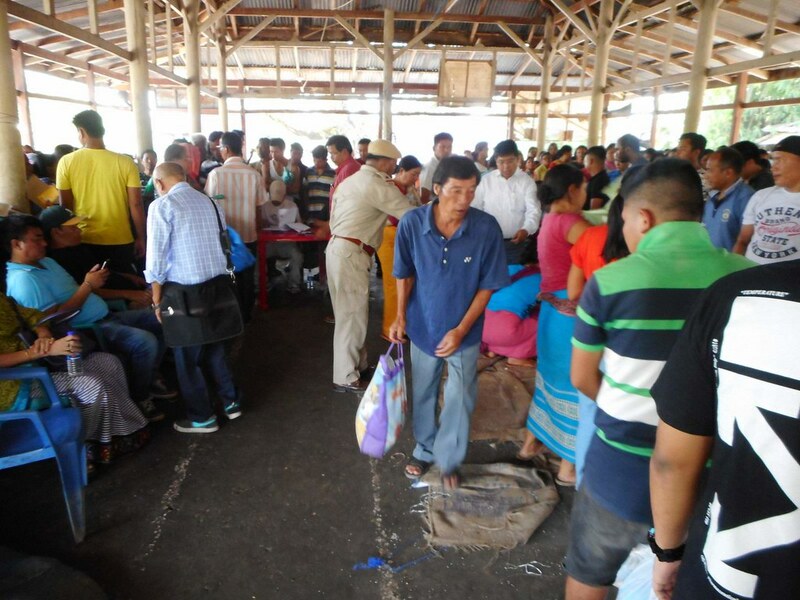 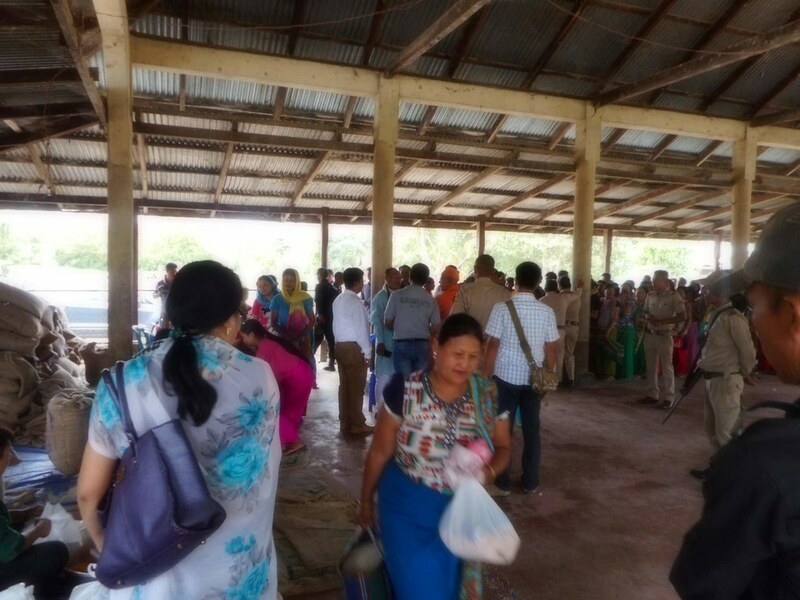 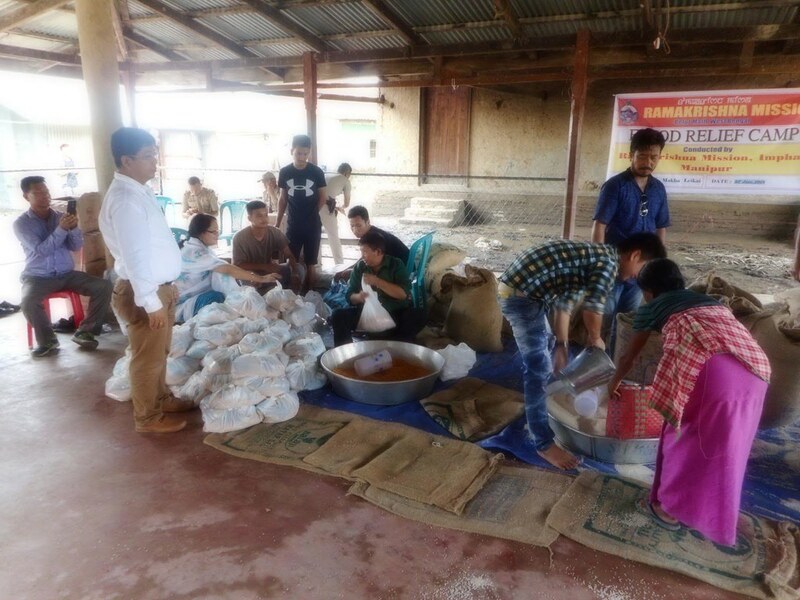 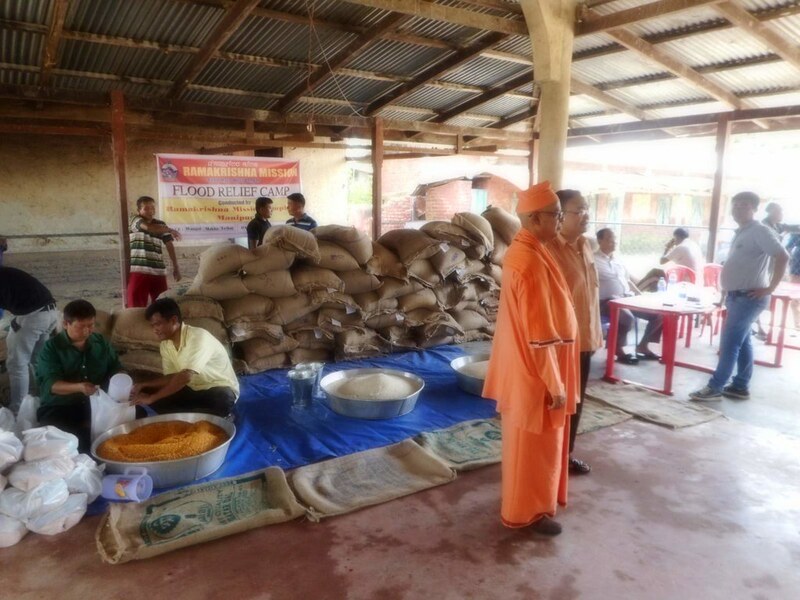 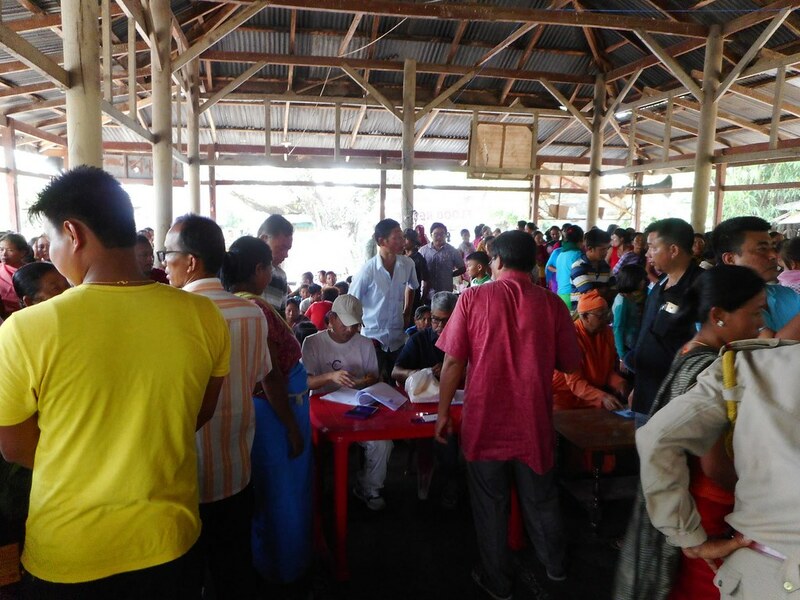 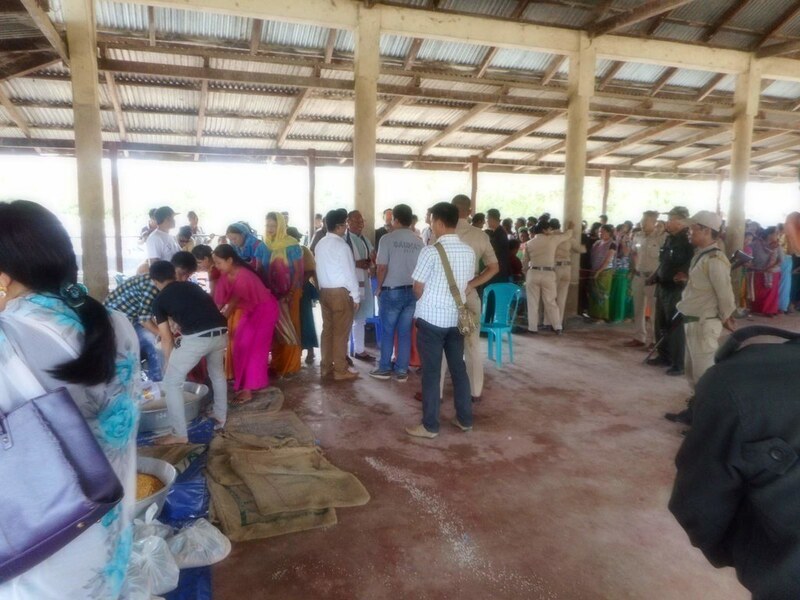 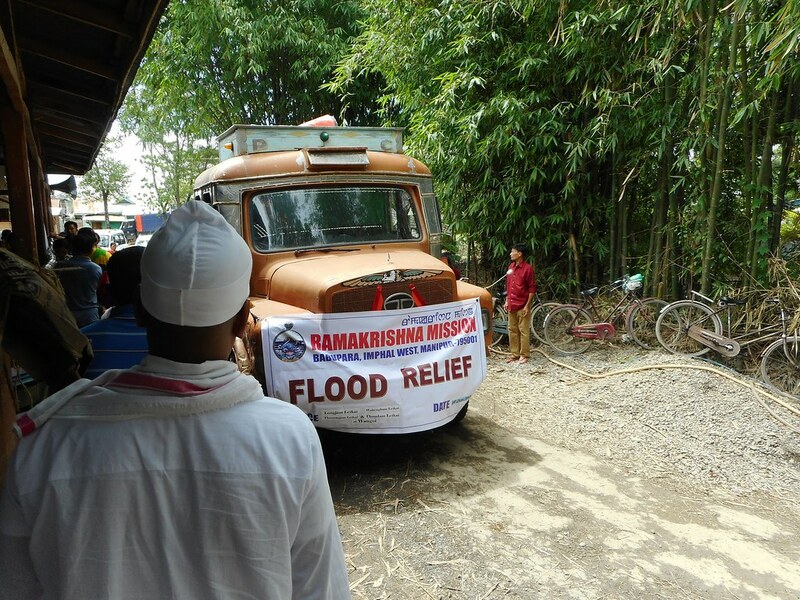 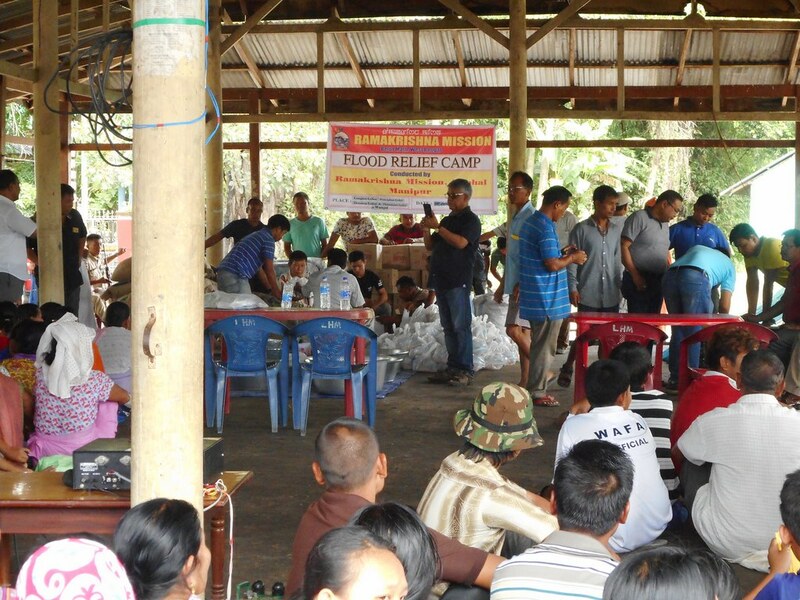 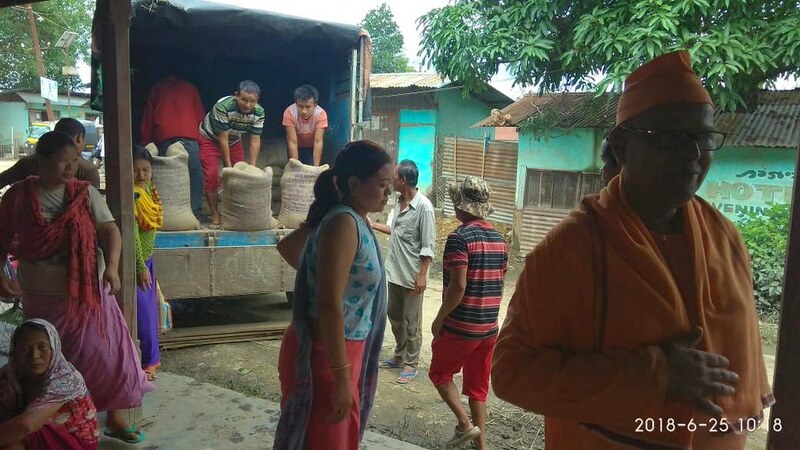 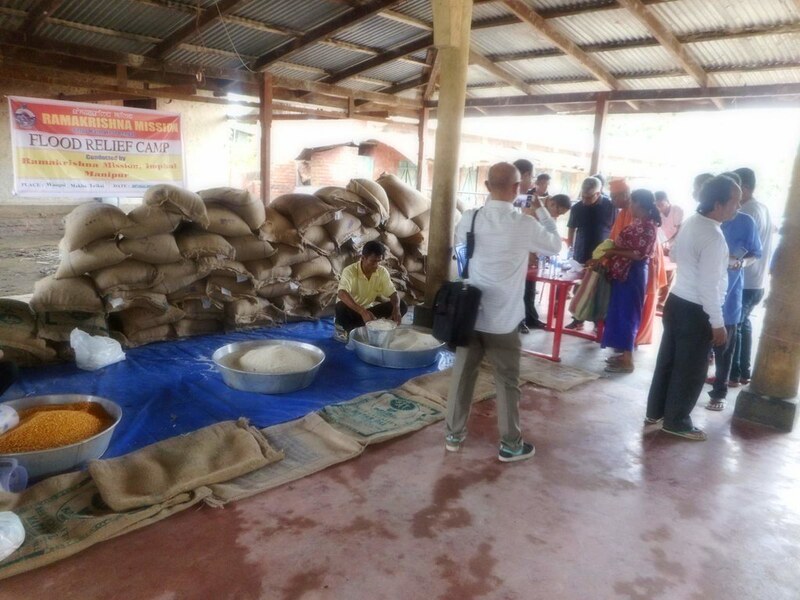 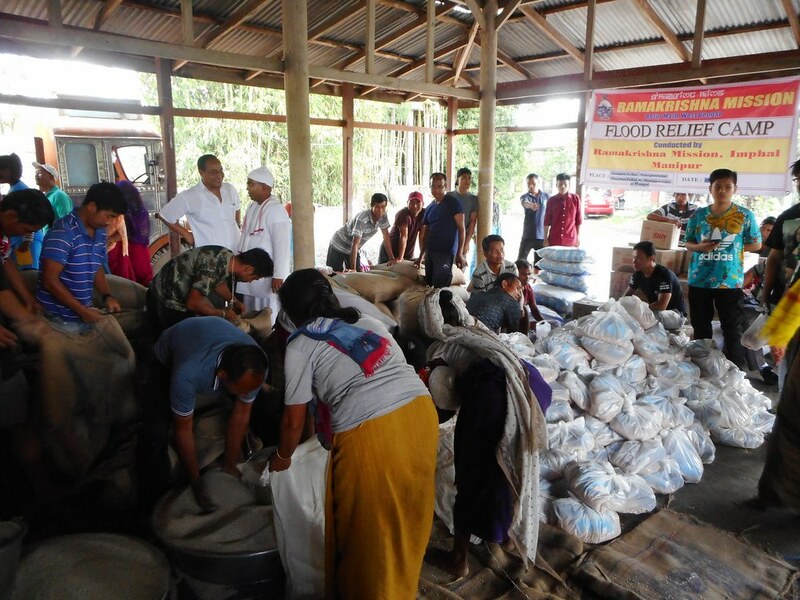 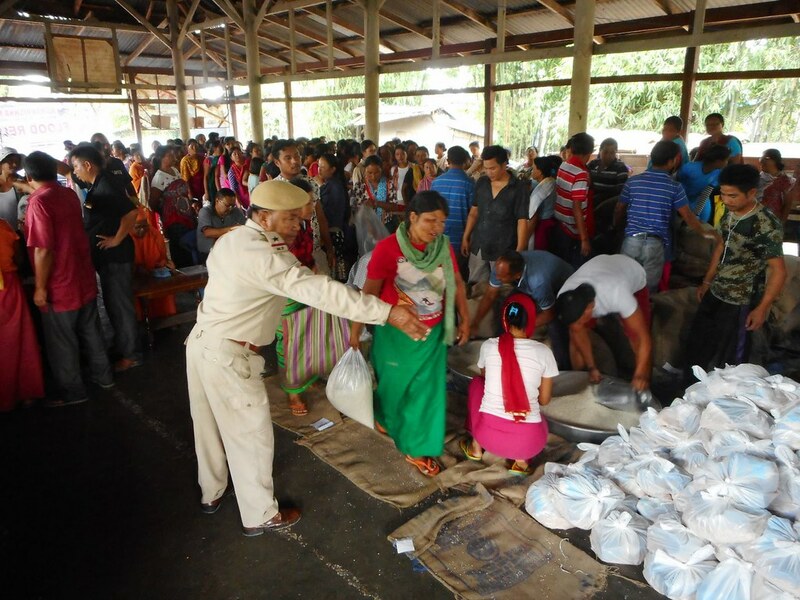 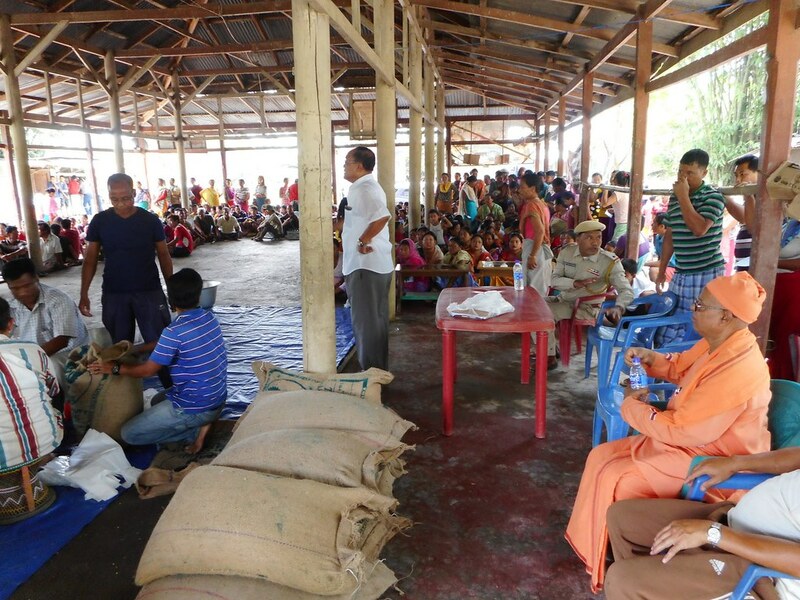 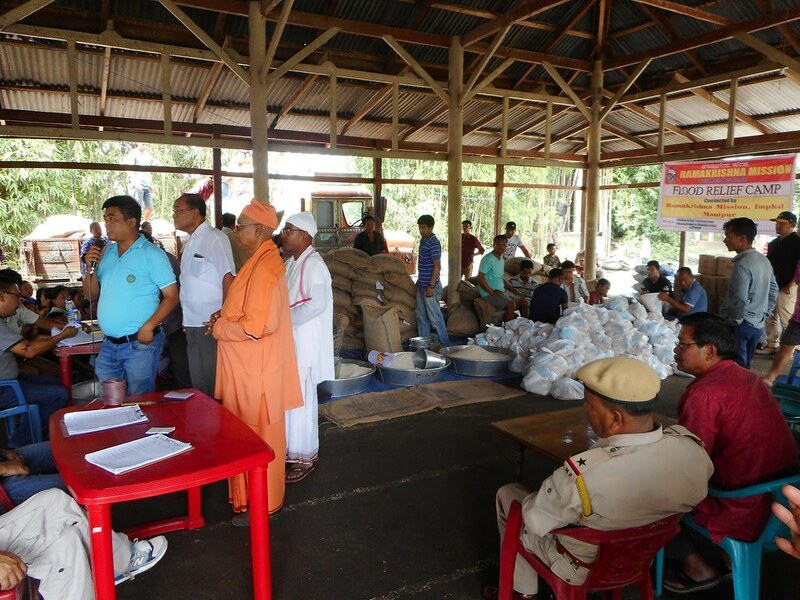 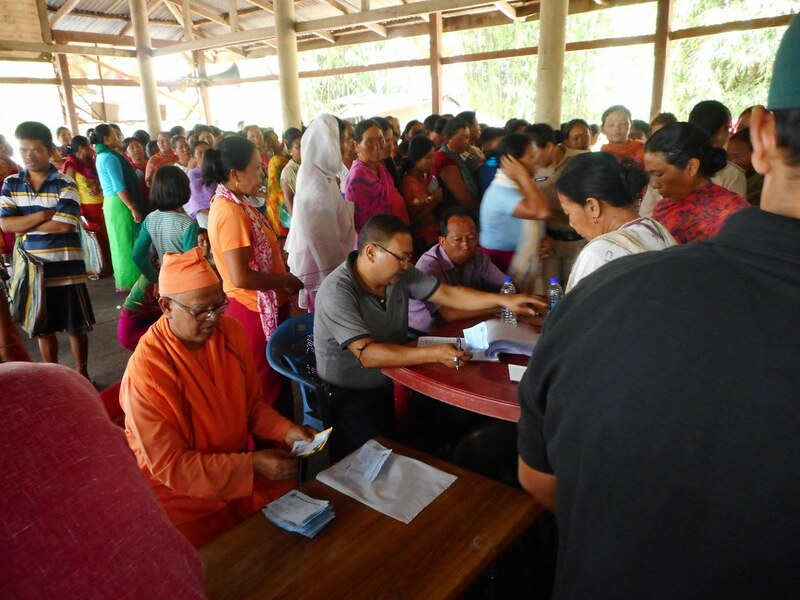 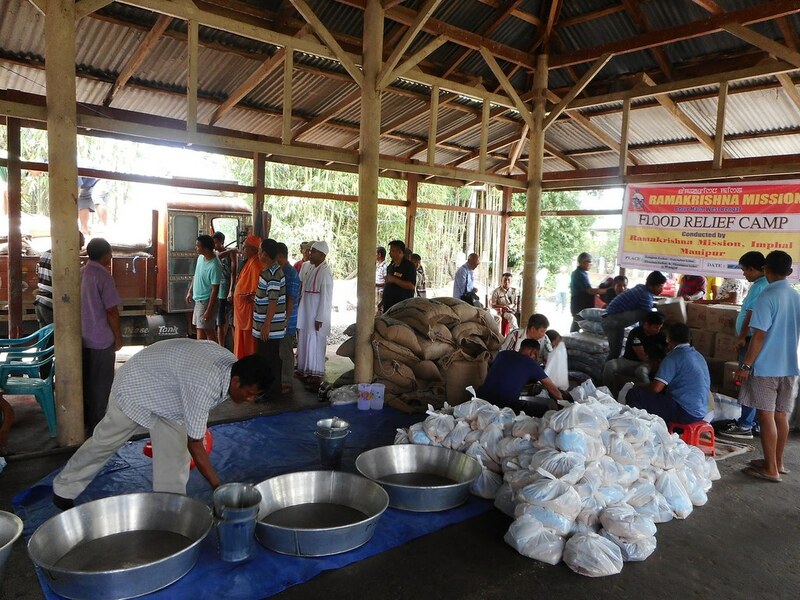 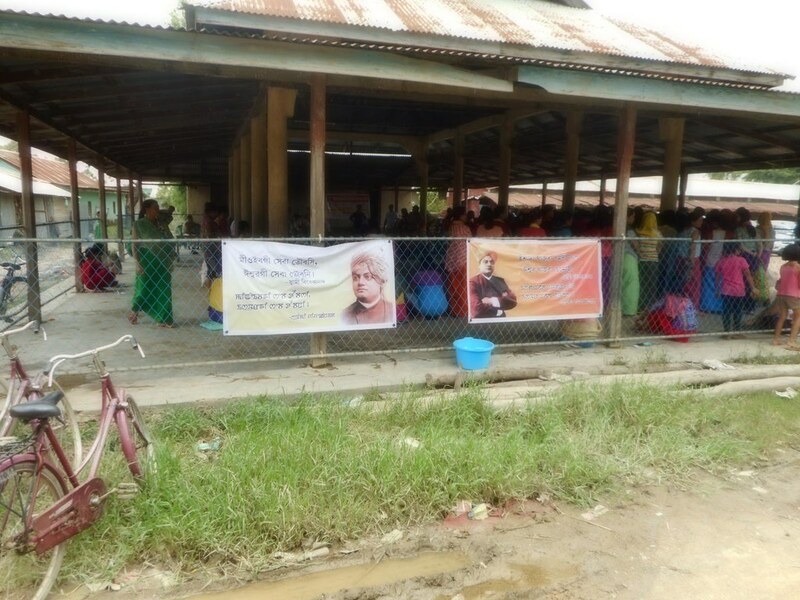 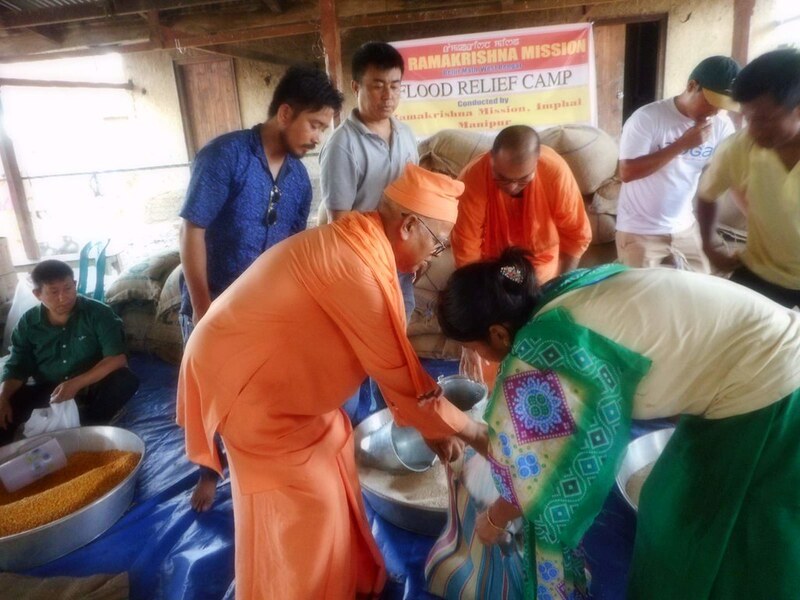 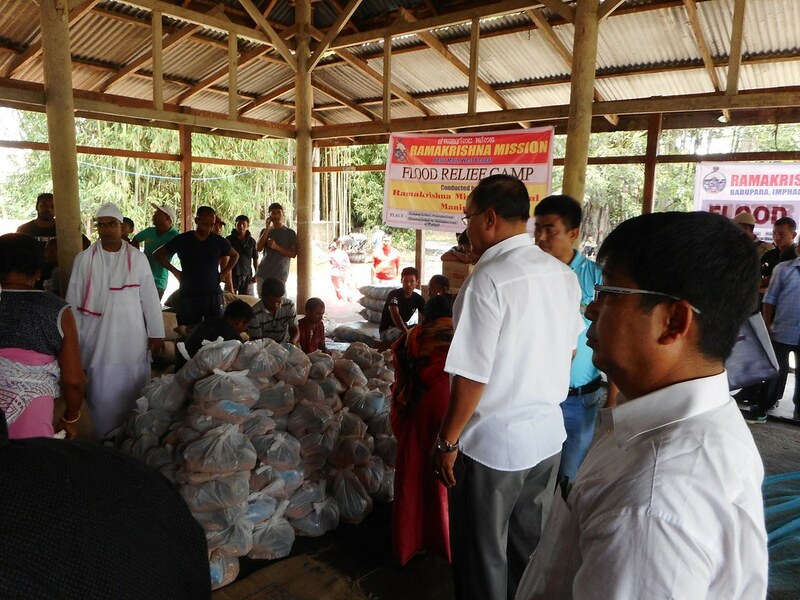 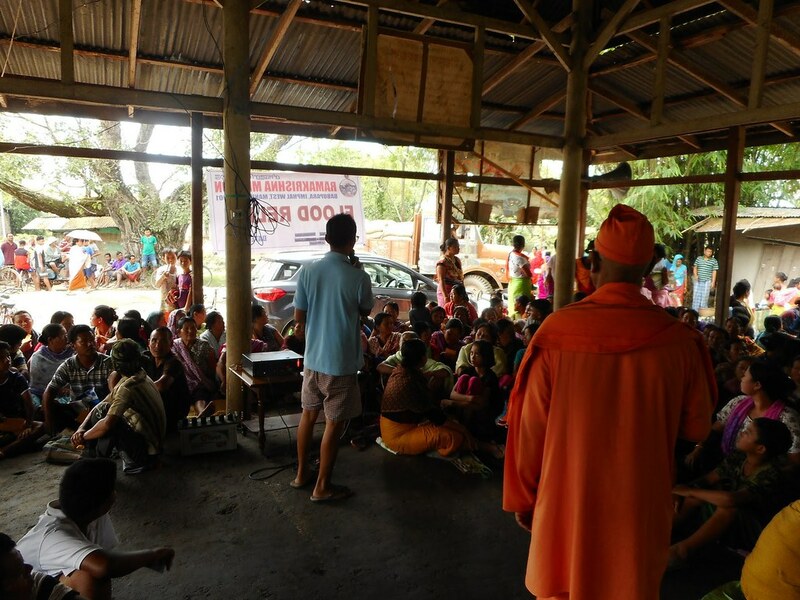 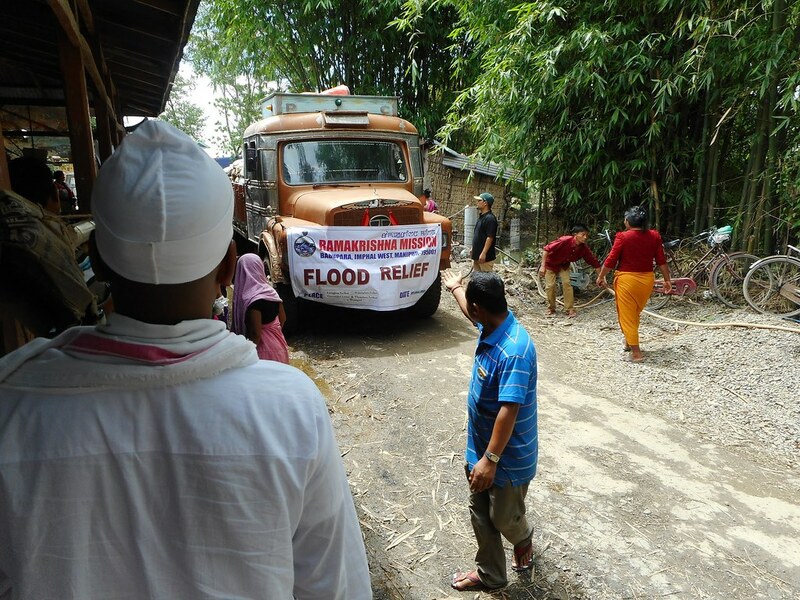 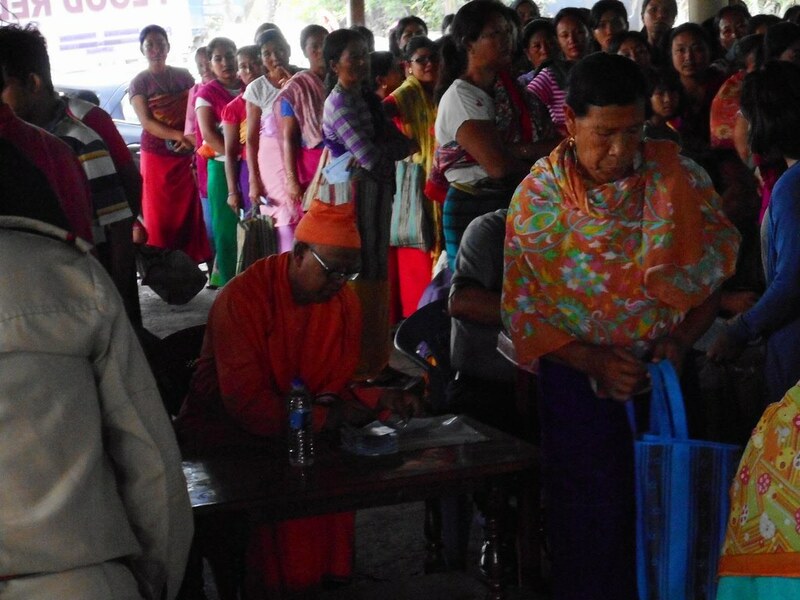 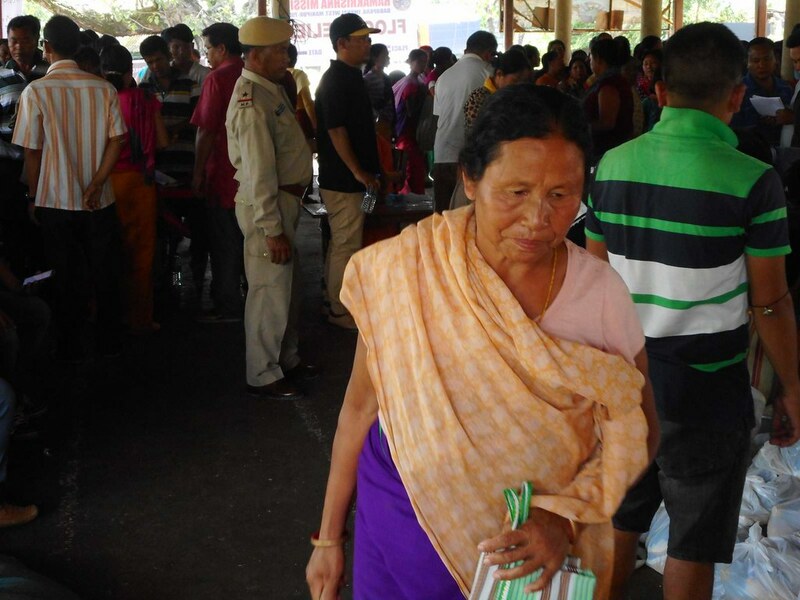 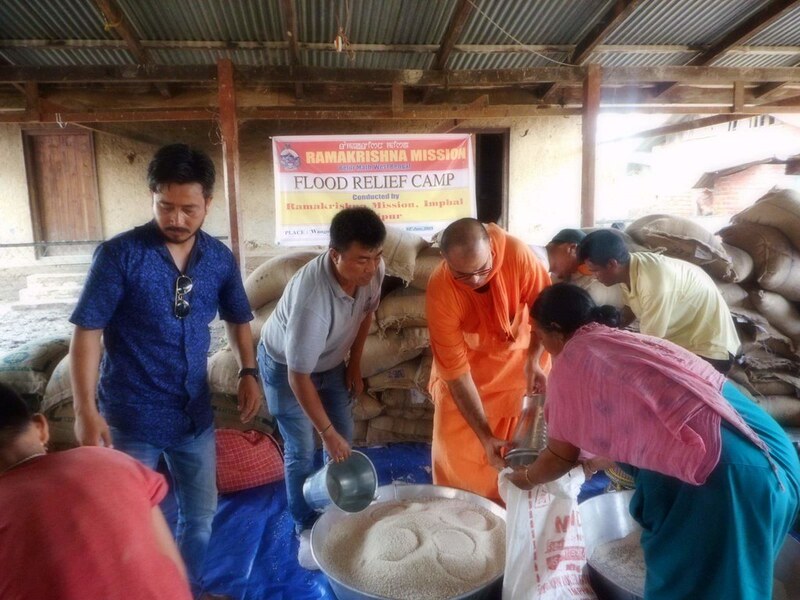 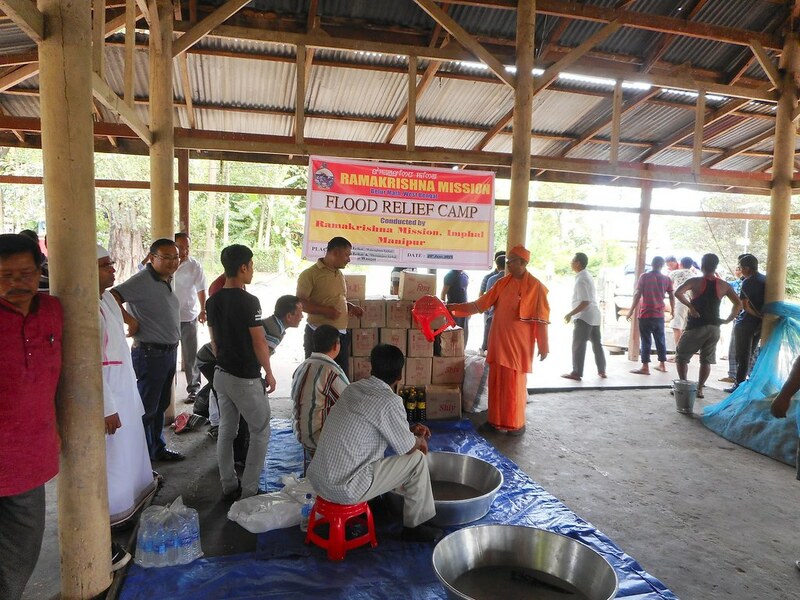 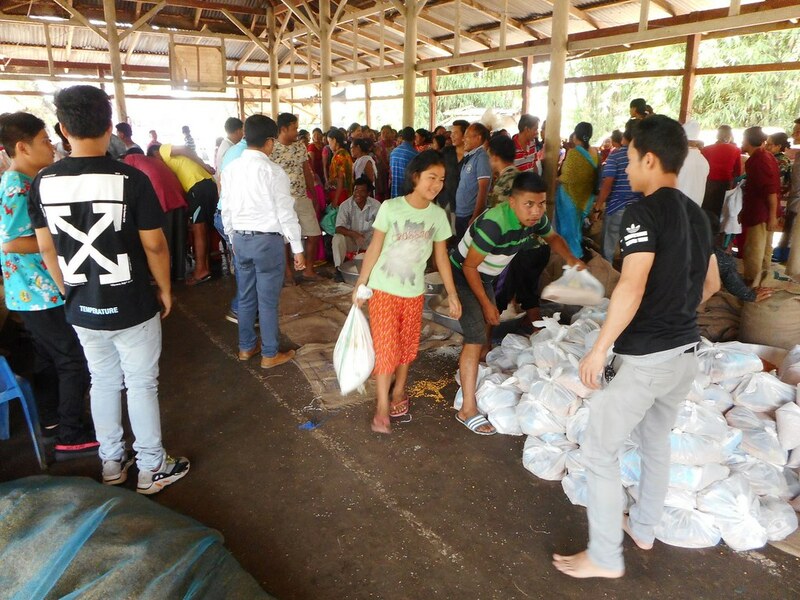 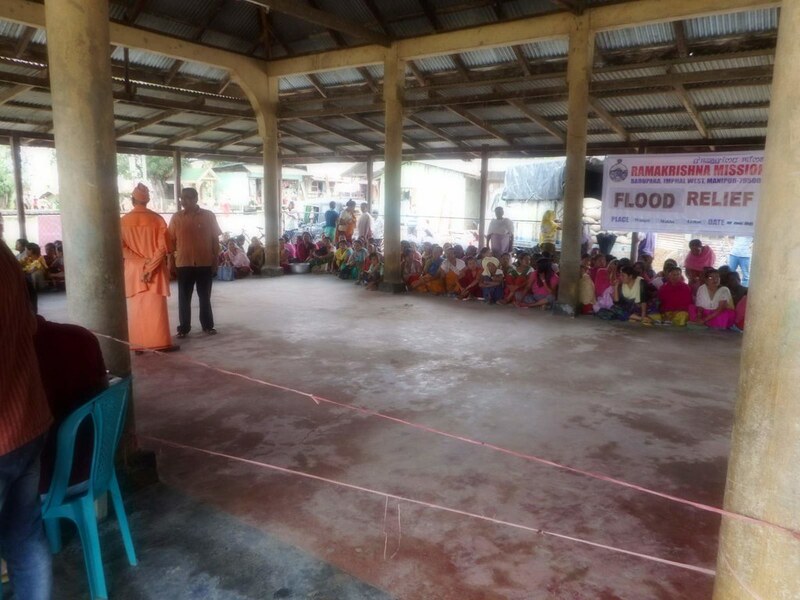 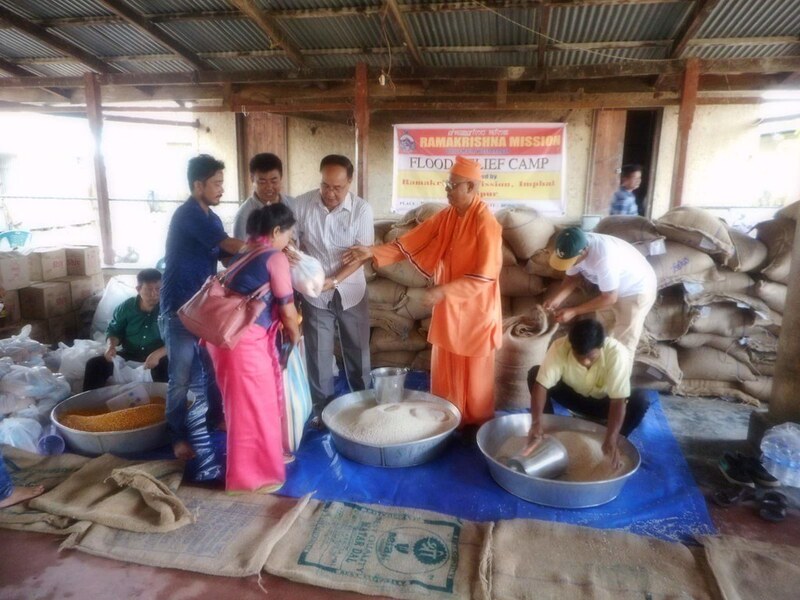 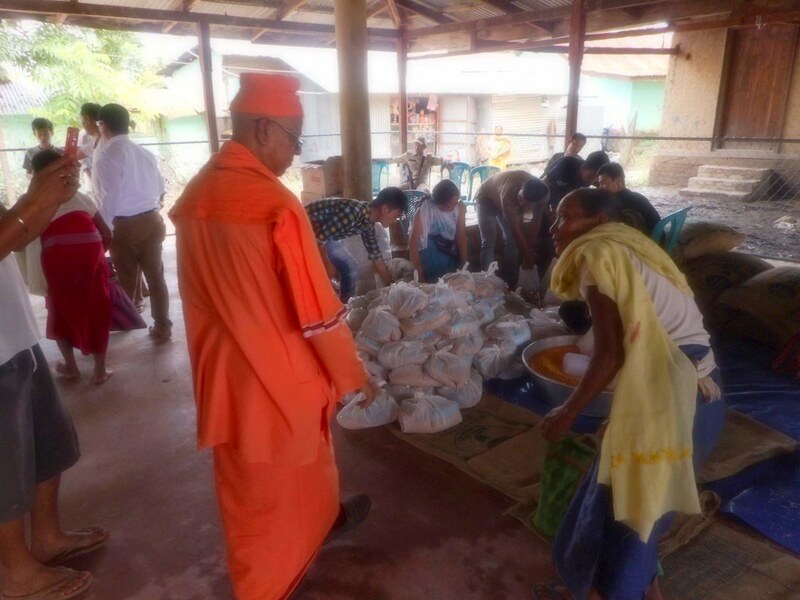 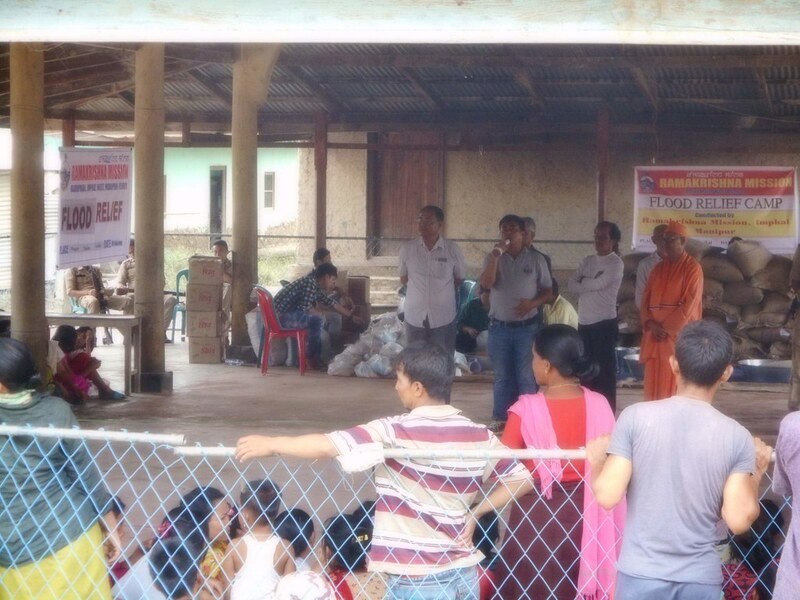 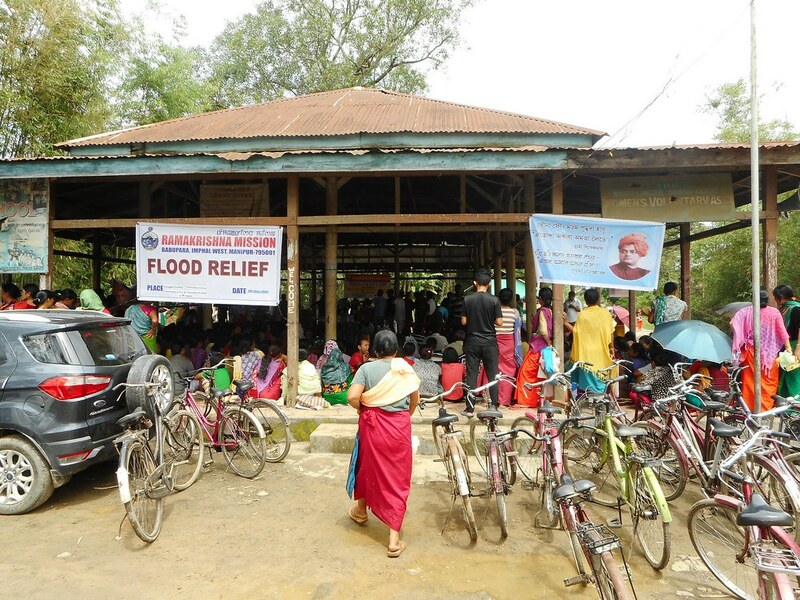 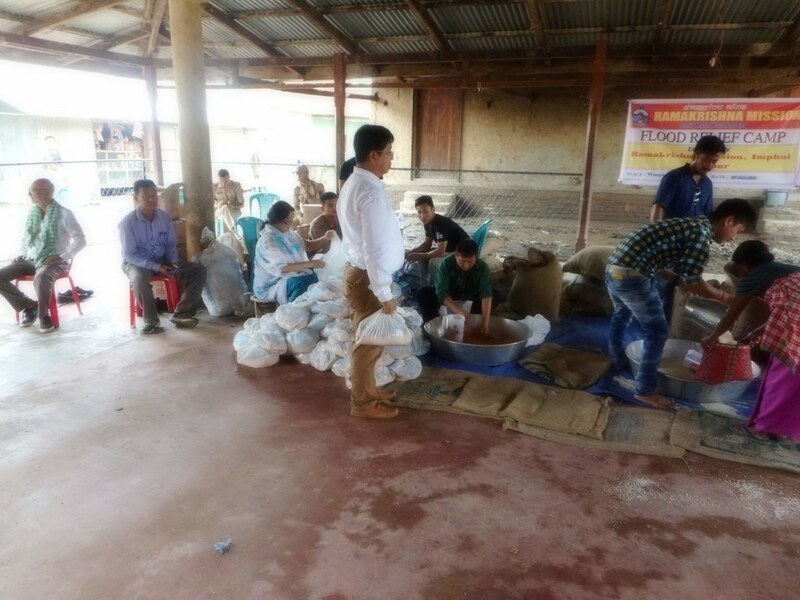 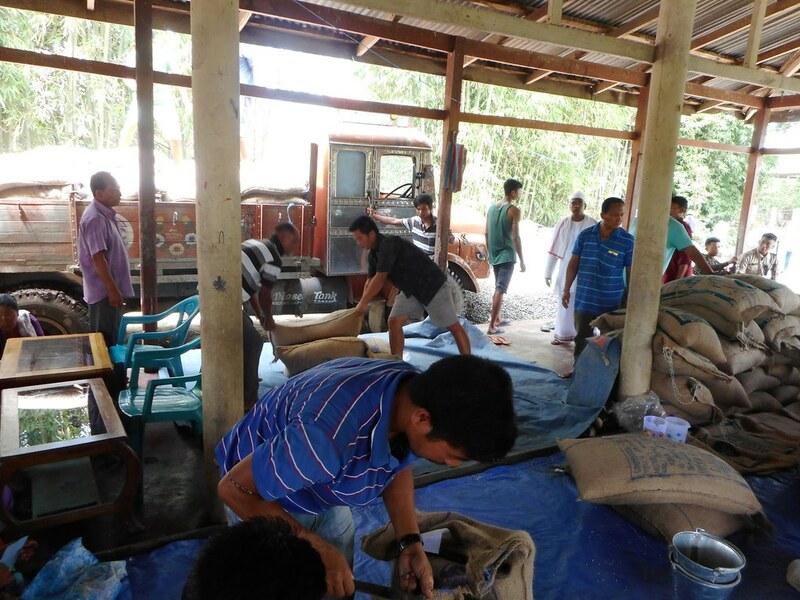 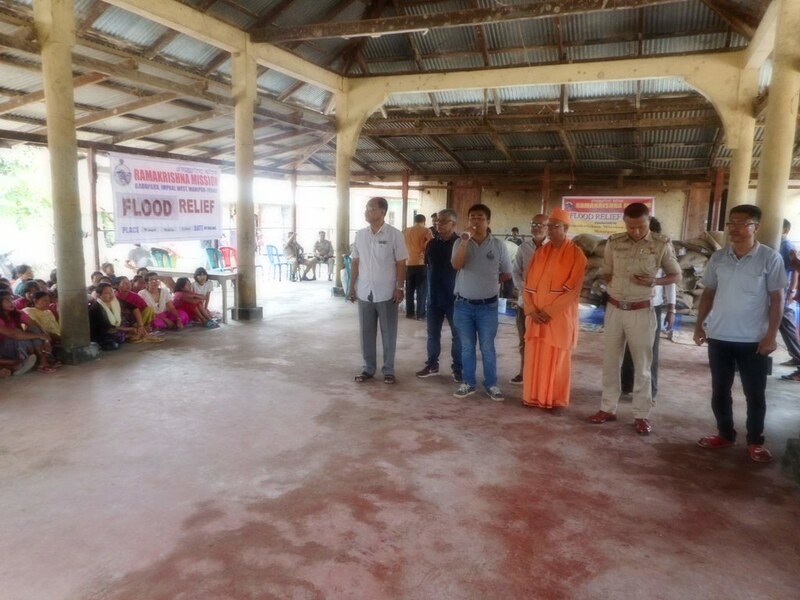 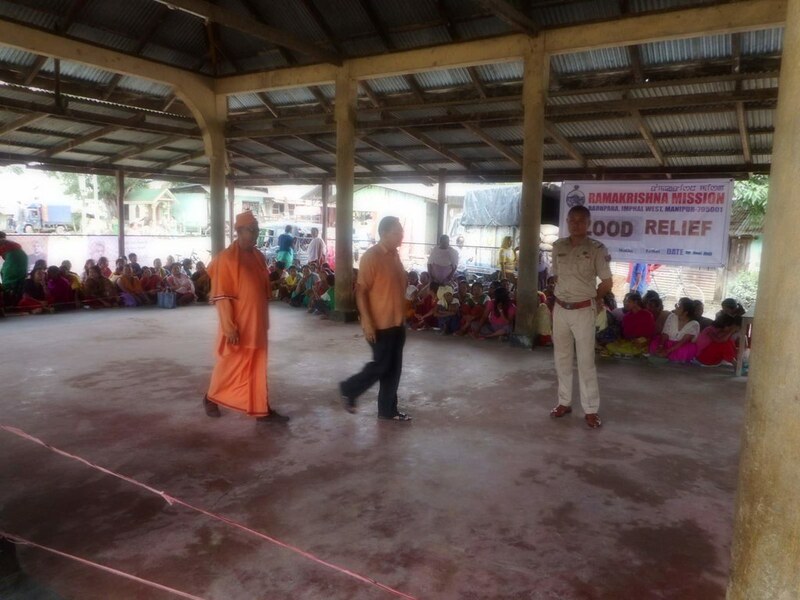 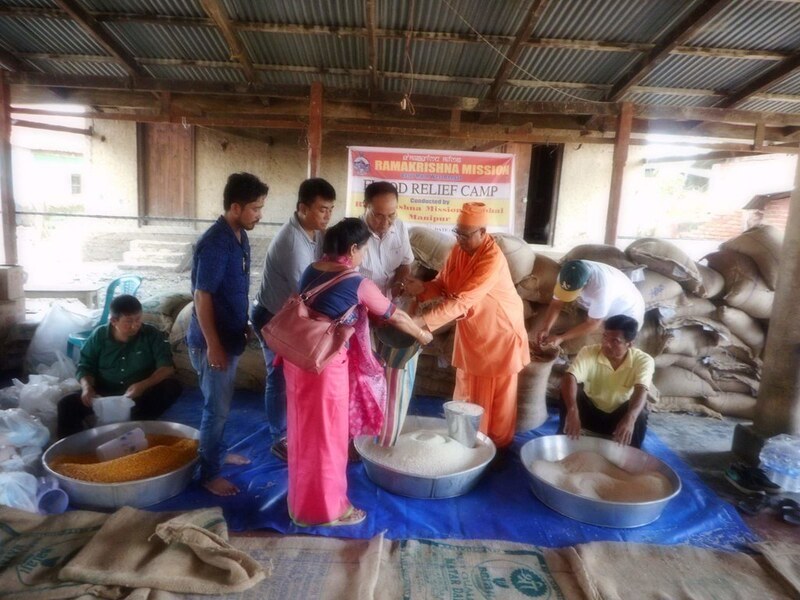 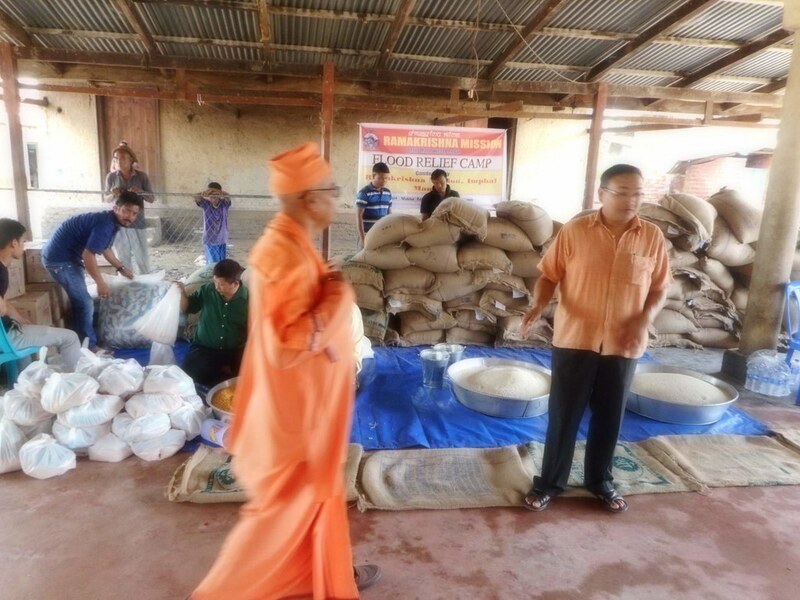 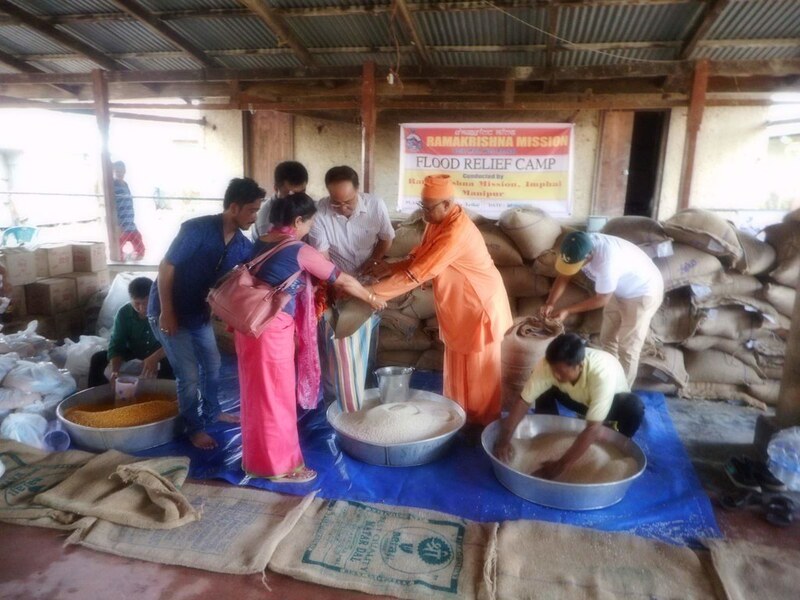 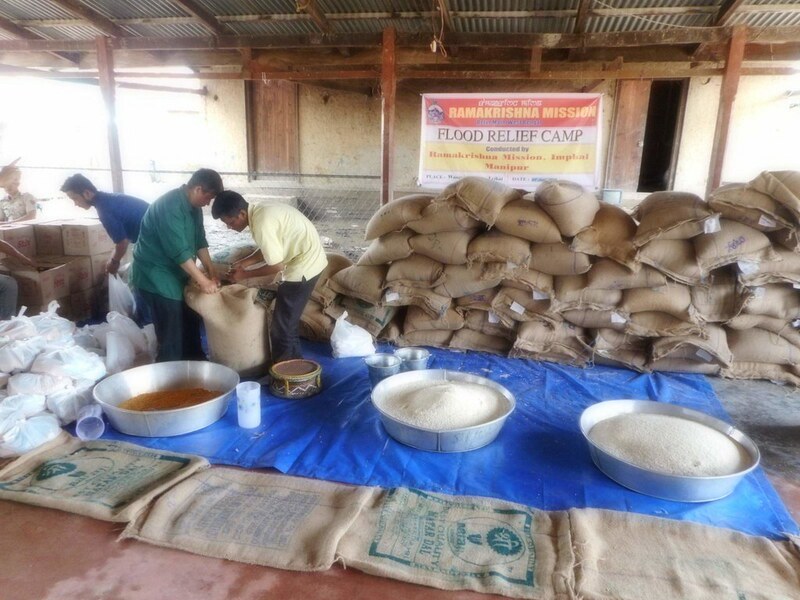 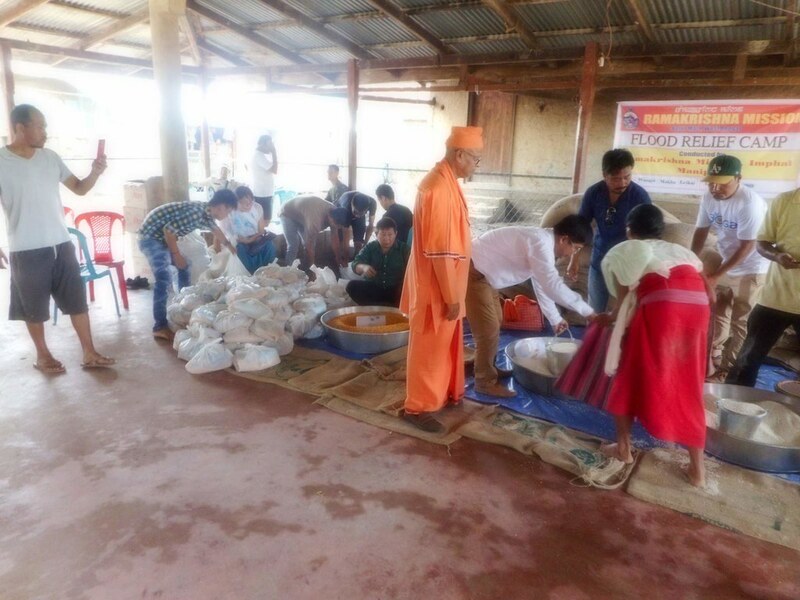 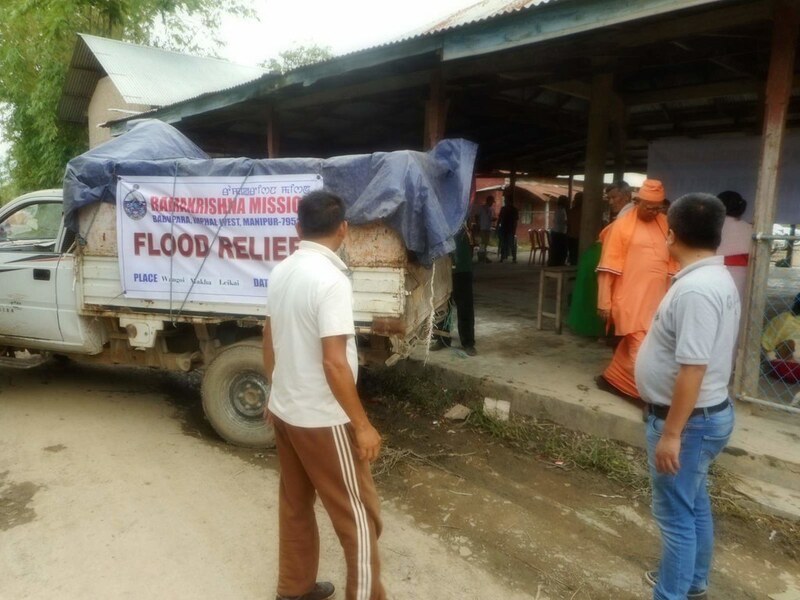 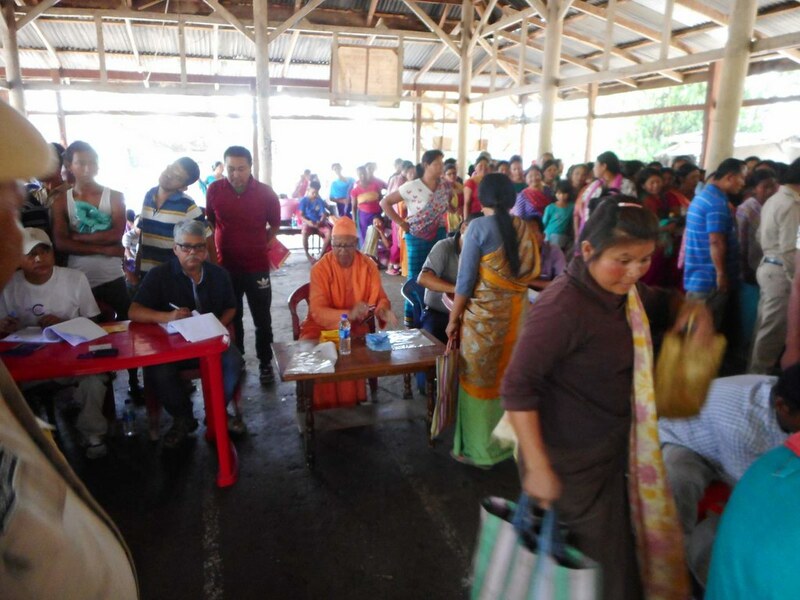 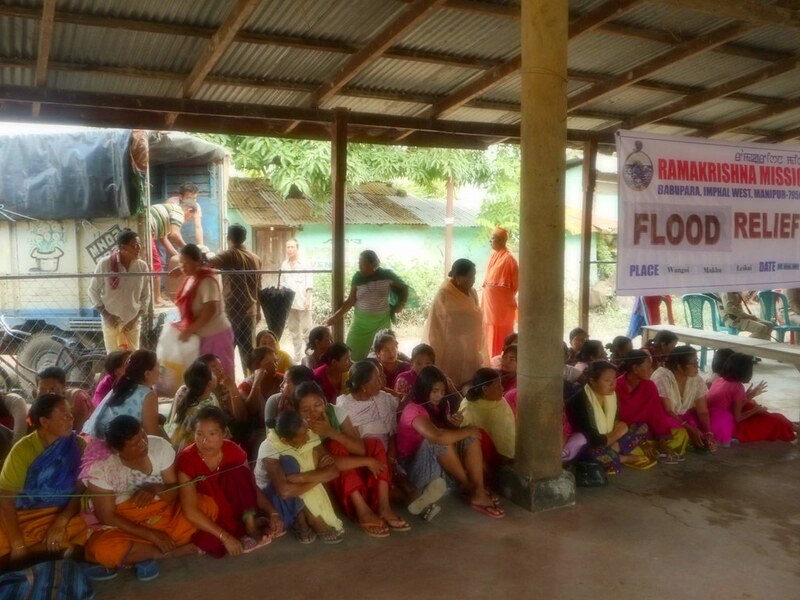 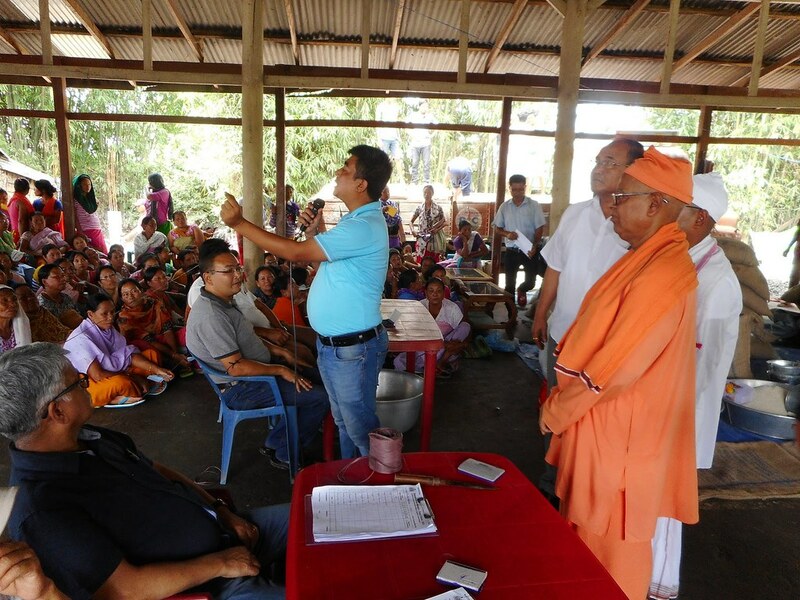 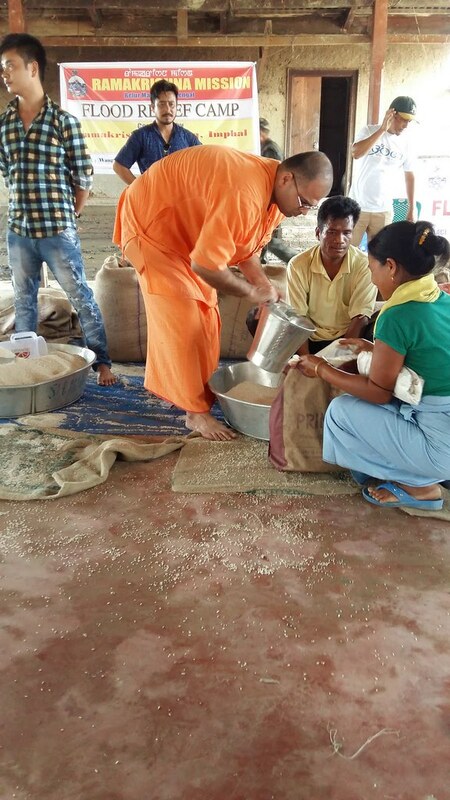 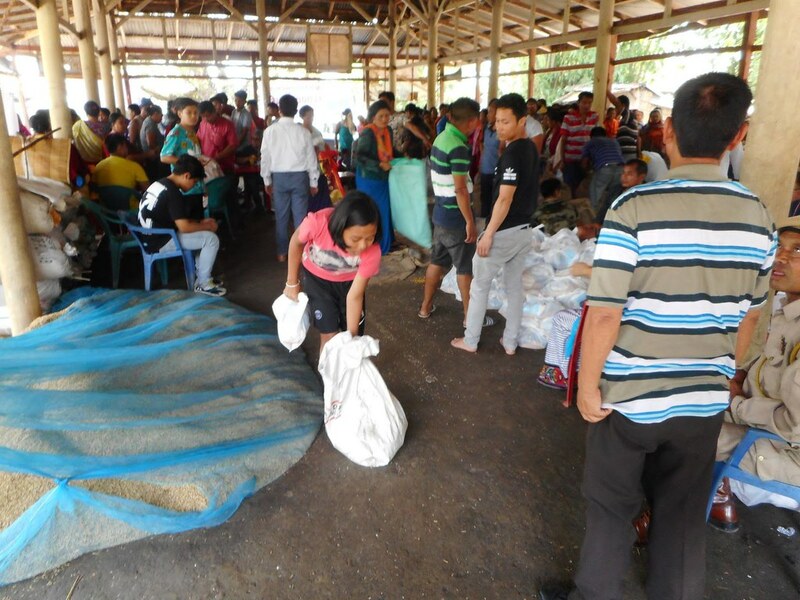 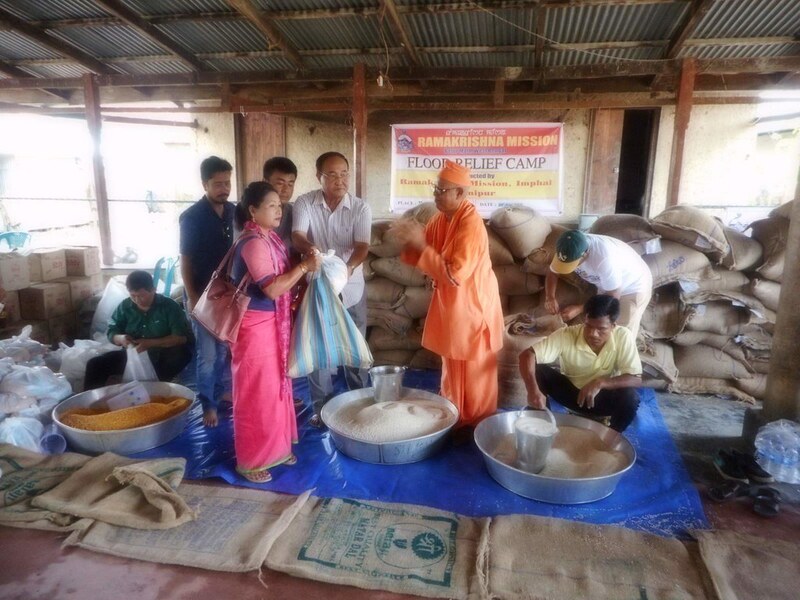 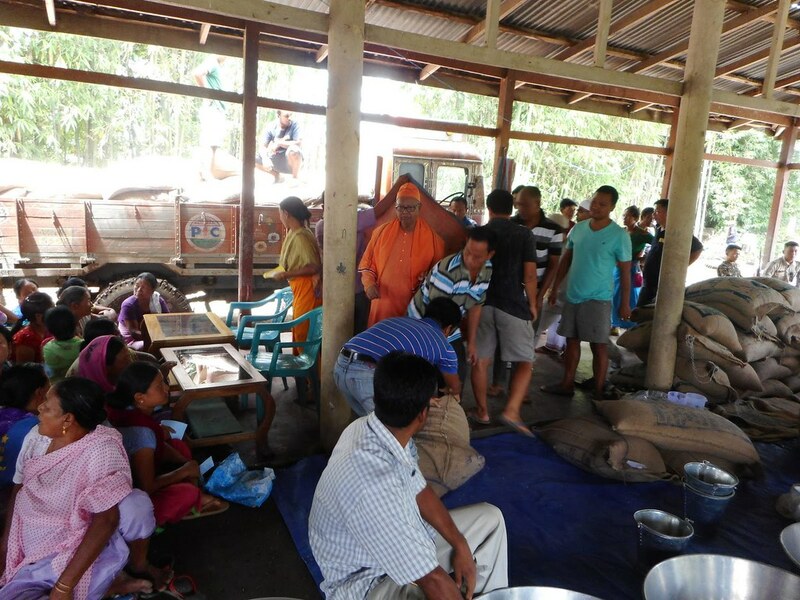 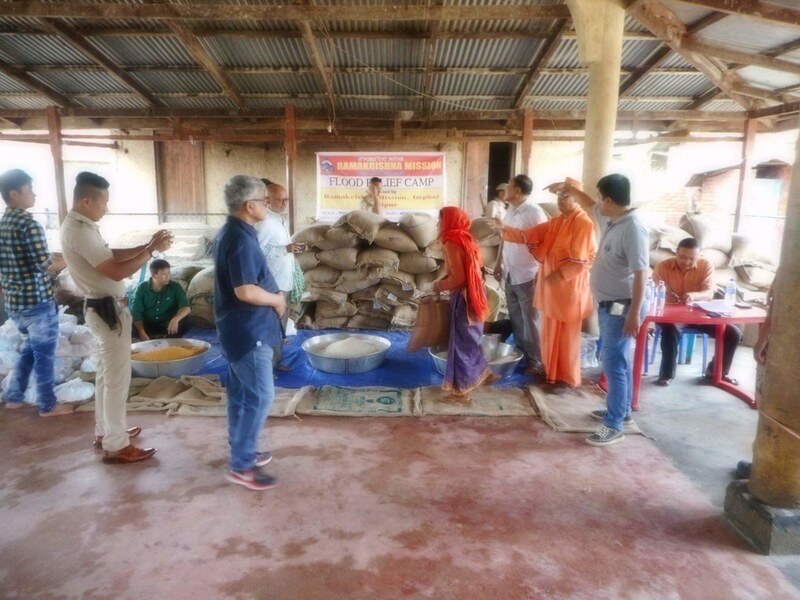 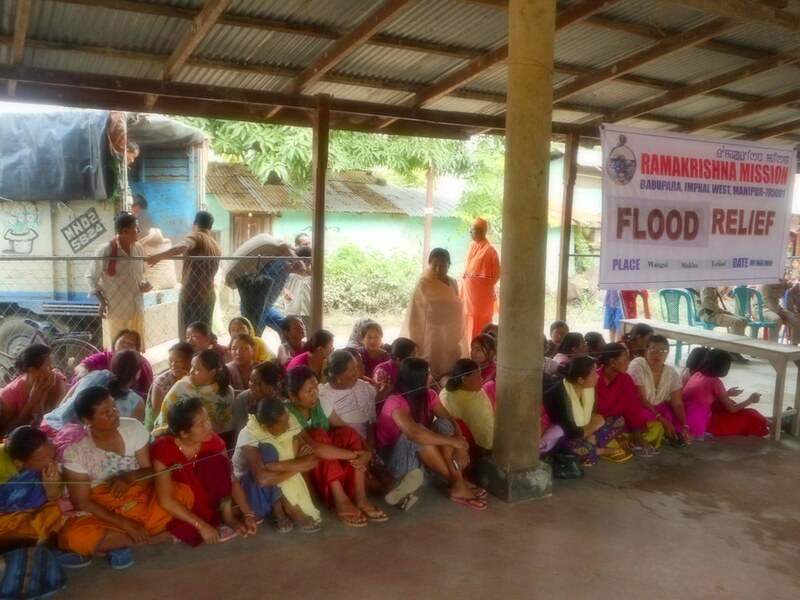 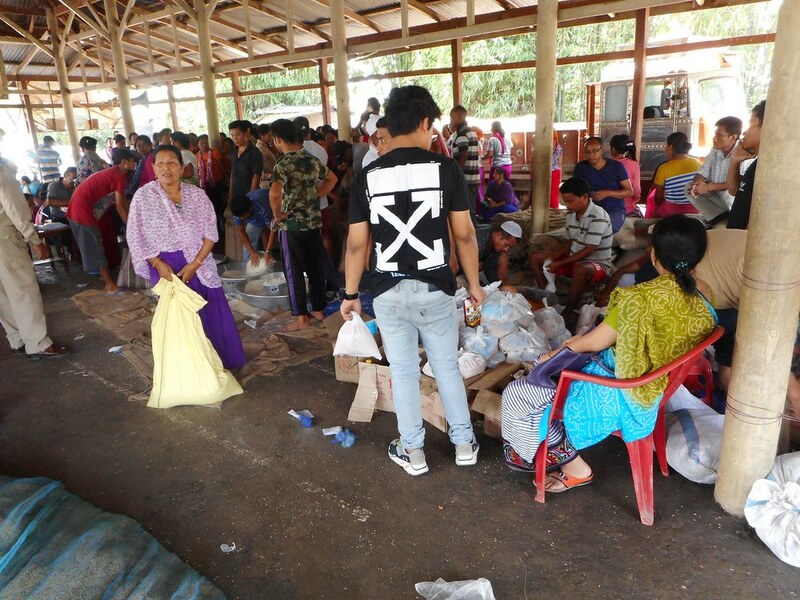 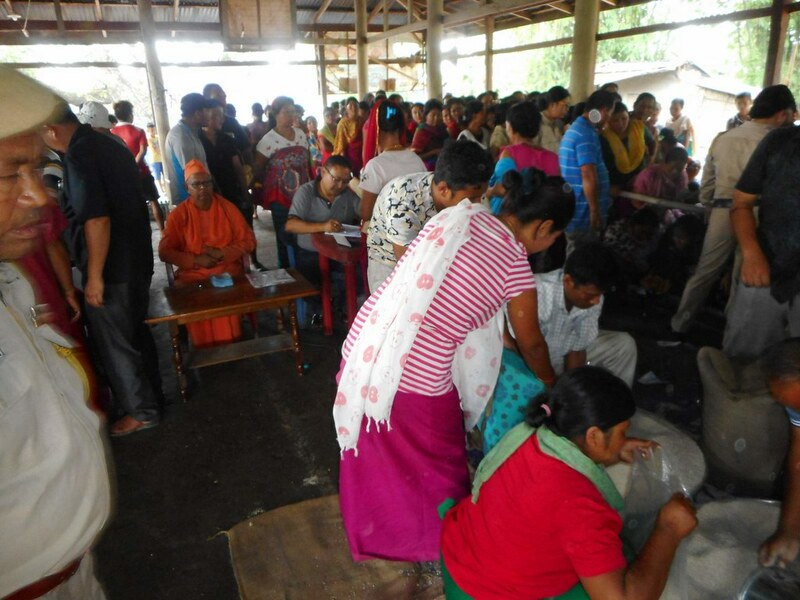 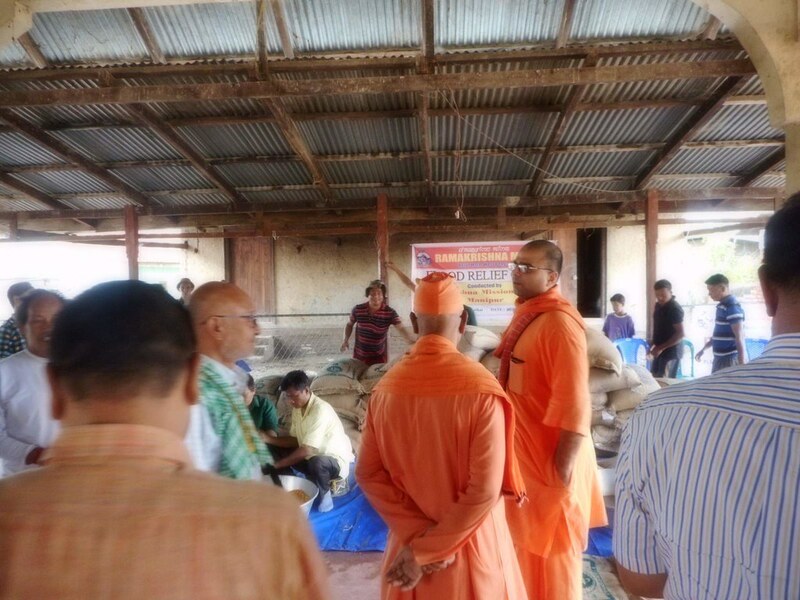 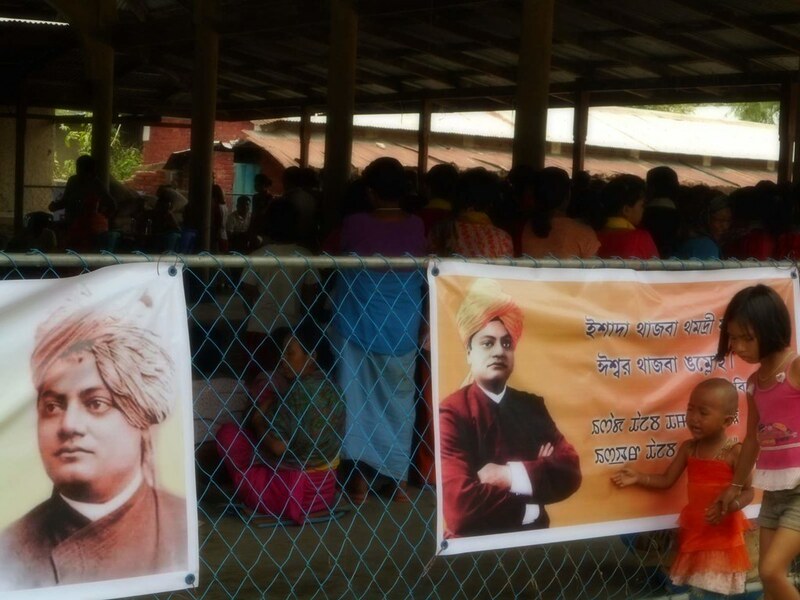 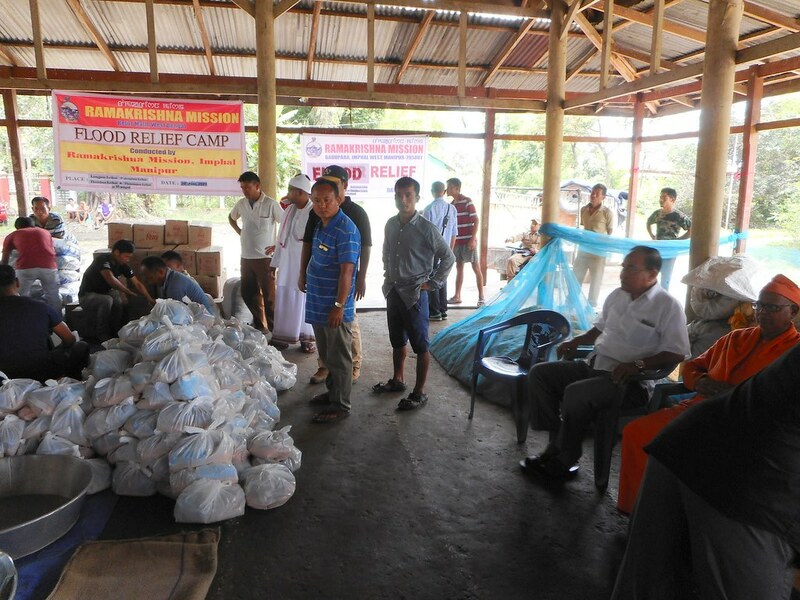 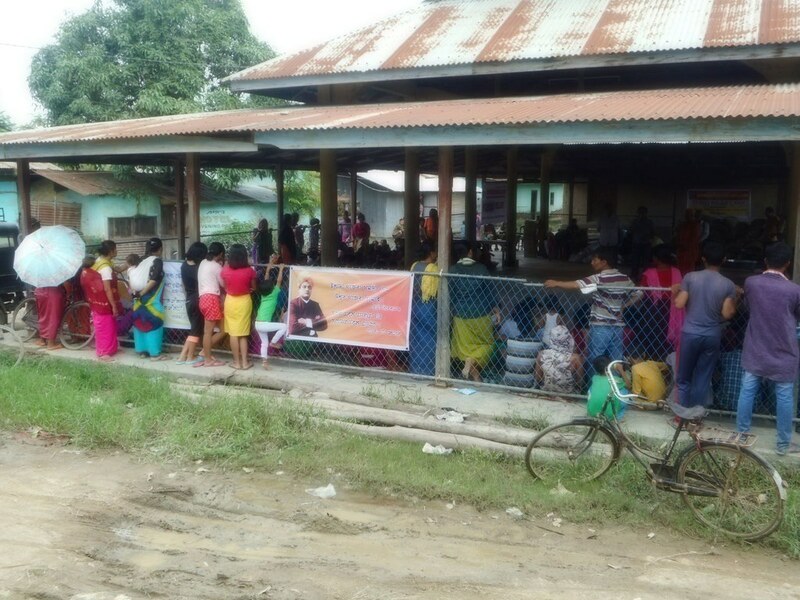 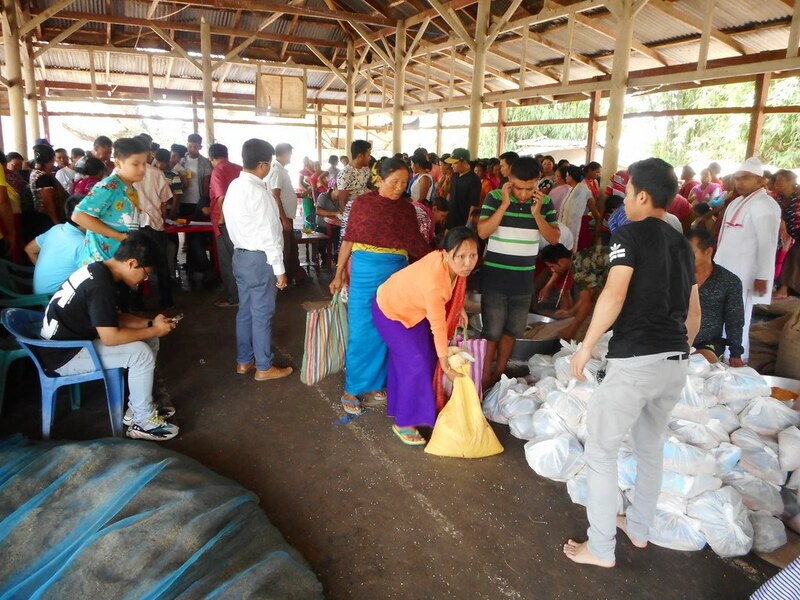 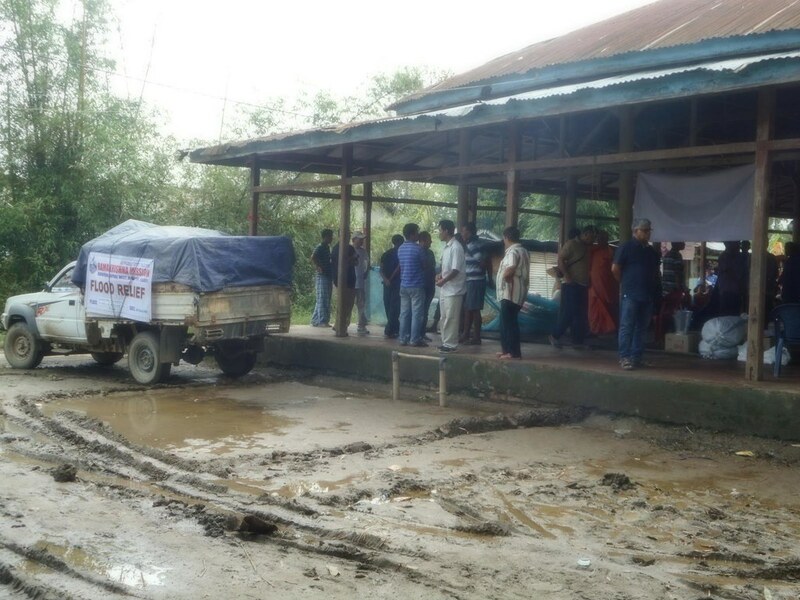 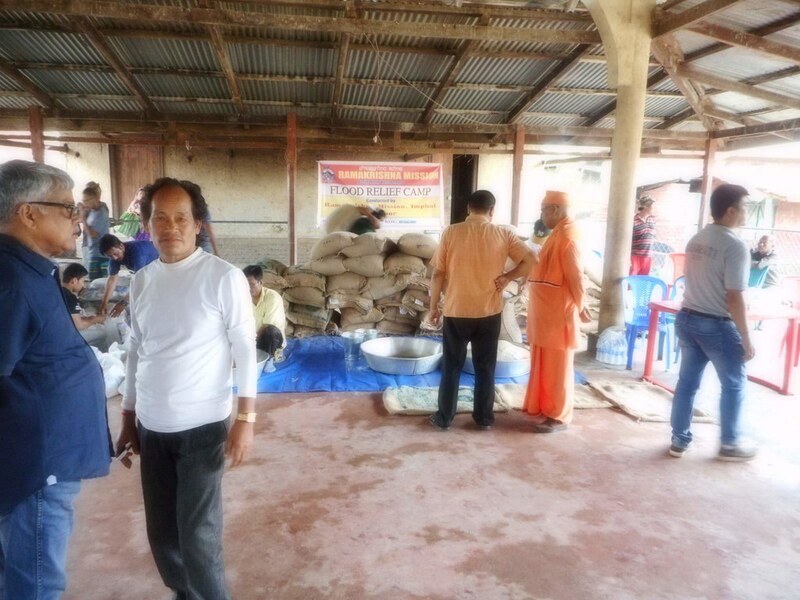 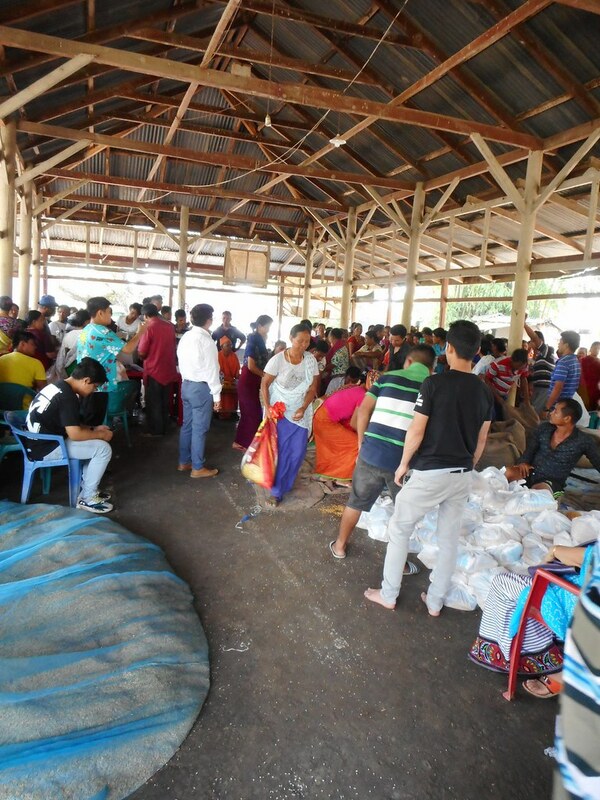 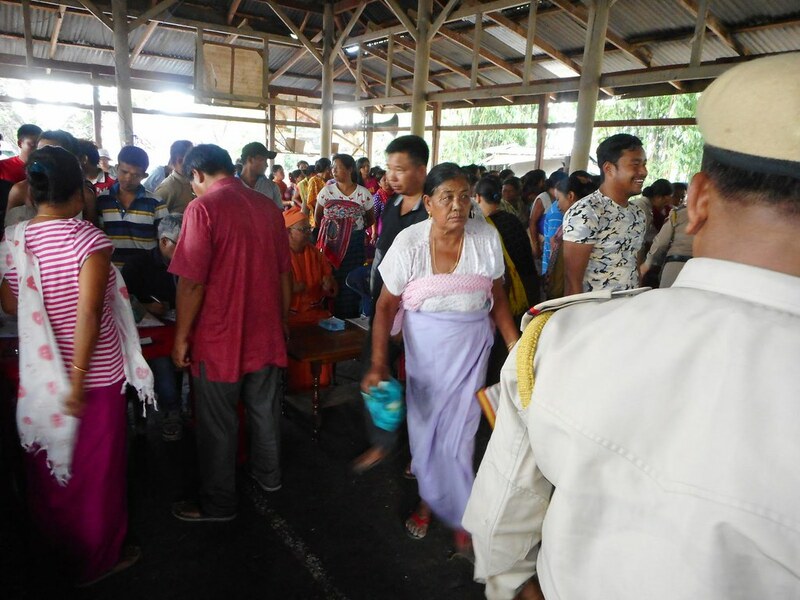 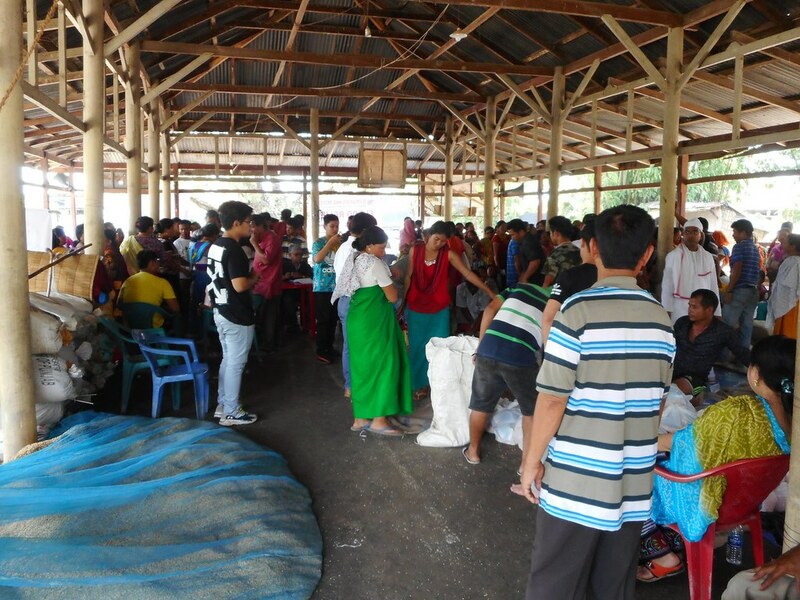 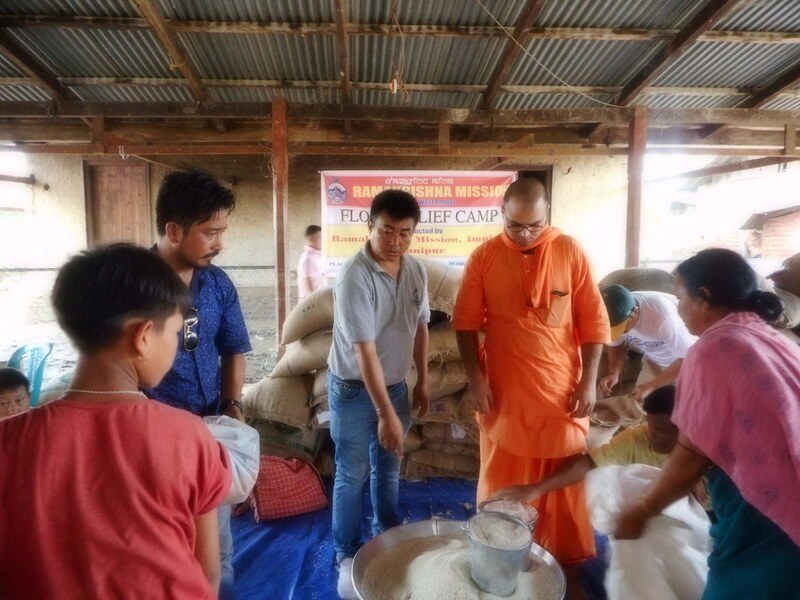 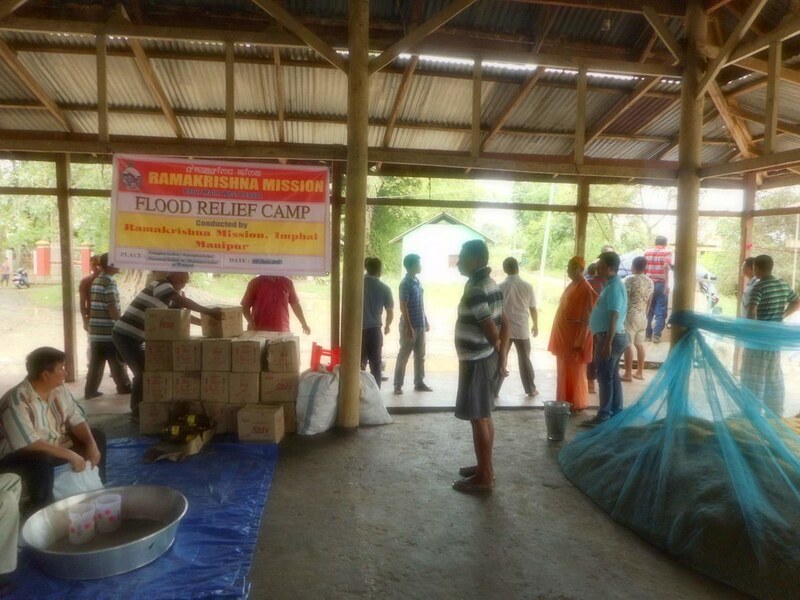 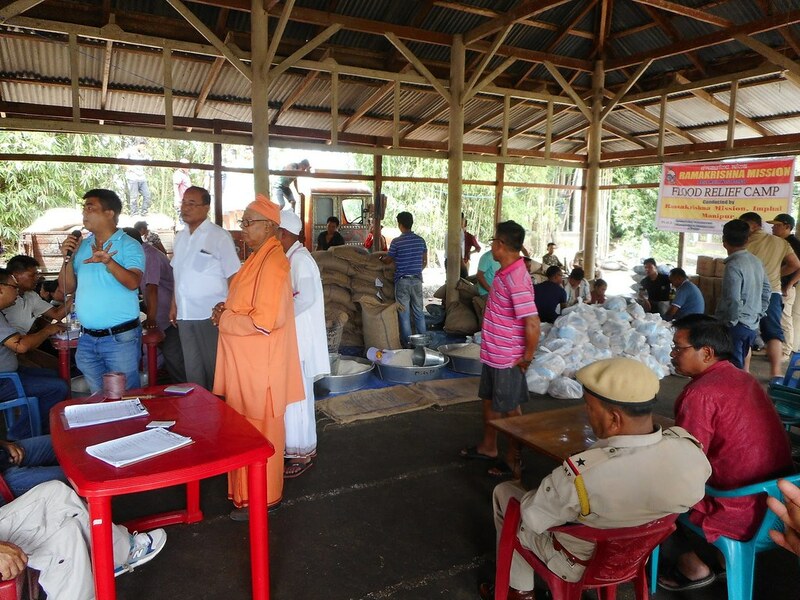 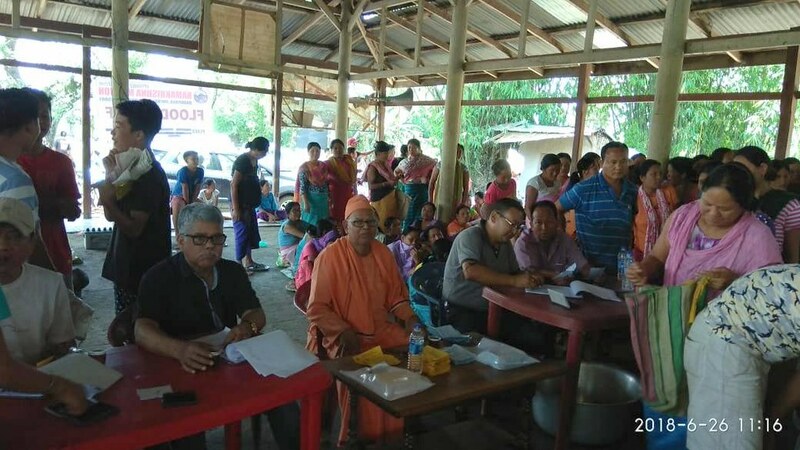 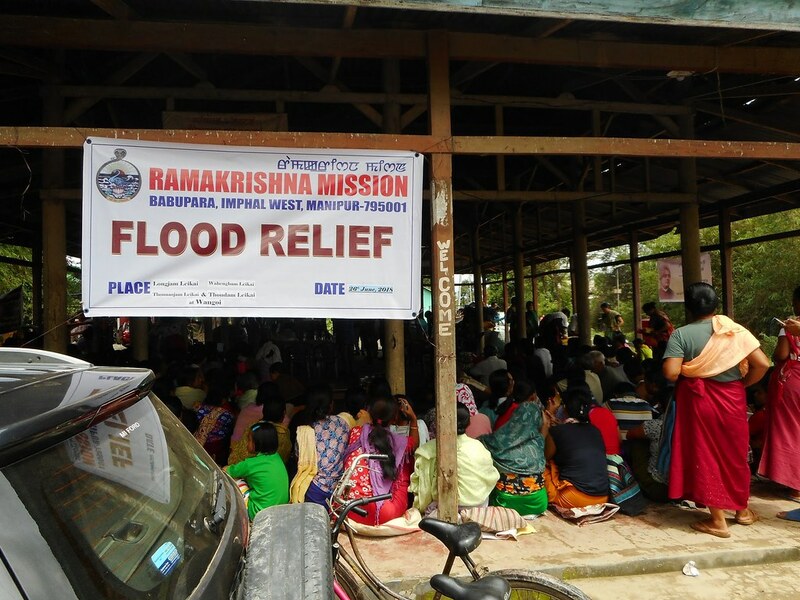 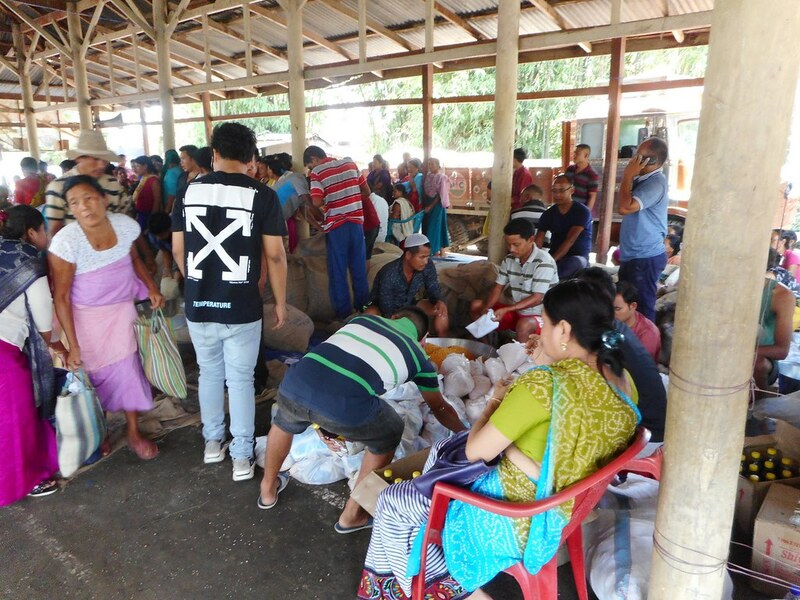 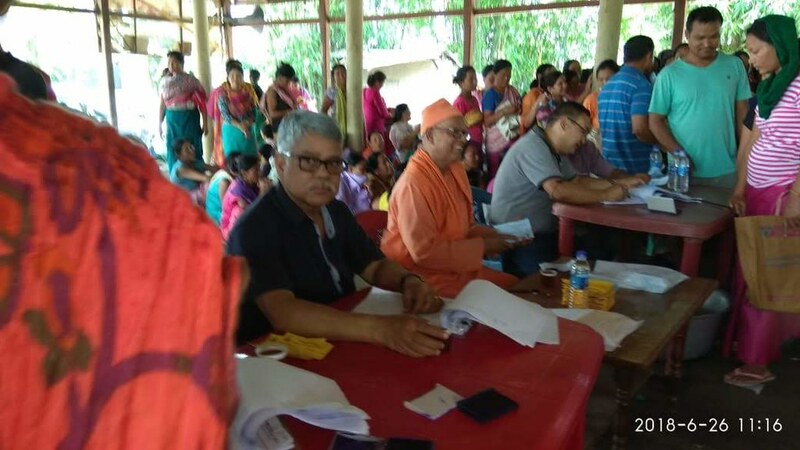 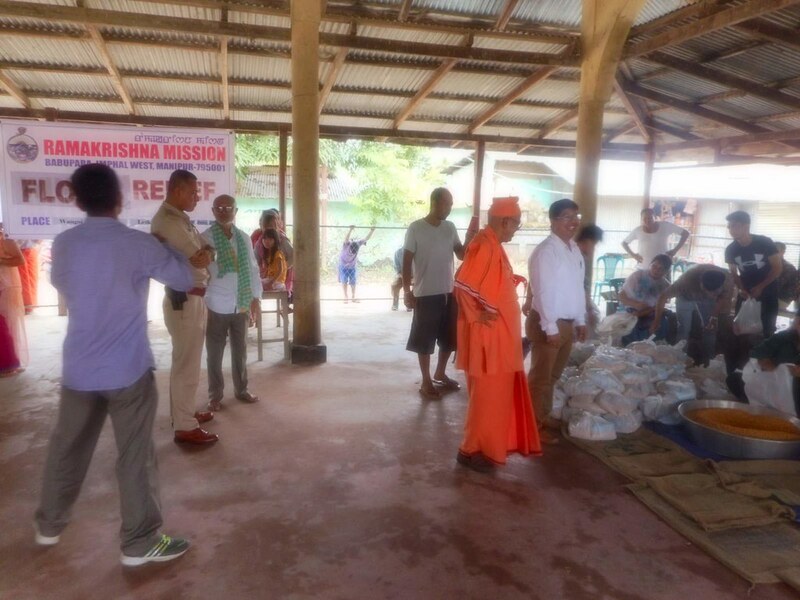 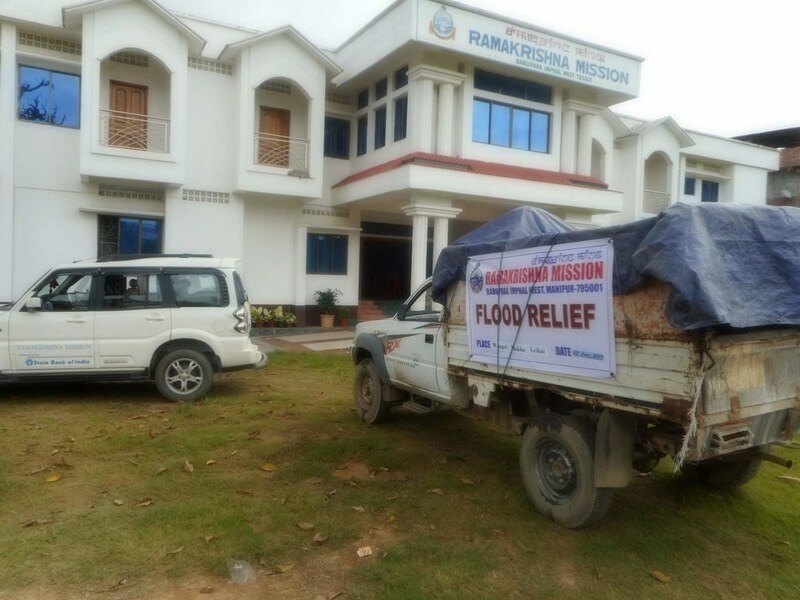 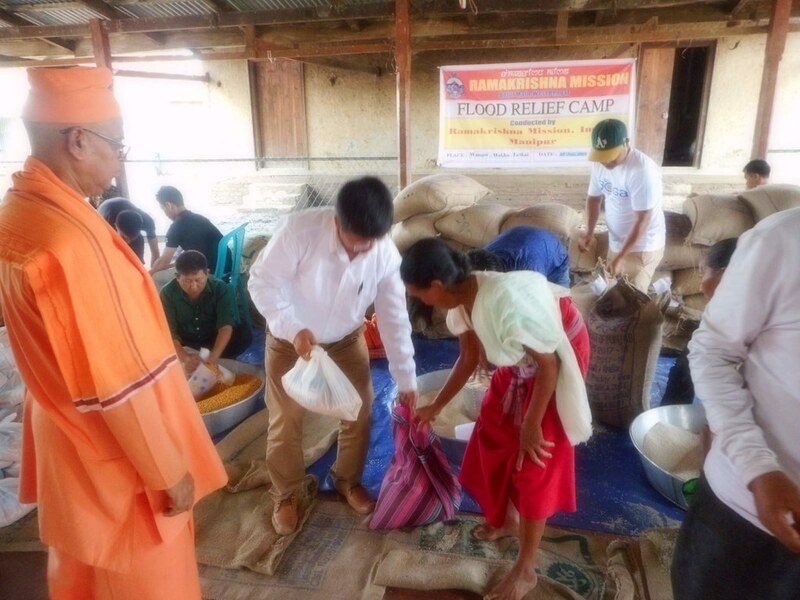 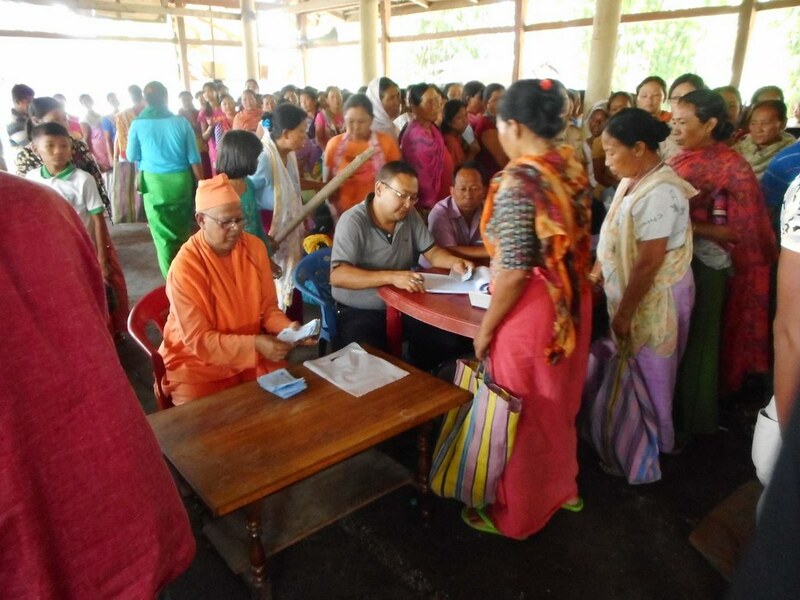 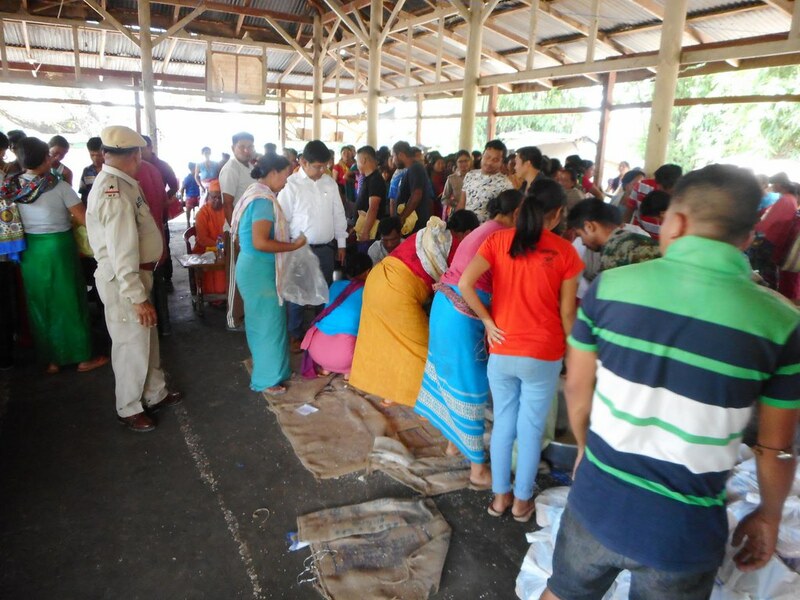 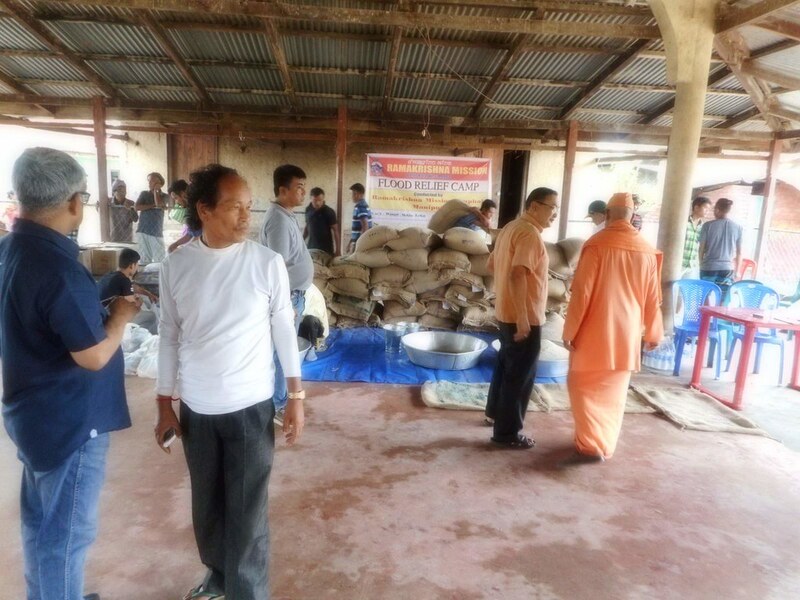 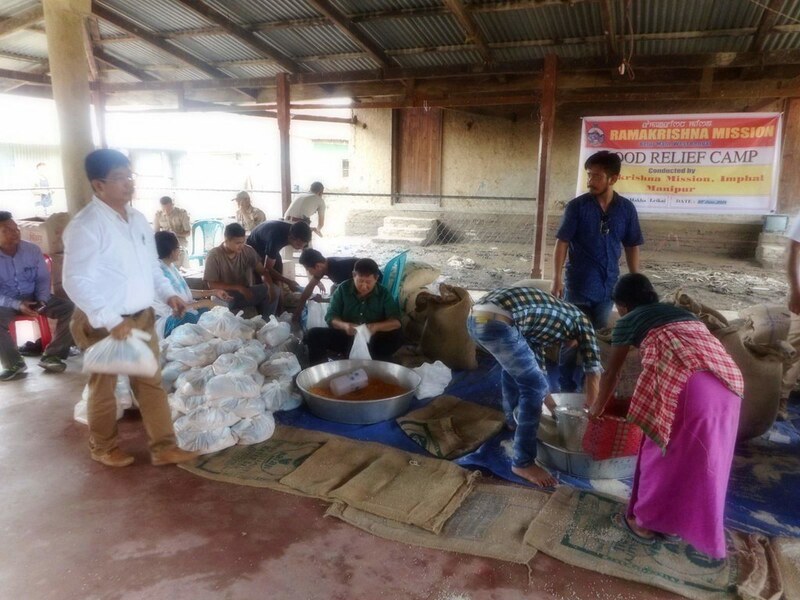 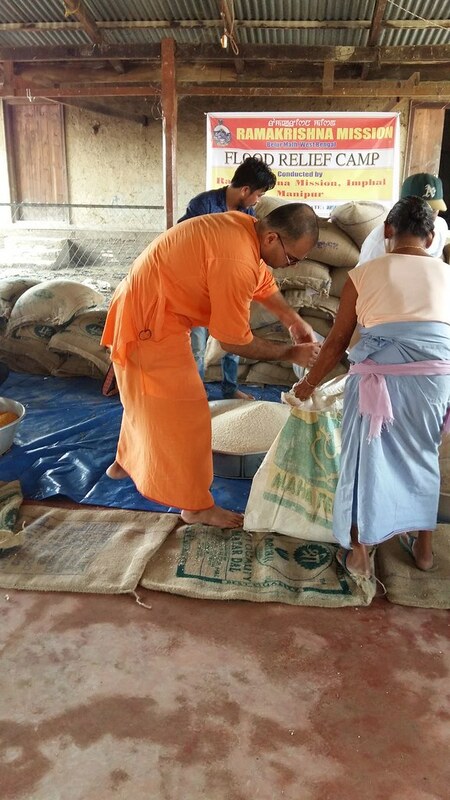 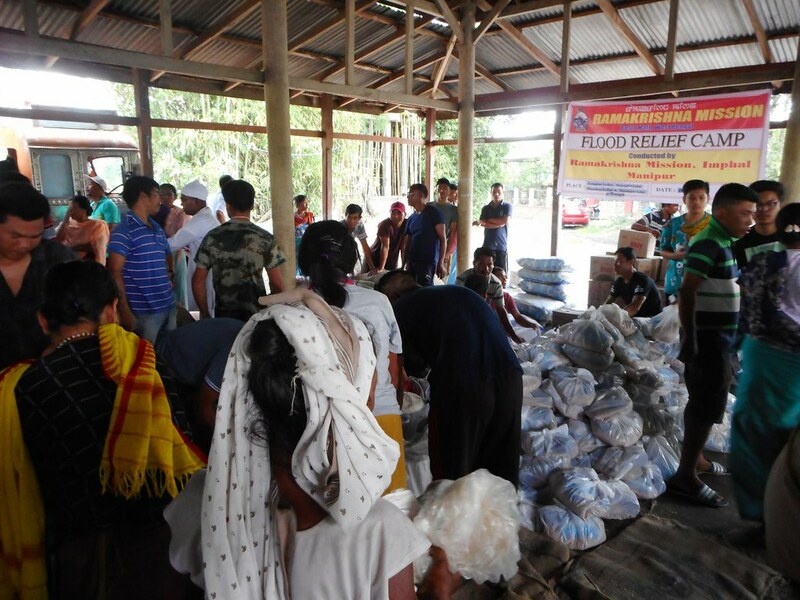 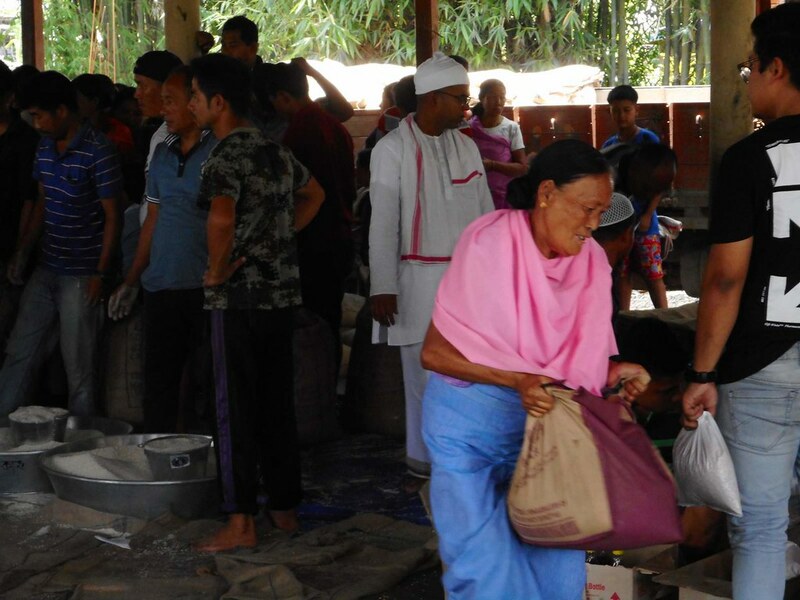 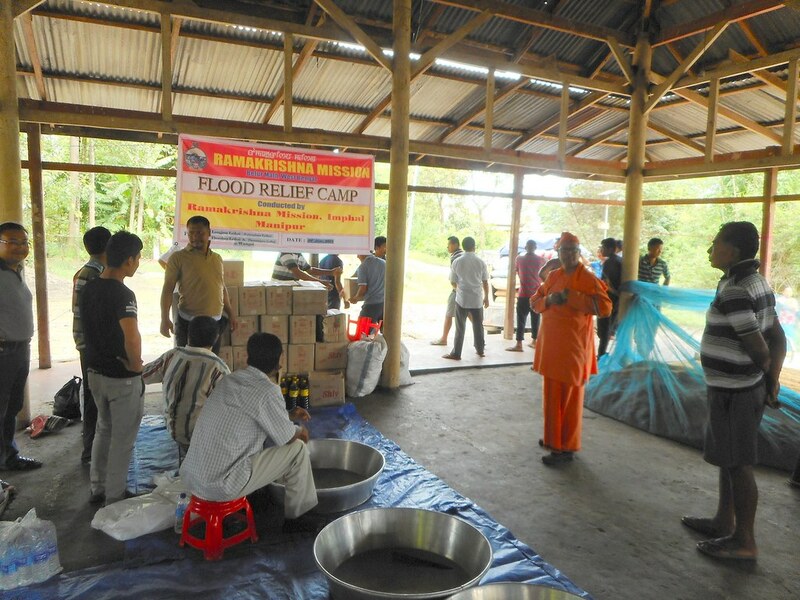 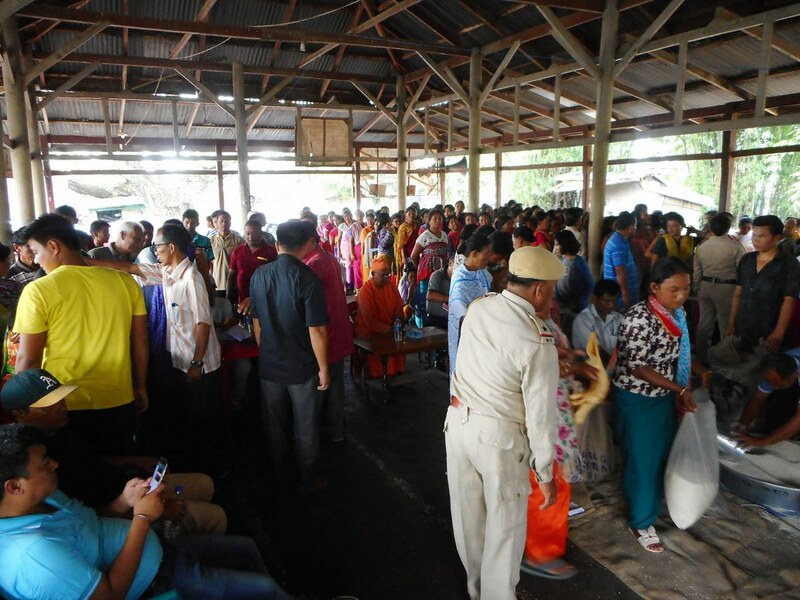 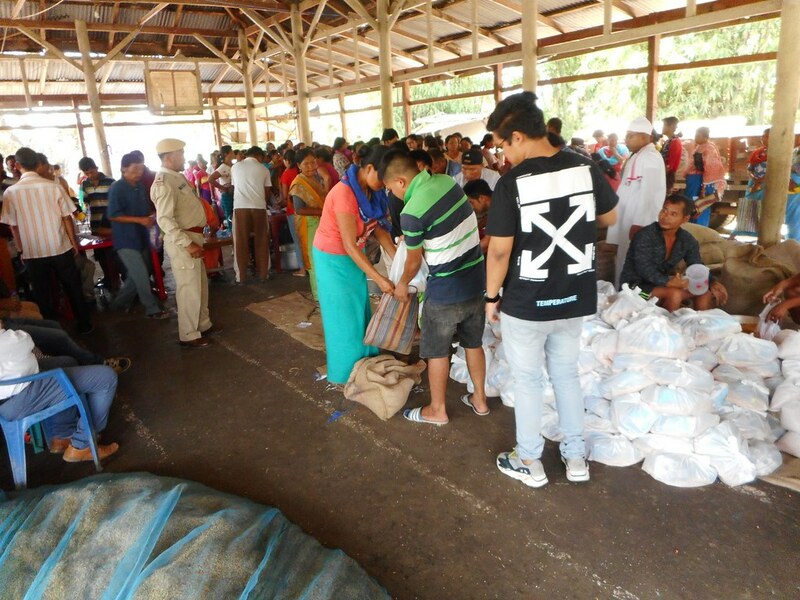 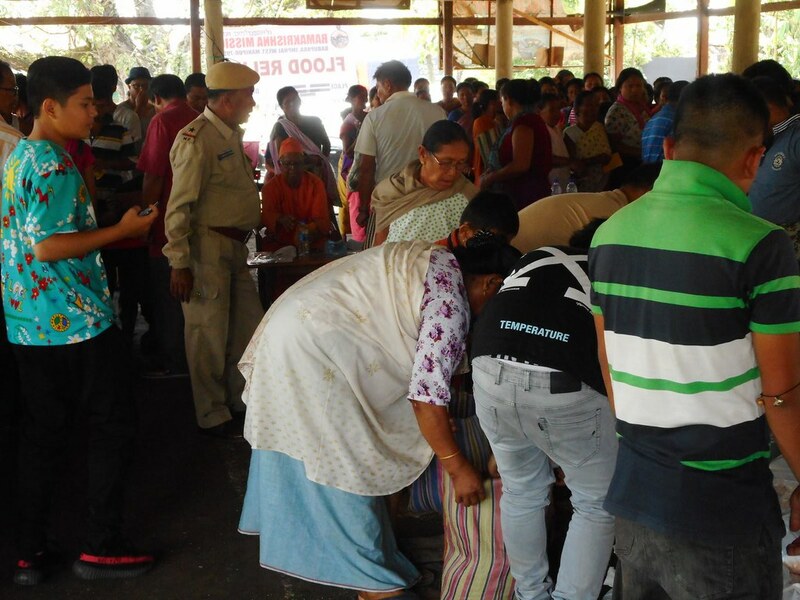 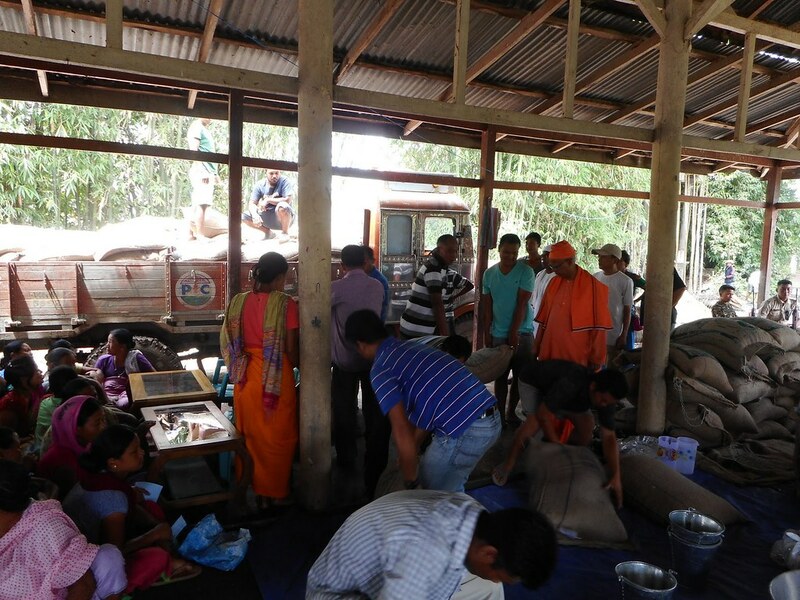 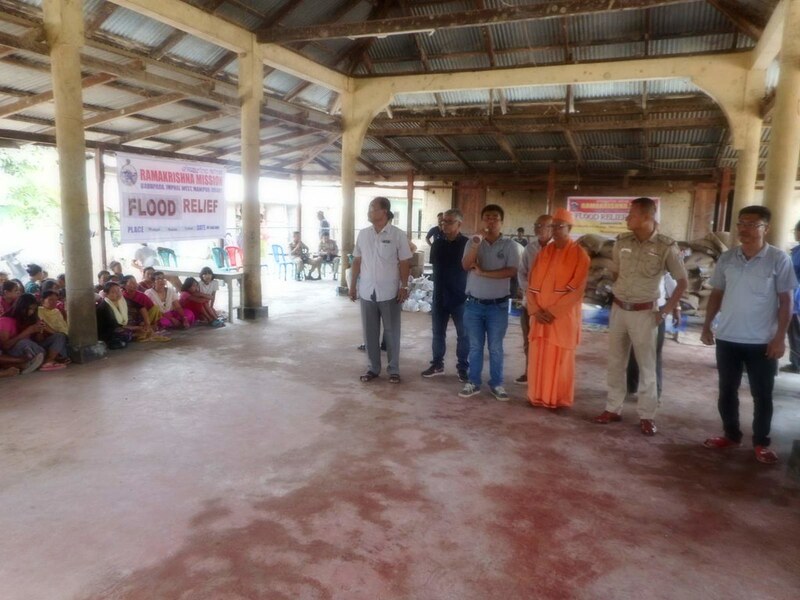 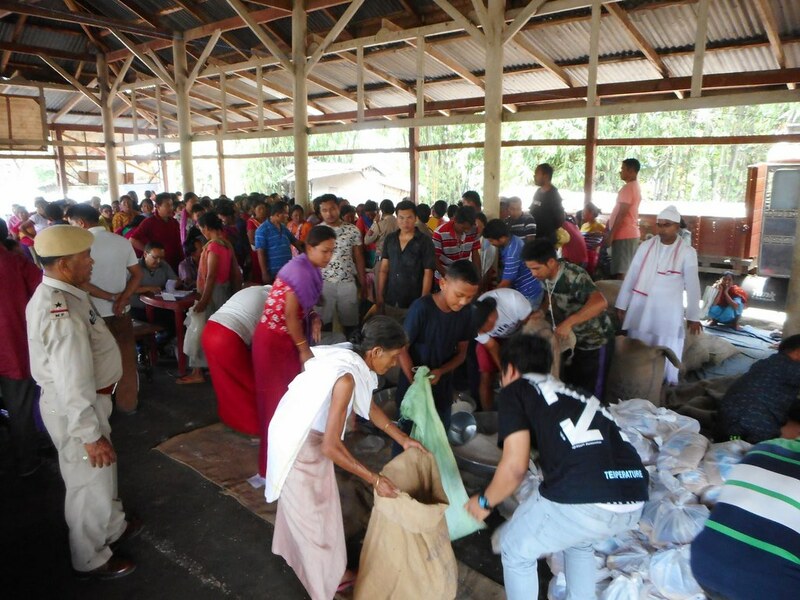 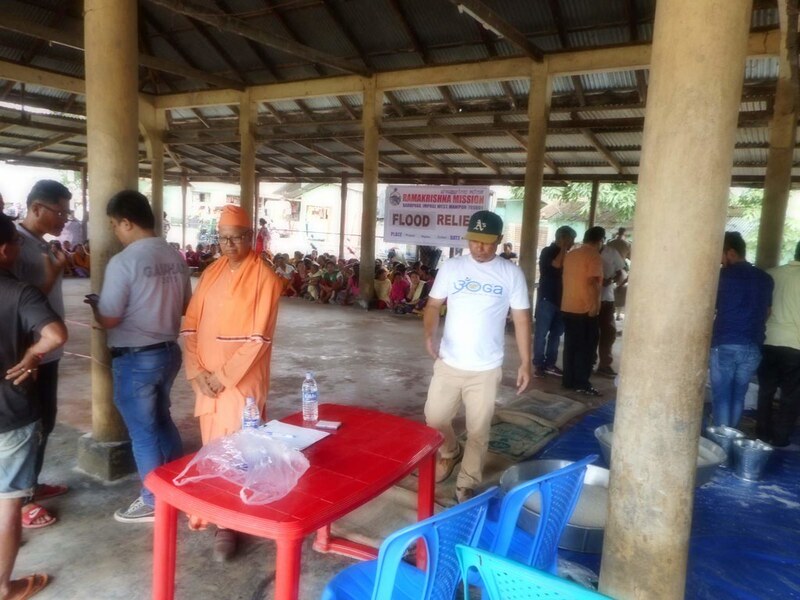 Ramakrishna Mission, Imphal, conducted relief camps at some of the worst affected localities. 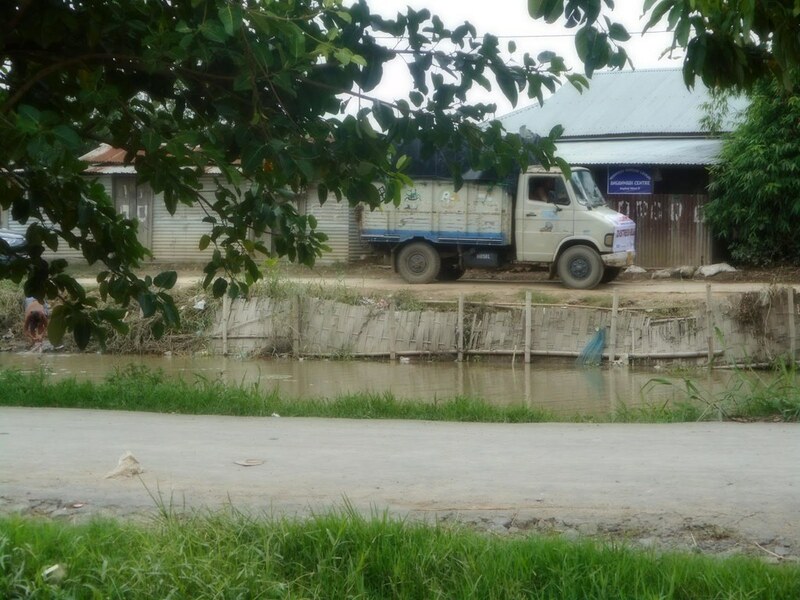 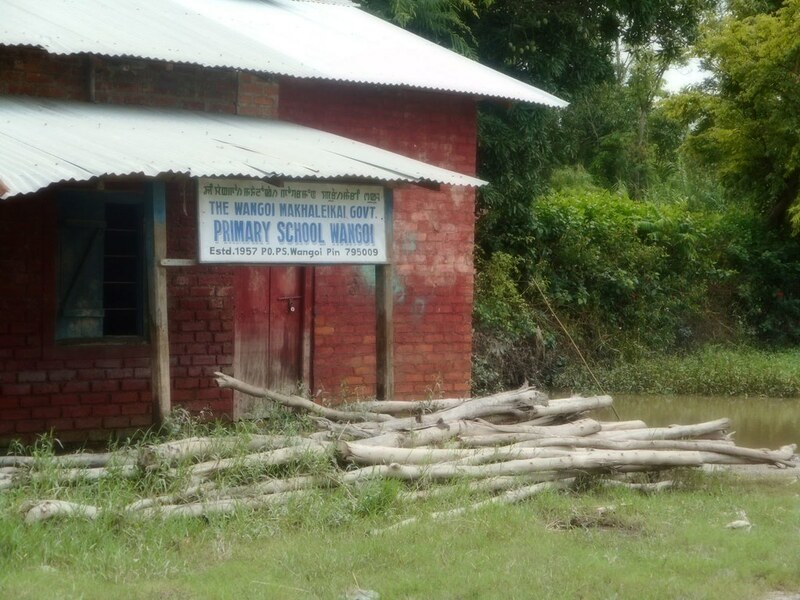 Most people in those localities are poor, living in bamboo framed mud houses which were partially damaged or fully ruined, forcing the inmates to stay in community halls till their houses are repaired or rebuild. 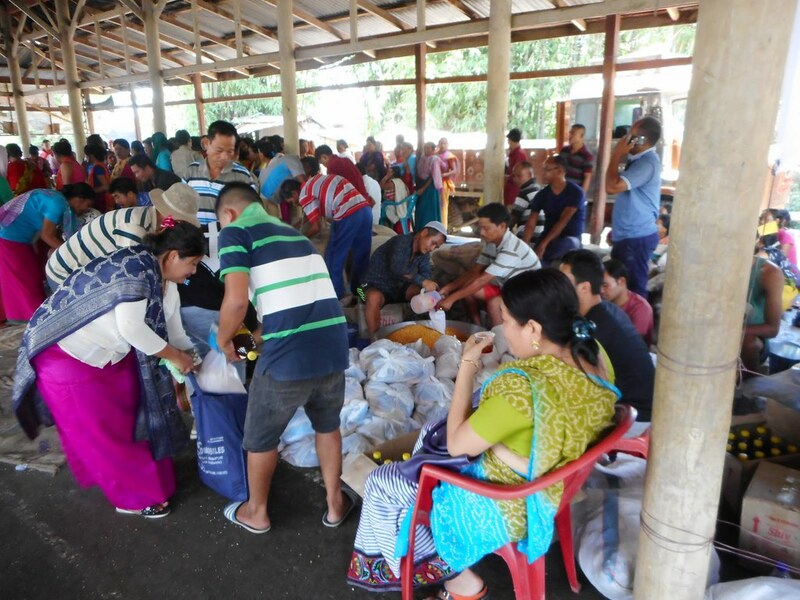 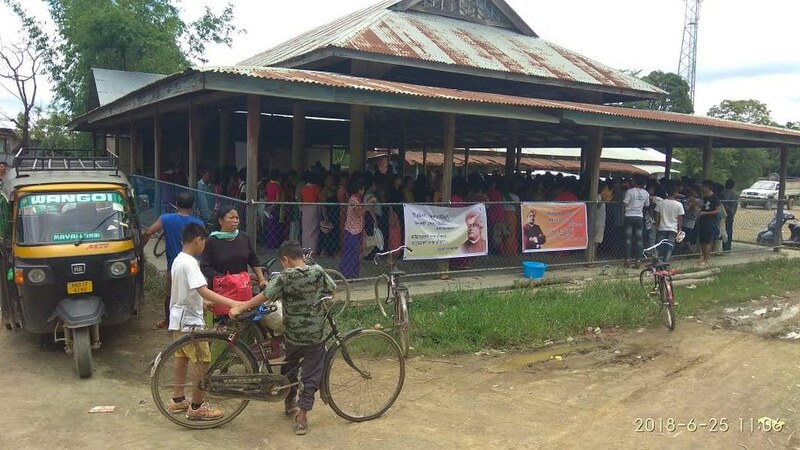 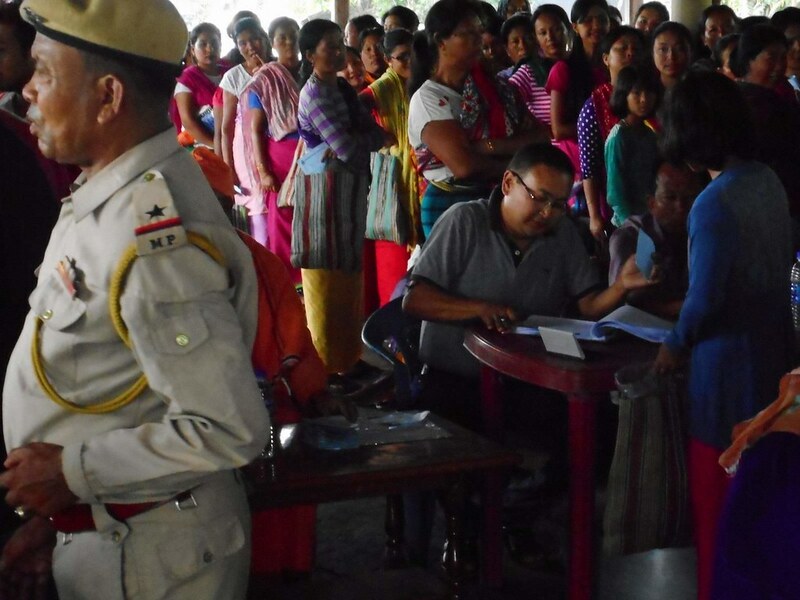 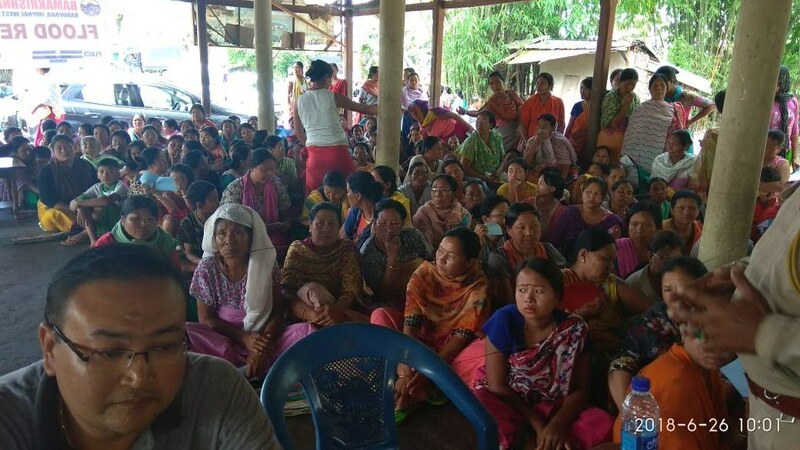 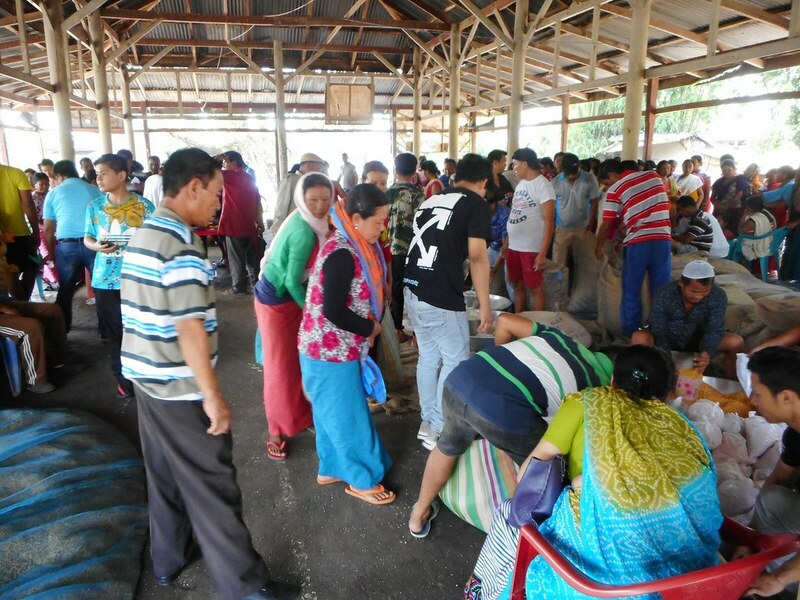 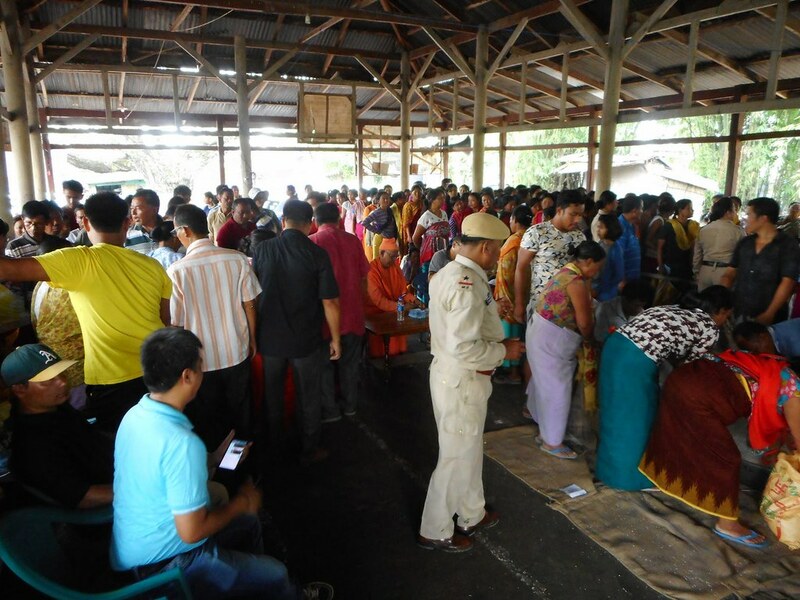 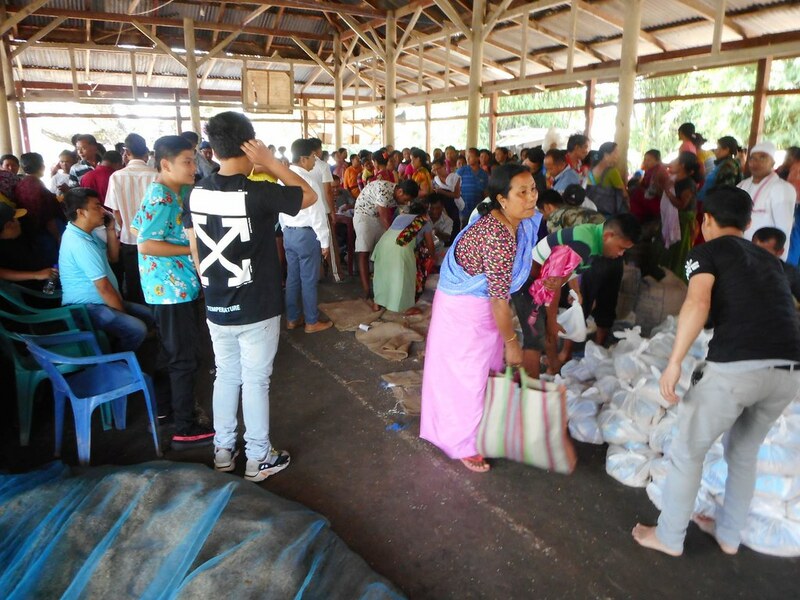 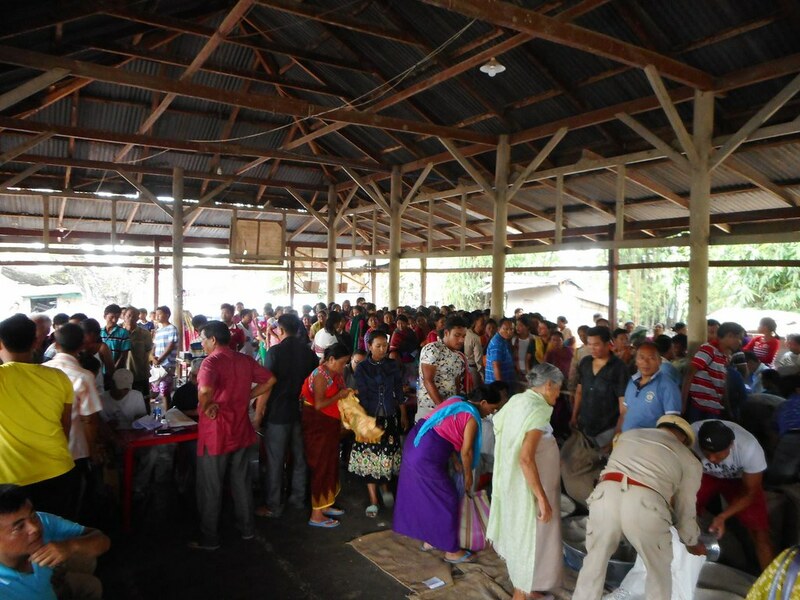 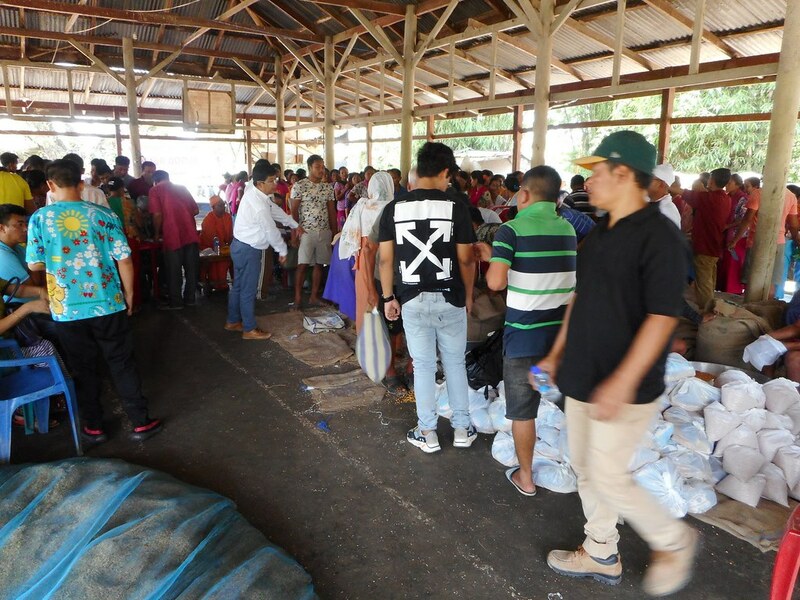 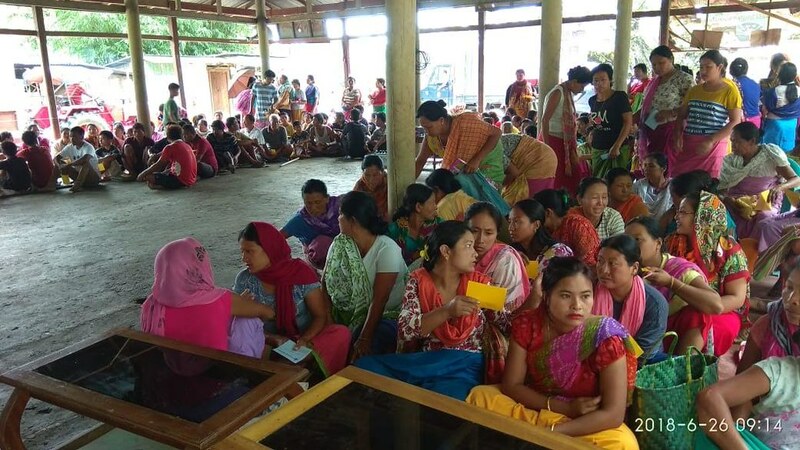 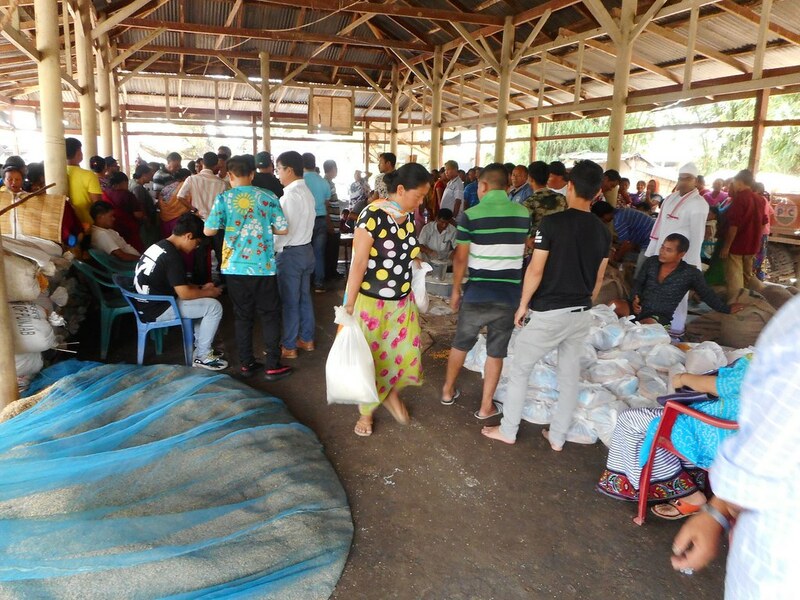 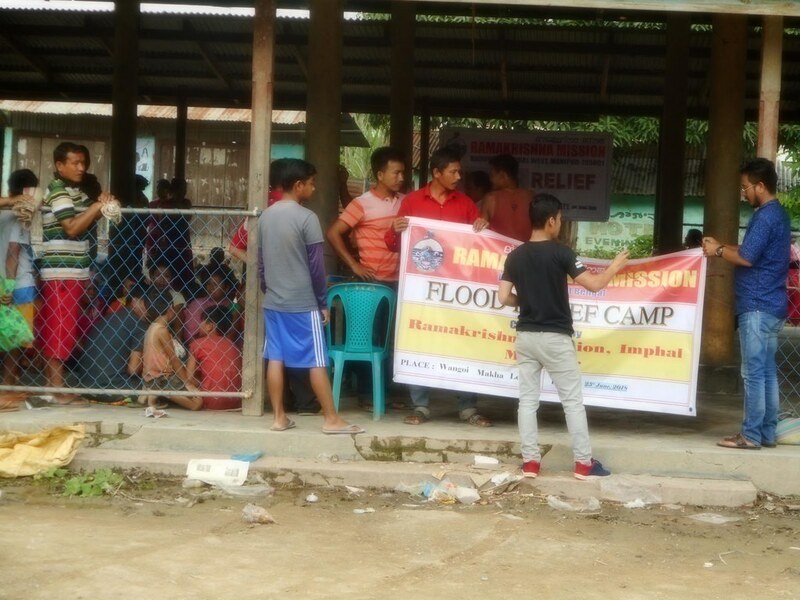 Our Imphal centre organised primary relief camps on 25 and 26 June, 2018 for the flood affected families of 6 localities (Wangoi Makha Leikai, Wangmei Kabui, Longjam Leikai, Wahengbam Leikai, Thounaojam Leikai and Thoudam Leikai) under Wangoi Sub-Division in Imphal West district. 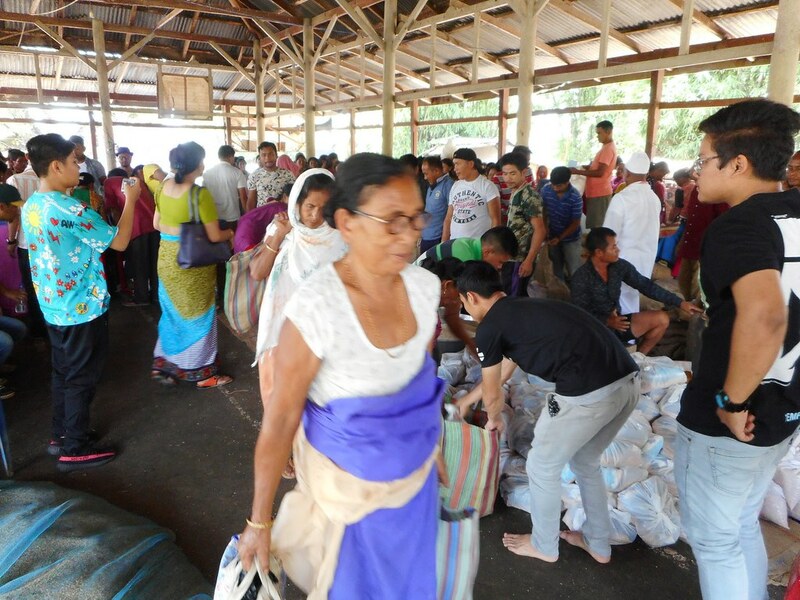 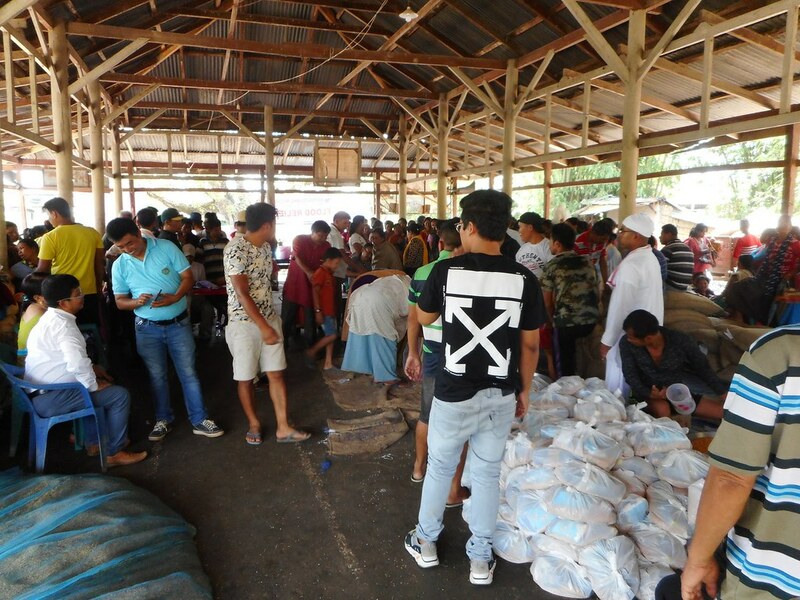 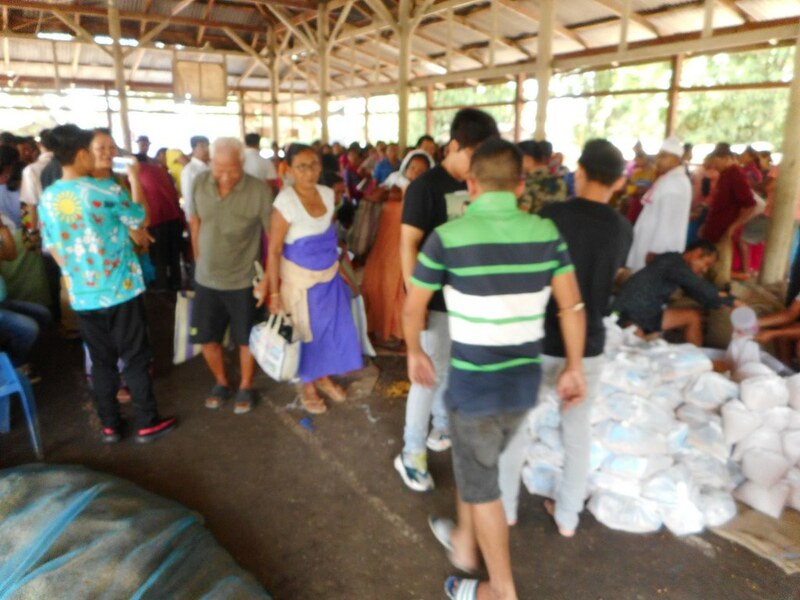 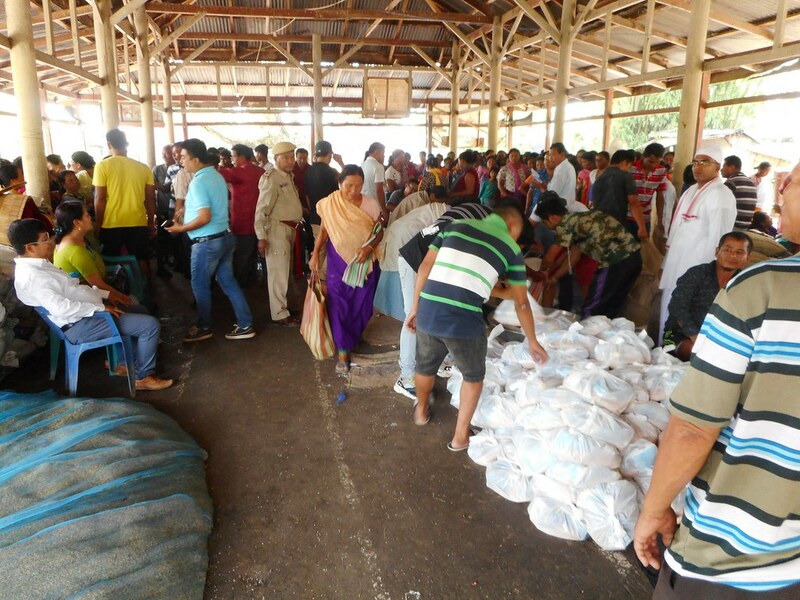 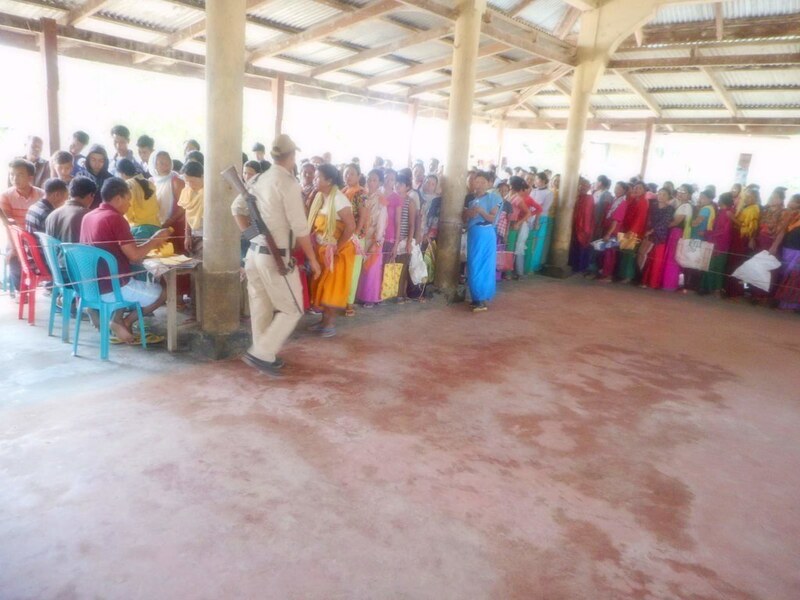 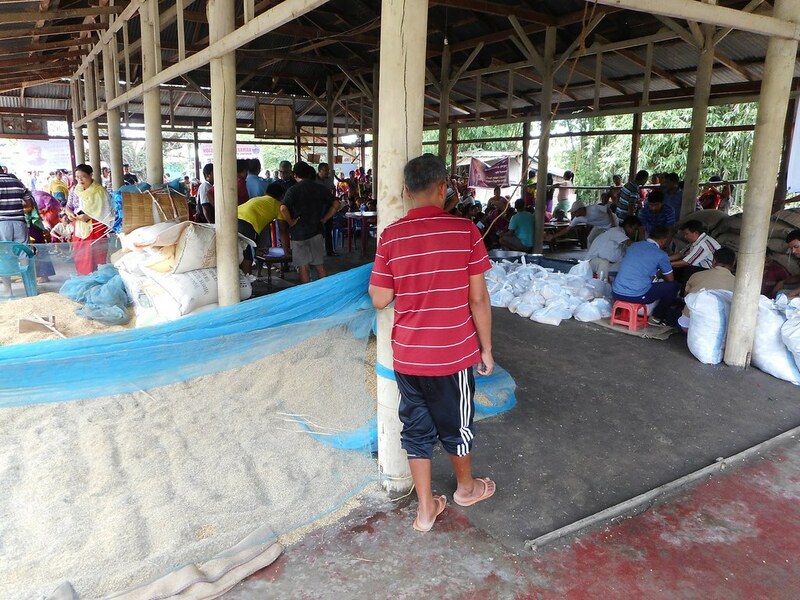 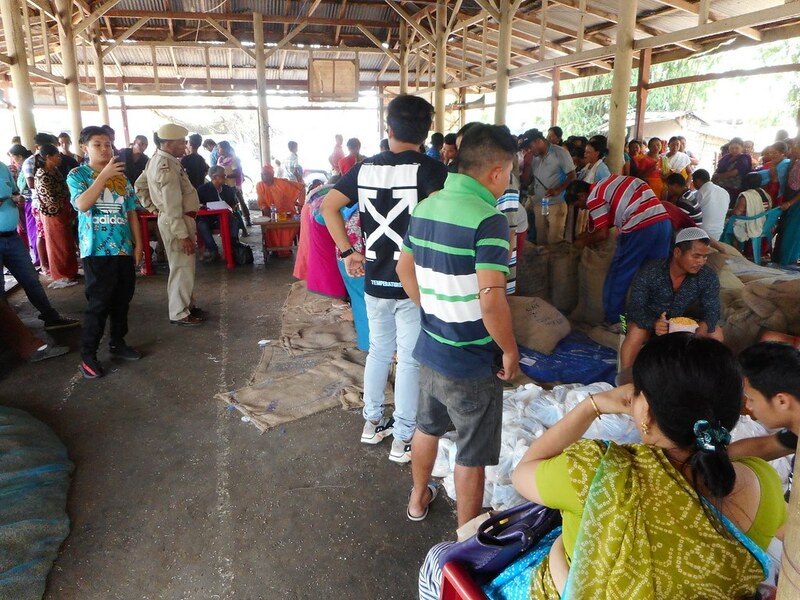 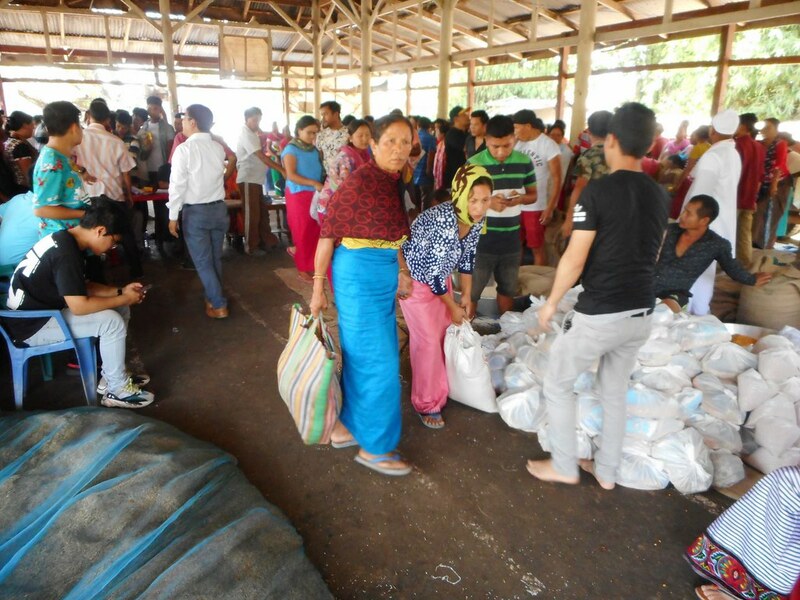 In all 1070 affected families each were provided with the food ration packets, consisting of Rice 10 Kgs, Dal 2 Kgs, Edible Oil 1 lts, Salt 1 Kg & 1 pkt Ngari (fermented fish). 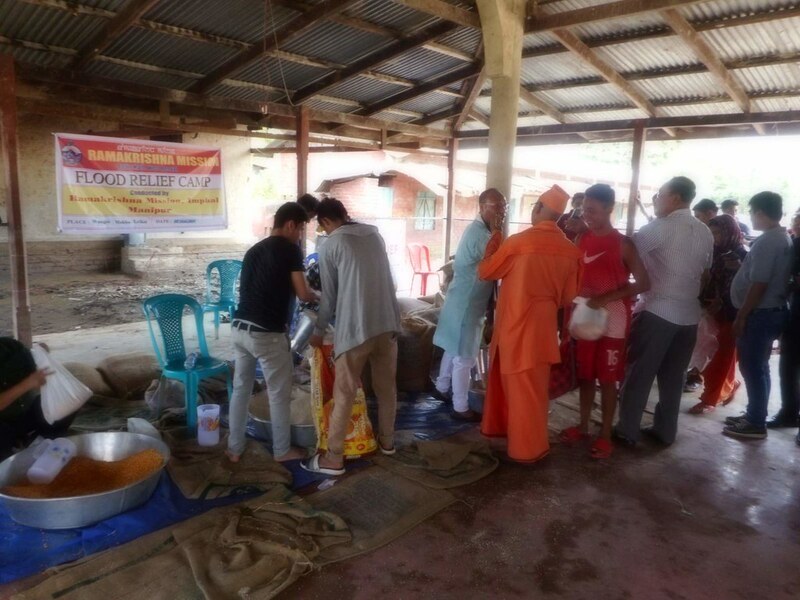 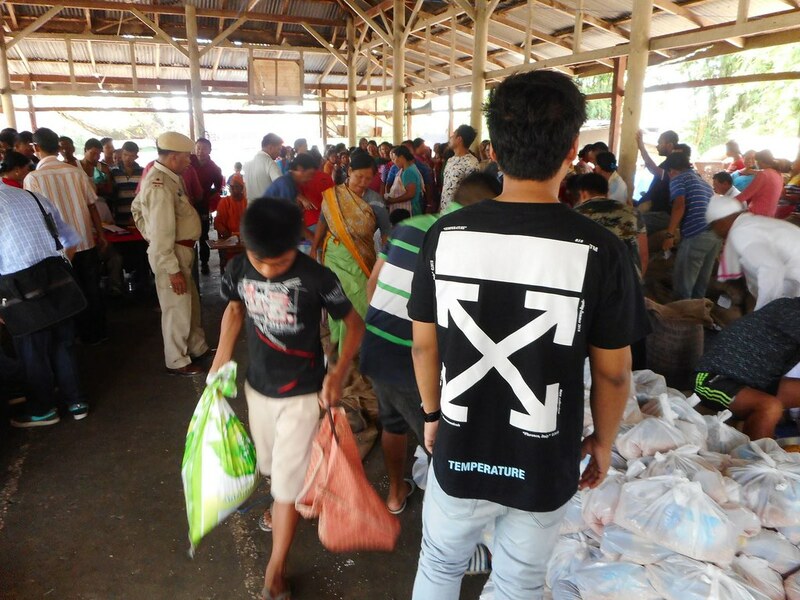 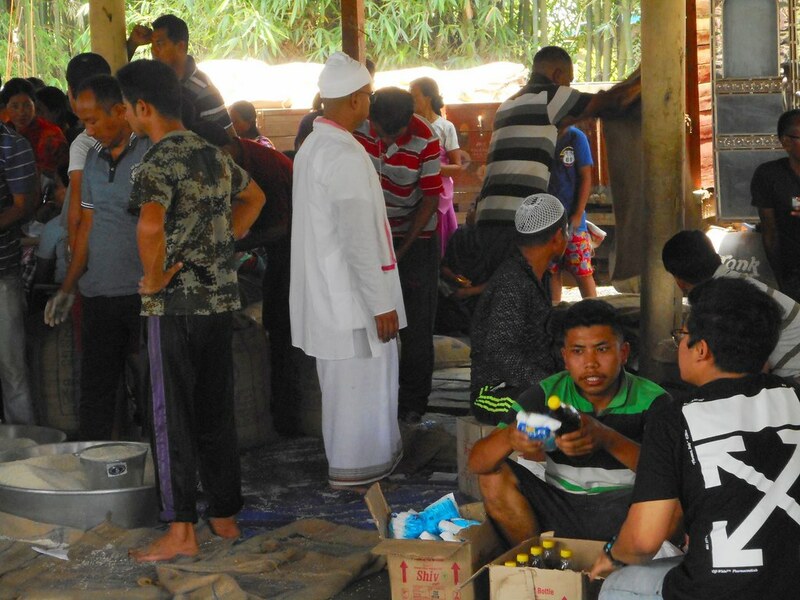 On both the days our monastic brothers accompanied by the President of the Imphal centre’s Managing Committee along with other committee members went to conduct the relief camps. 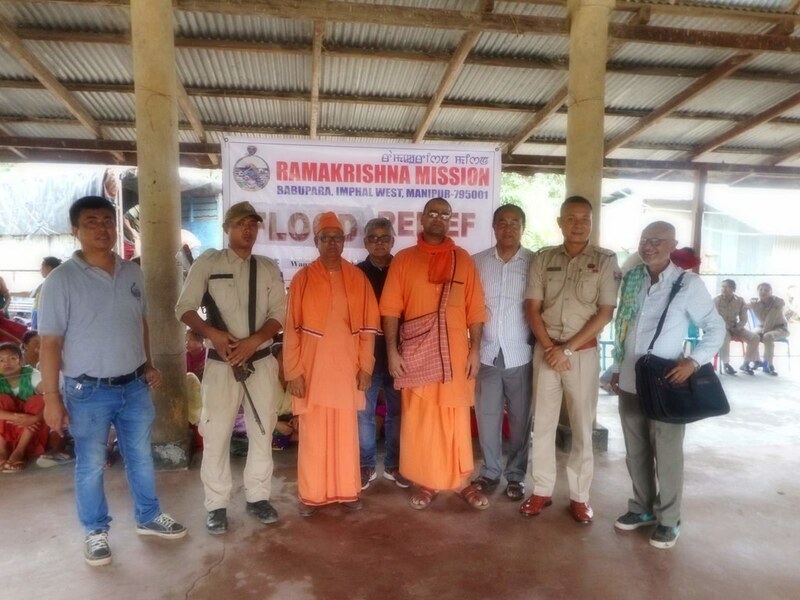 Also on both the days, a team of police was present which proved to be very helpful in managing the crowd and peacefully conducting the relief. 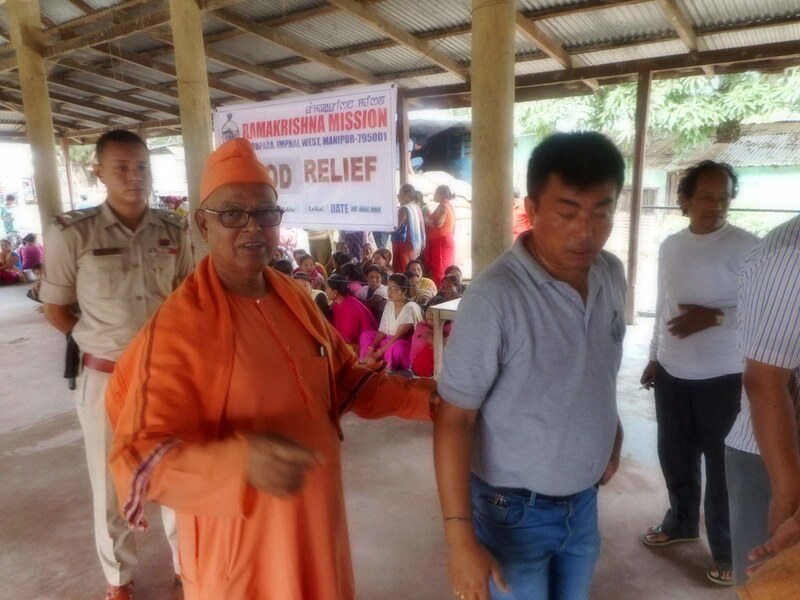 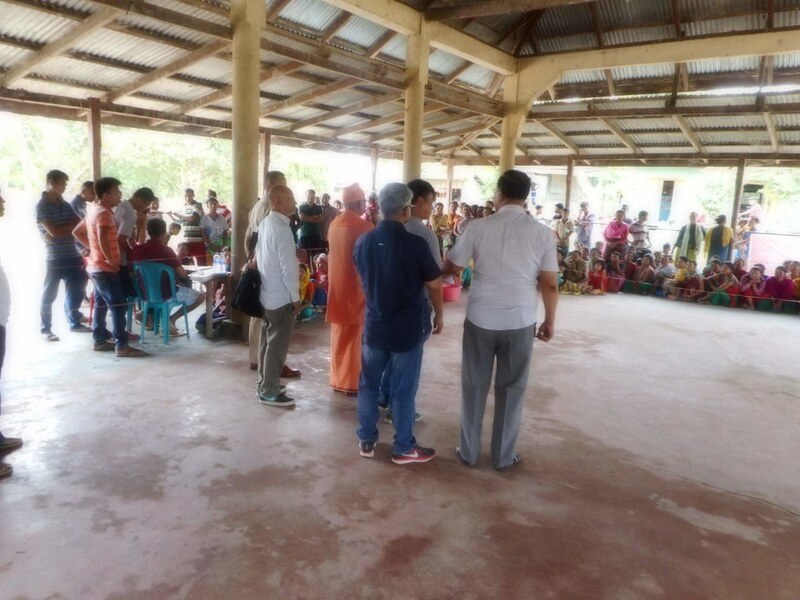 In the wake of the relief efforts Imphal centre received help and appreciation from the locals and they all admired the systematic and organized way of the Ramakrishna Mission in conducting this relief work. 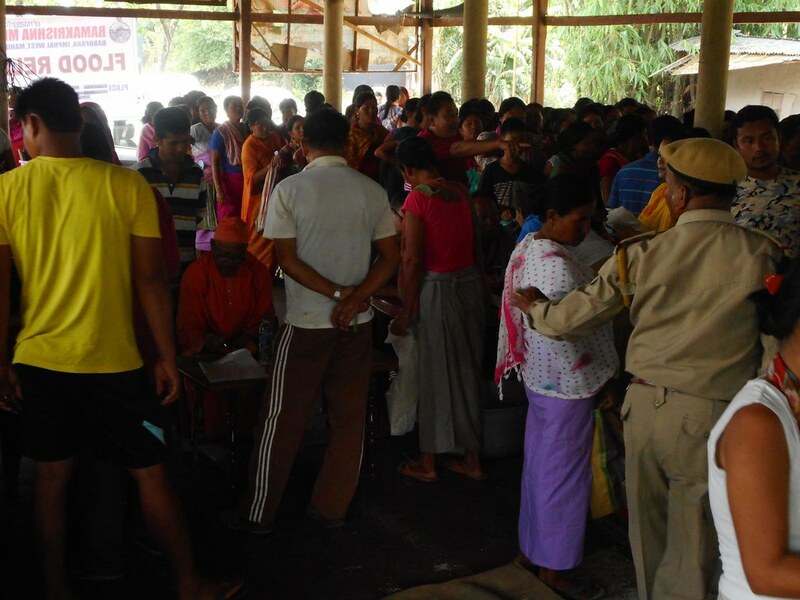 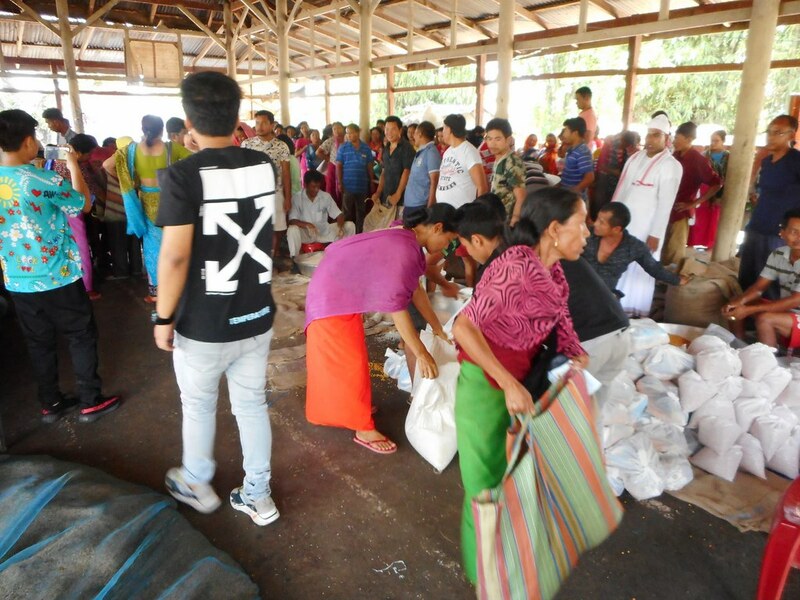 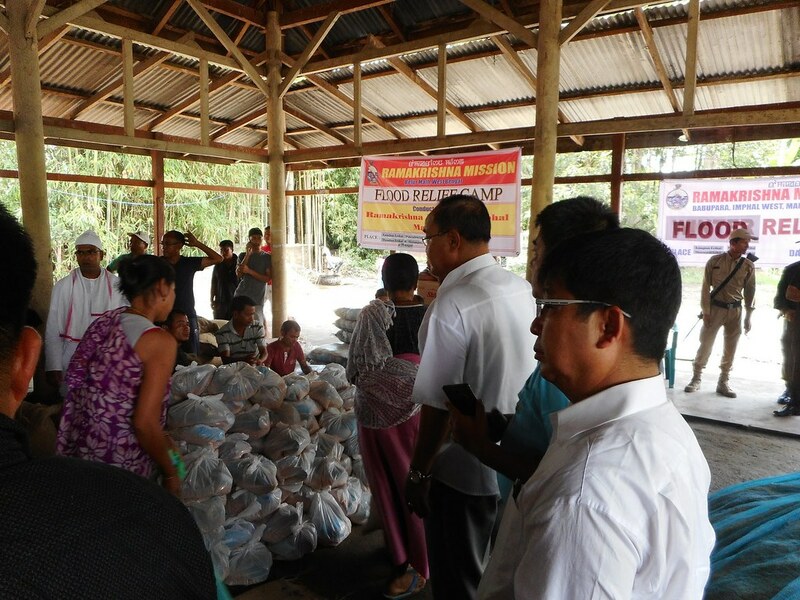 The local people helped the relief team in surveying and in distribution of beneficiary cards. 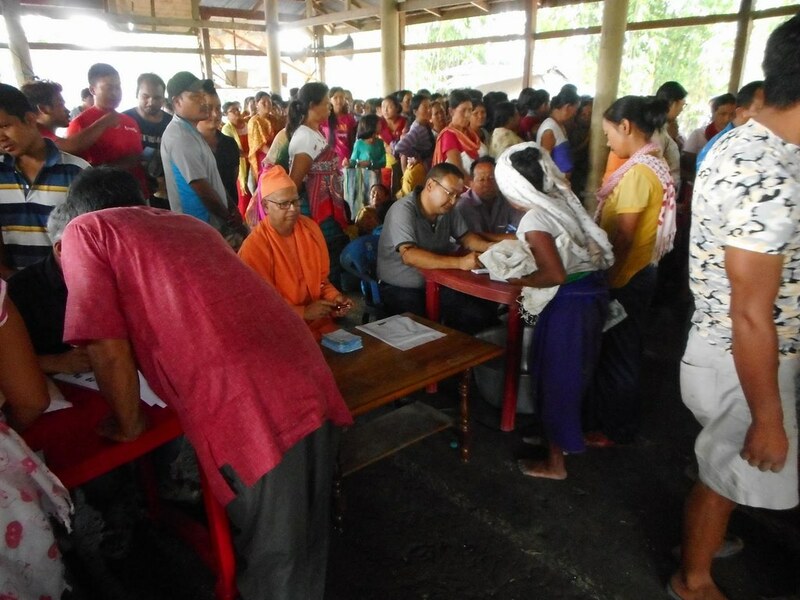 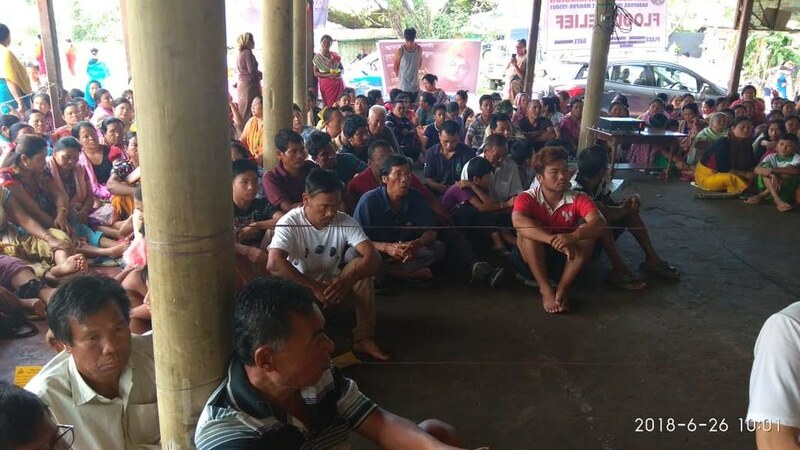 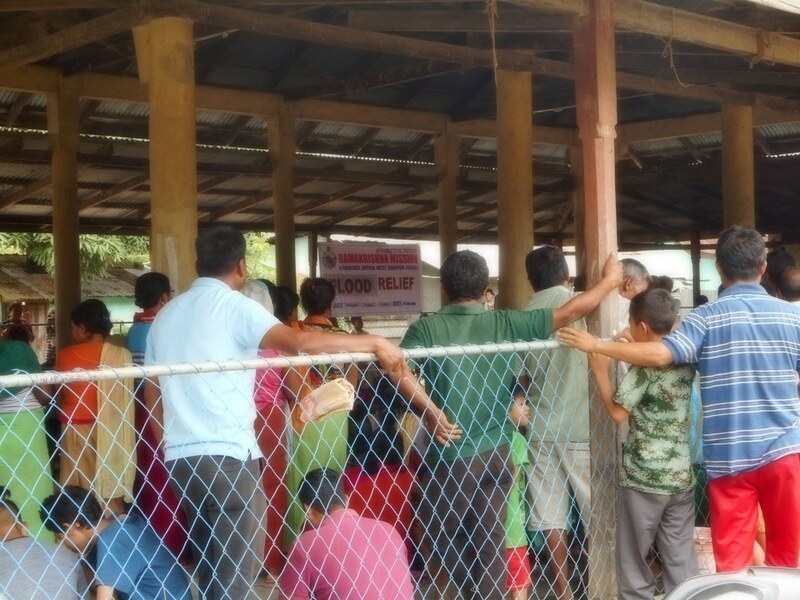 The local representatives told us that this system of identifying the beneficiaries by way of distributing cards and maintaining muster roll is very effective as it greatly helped them also to ensure that all the recipients are genuine and that none of the affected families are left out. 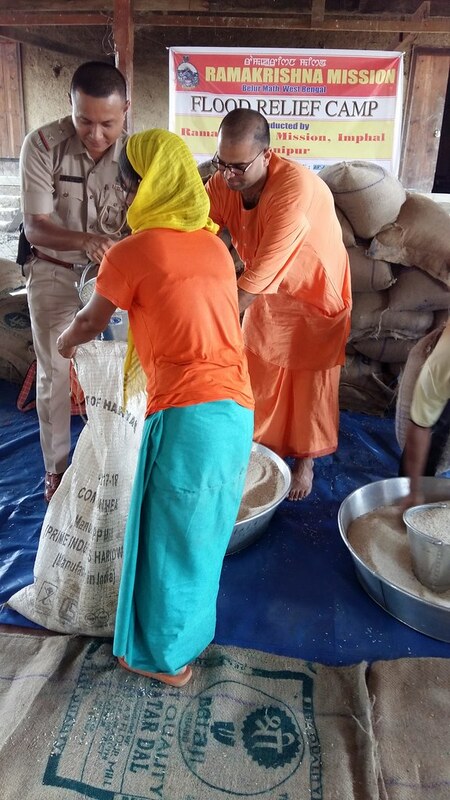 Also, they were very happy that substantial quantity of ration has been provided. 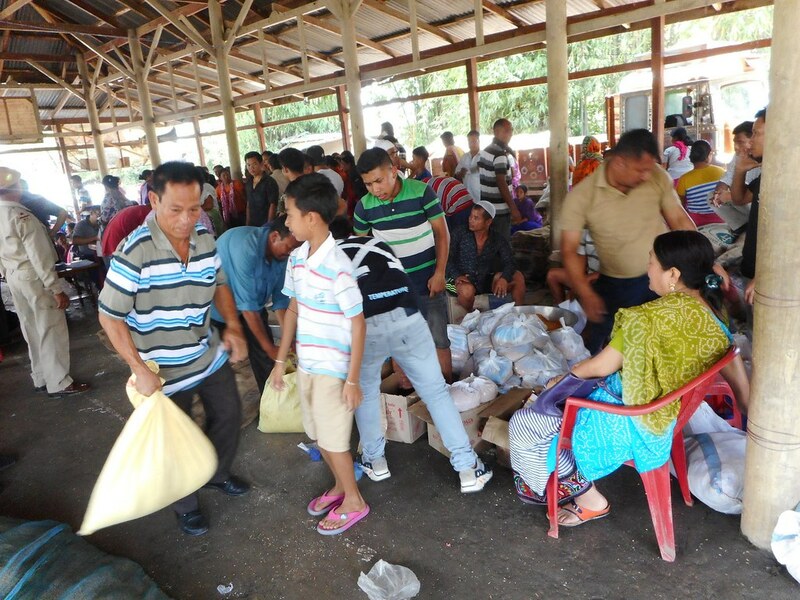 More requests started pouring in to conduct relief camps at other affected areas. 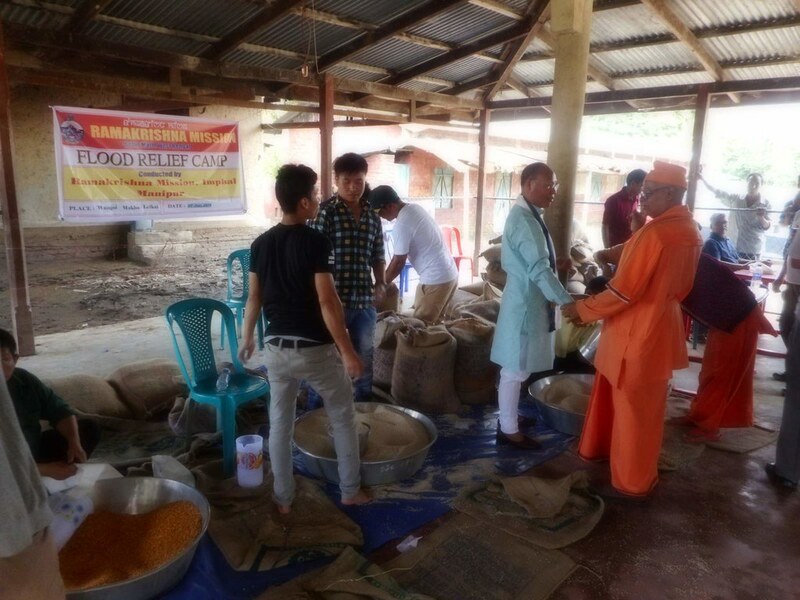 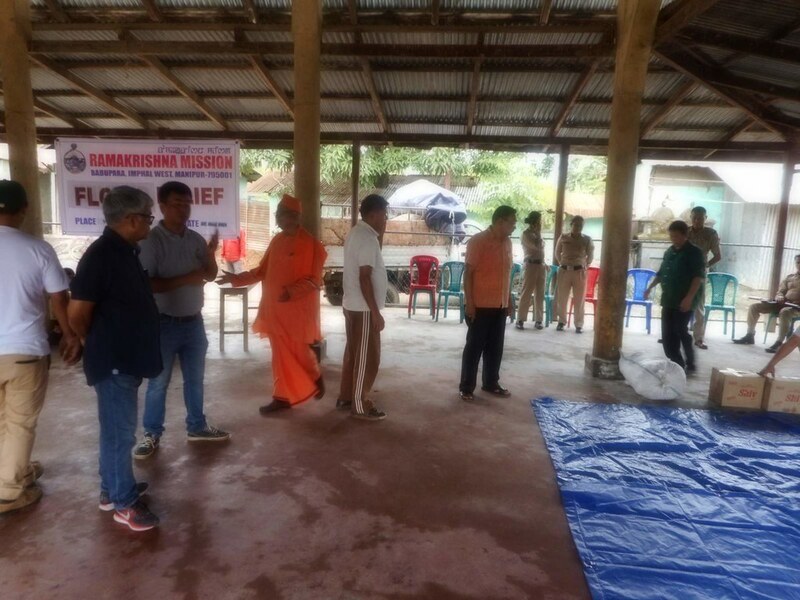 Ex-students of Ramakrishna Mission and other management committee members of Imphal centre very enthusiastically participated in the noble work of relief, and helped in conducting the relief camp in the interior villages of Imphal valley.